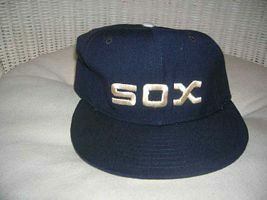 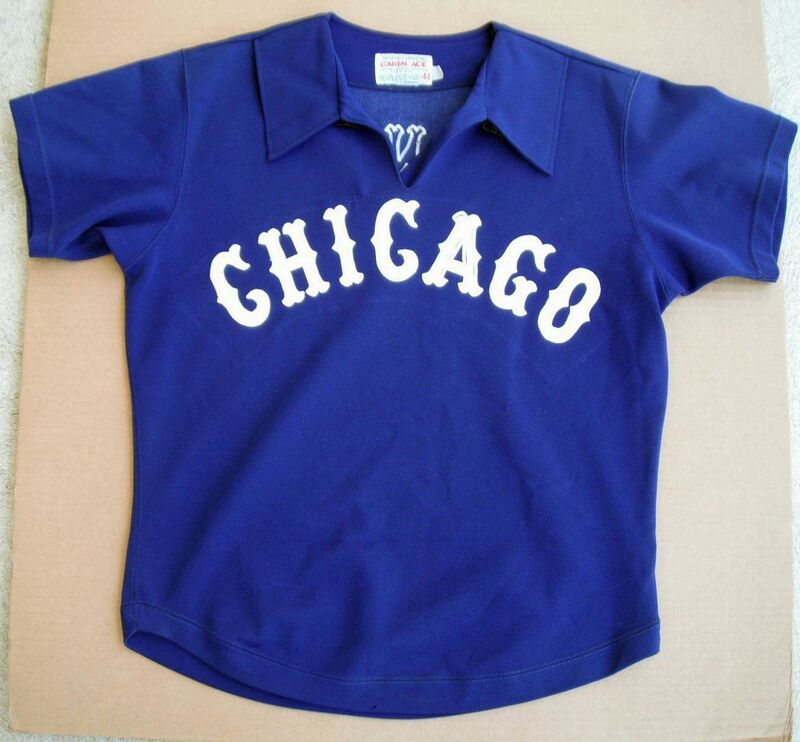 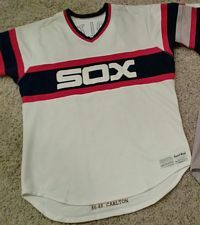 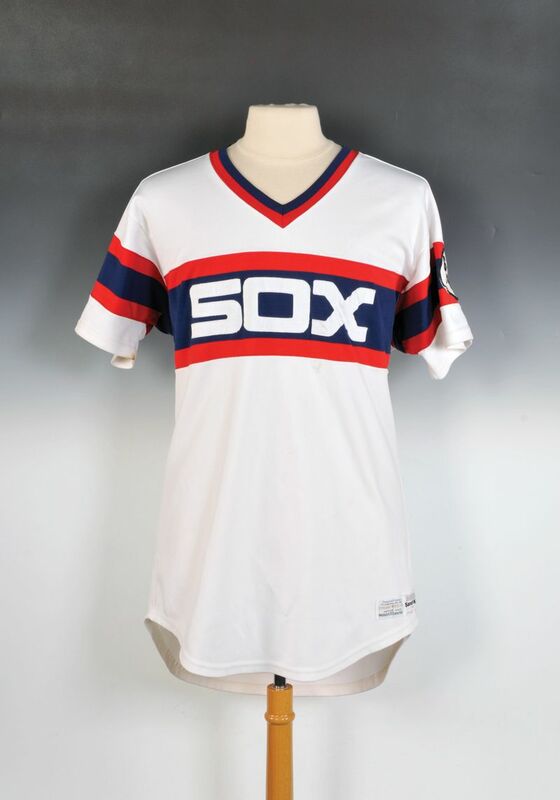 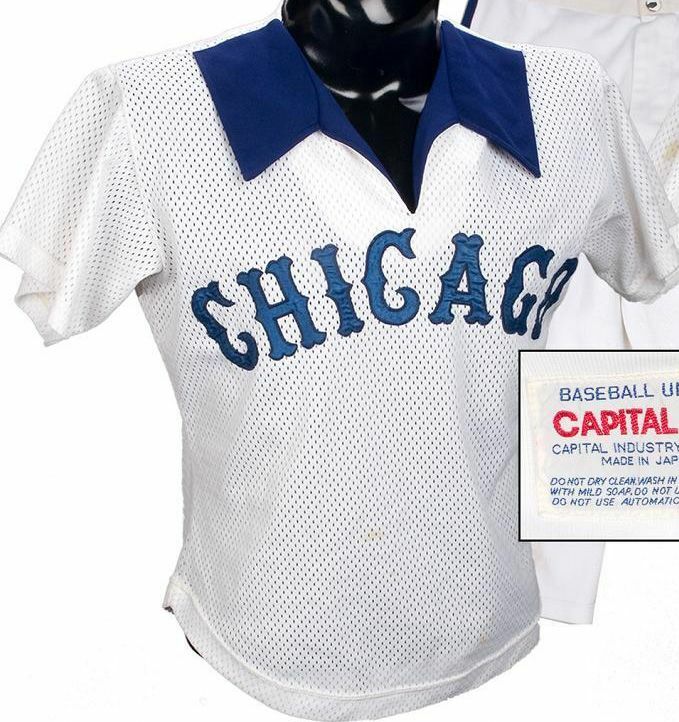 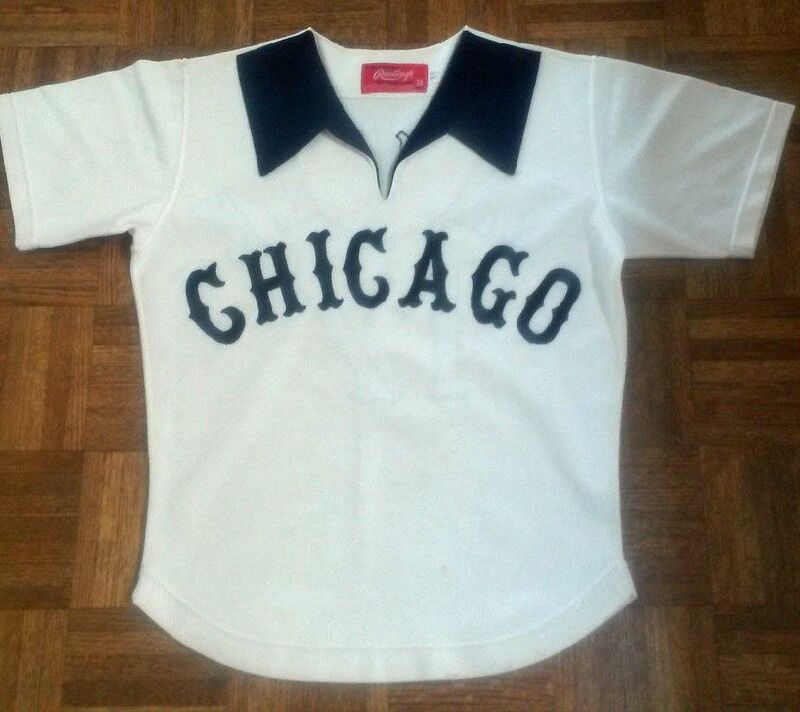 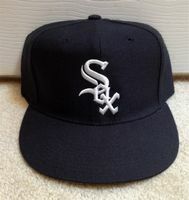 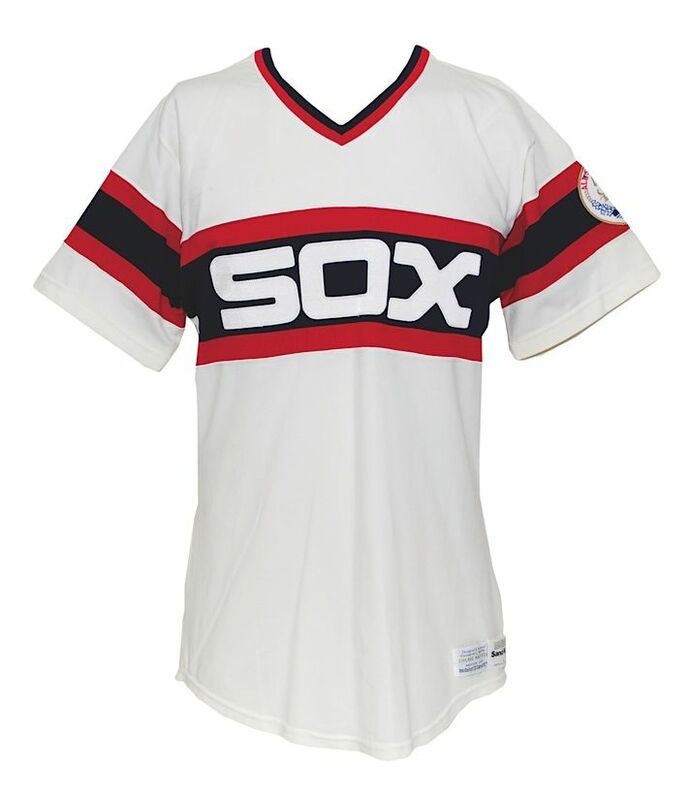 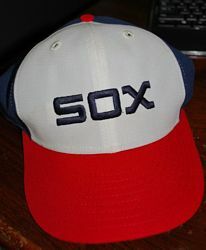 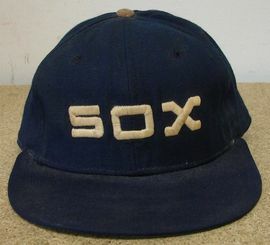 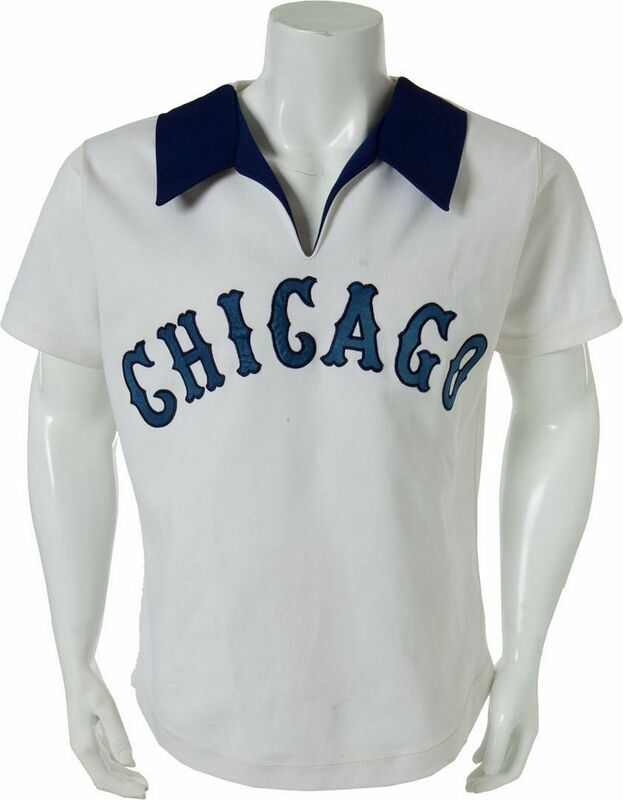 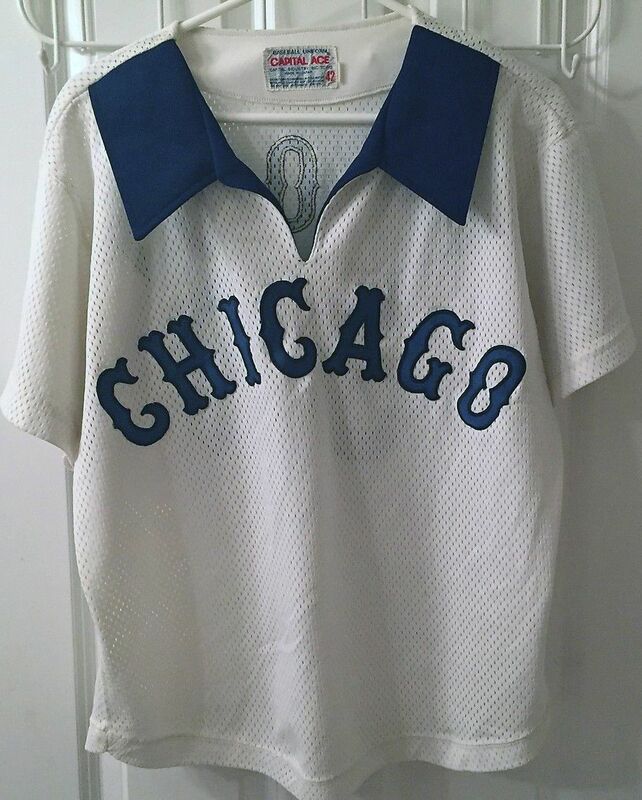 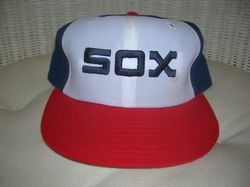 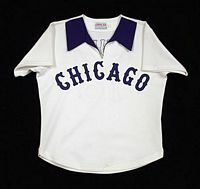 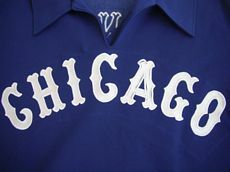 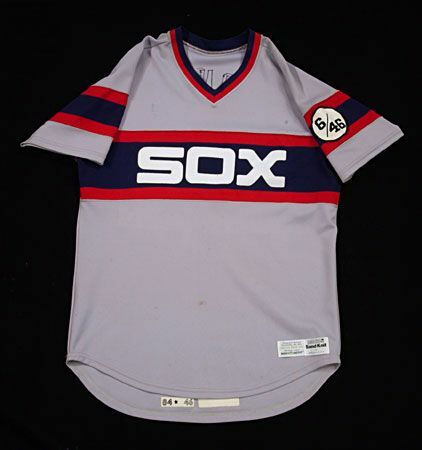 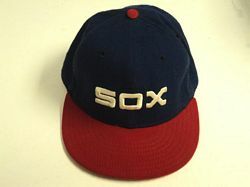 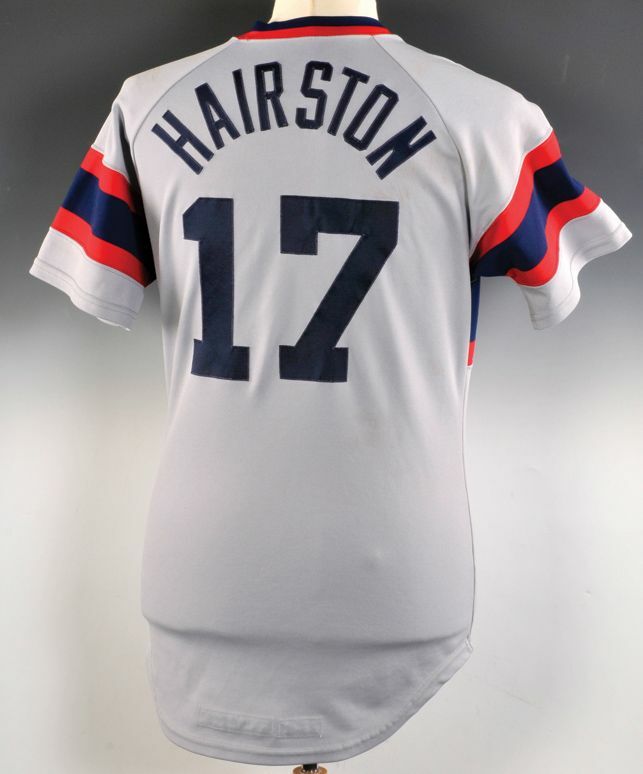 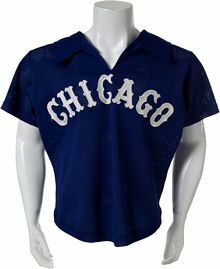 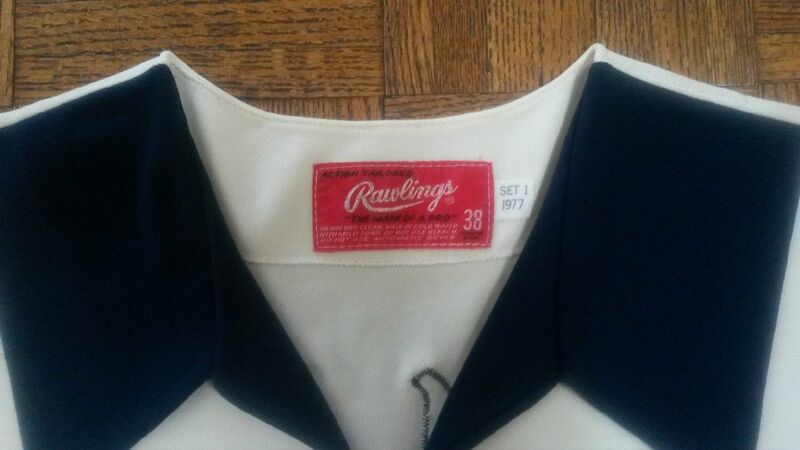 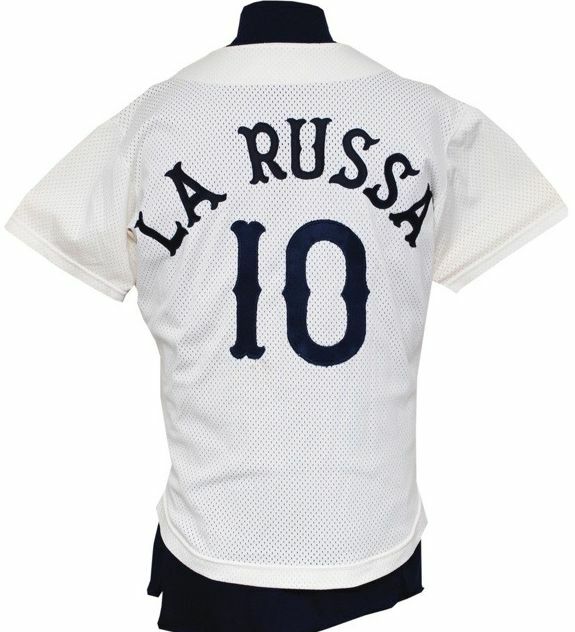 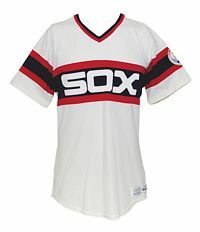 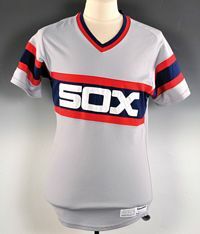 The Sox introduce a look based on their 1902-16 navy road style but with 1970's floppy disco collars. 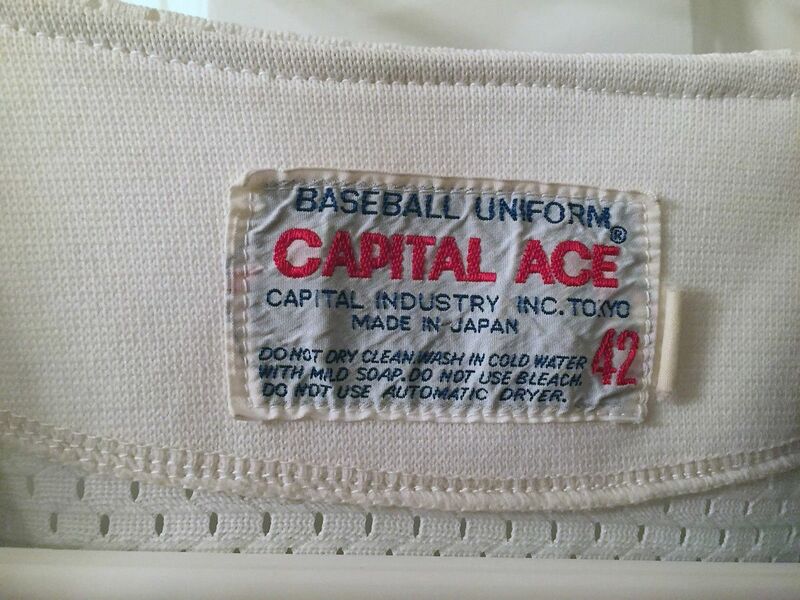 And, on occasion, shorts (with pockets to hold bandages for players' knees after sliding). 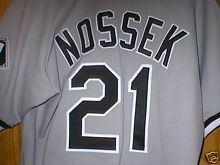 NOB return. 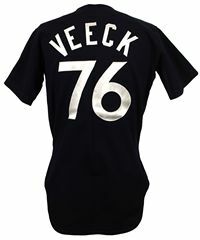 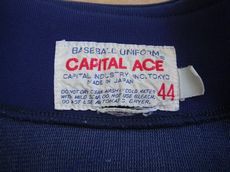 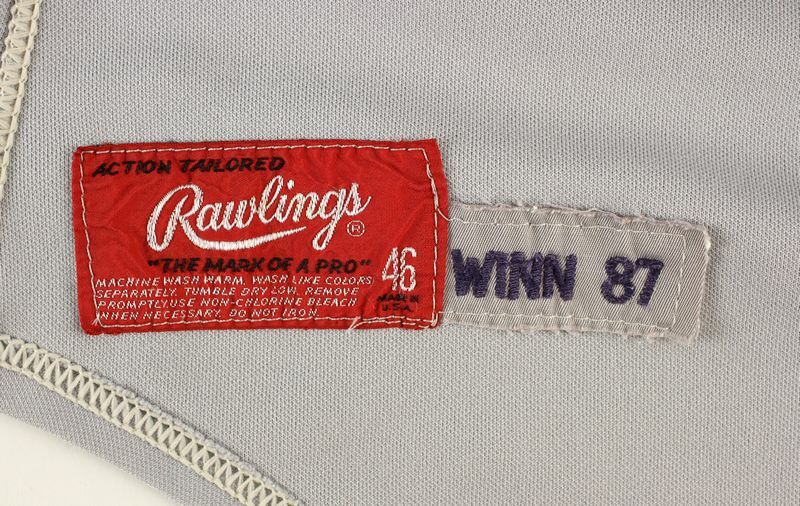 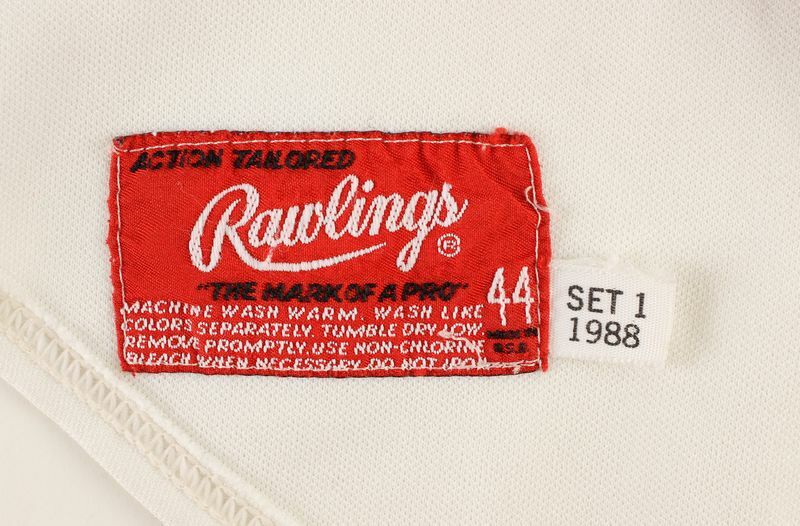 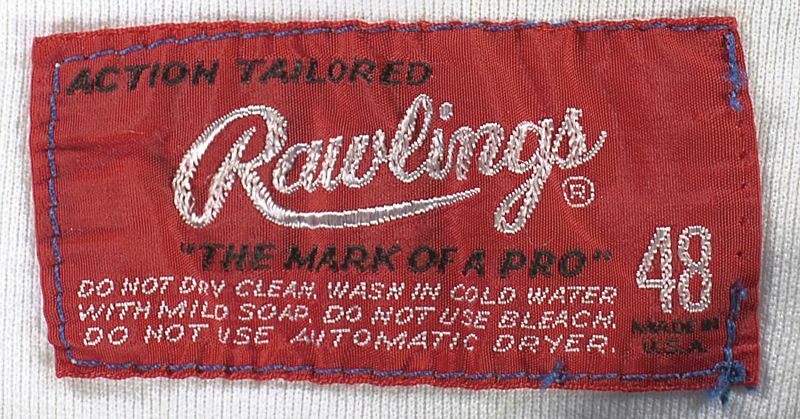 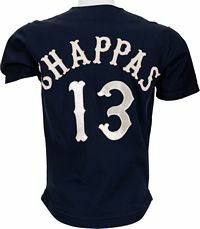 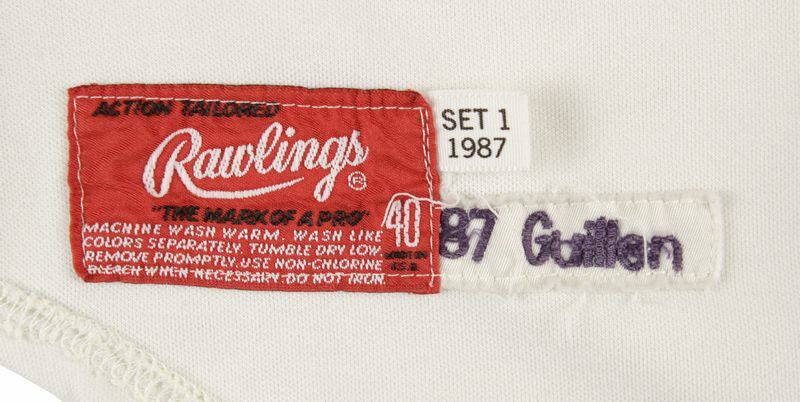 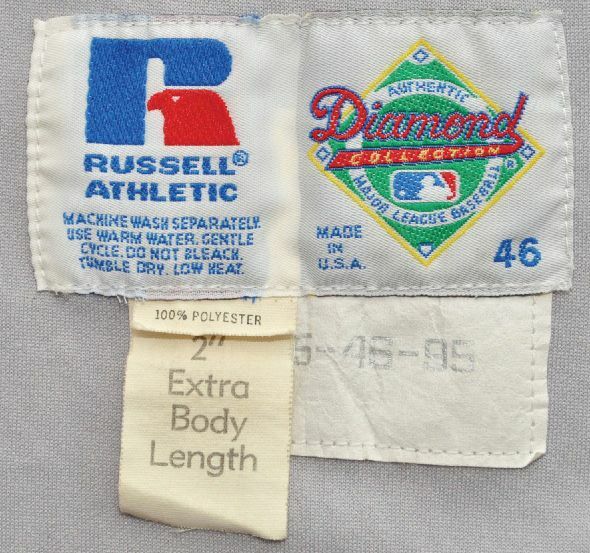 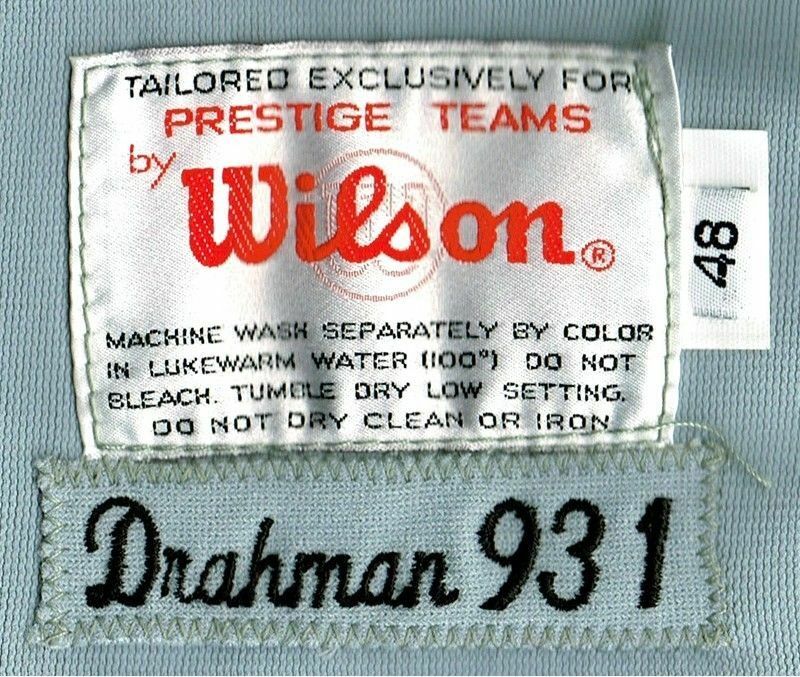 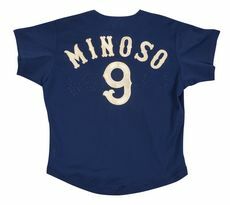 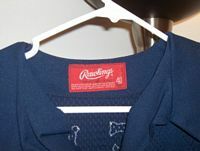 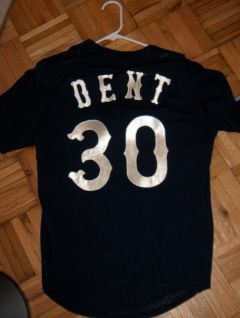 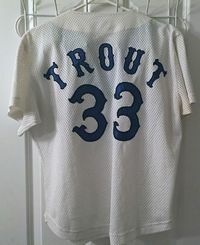 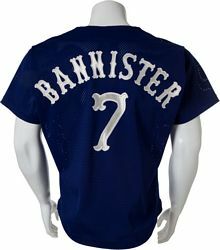 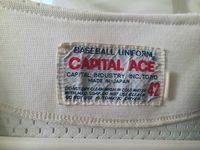 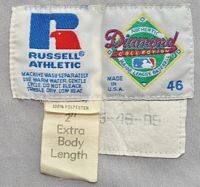 Mesh batting practice jerseys are identical to the game jerseys - and eventually are used regularly for hot afternoons. 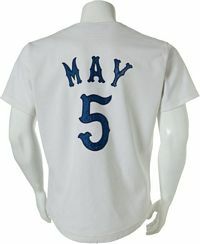 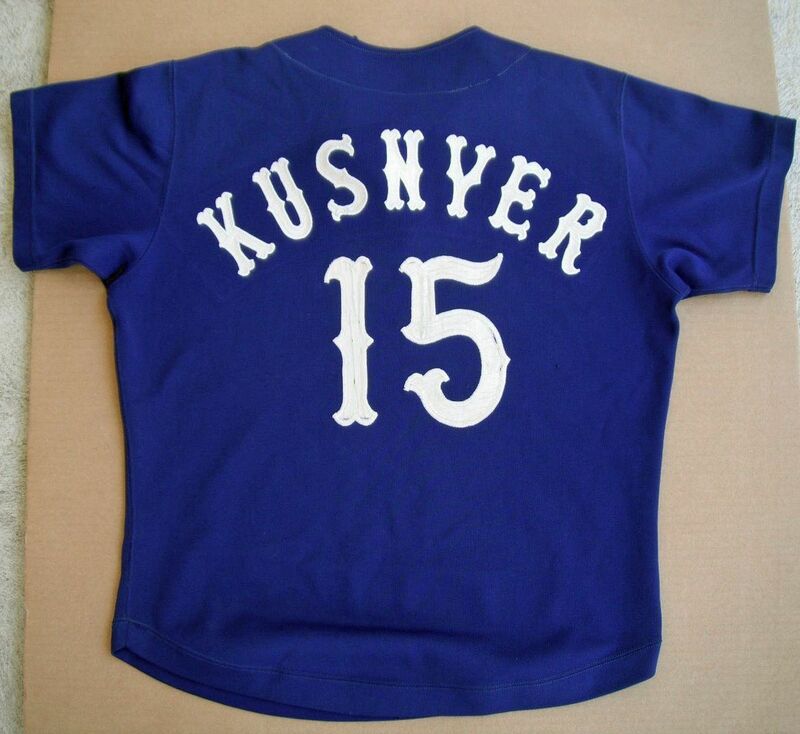 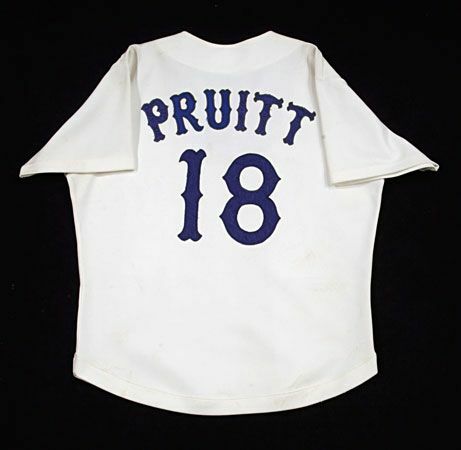 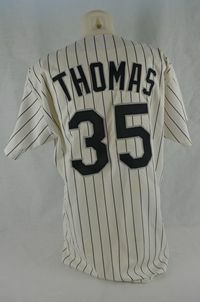 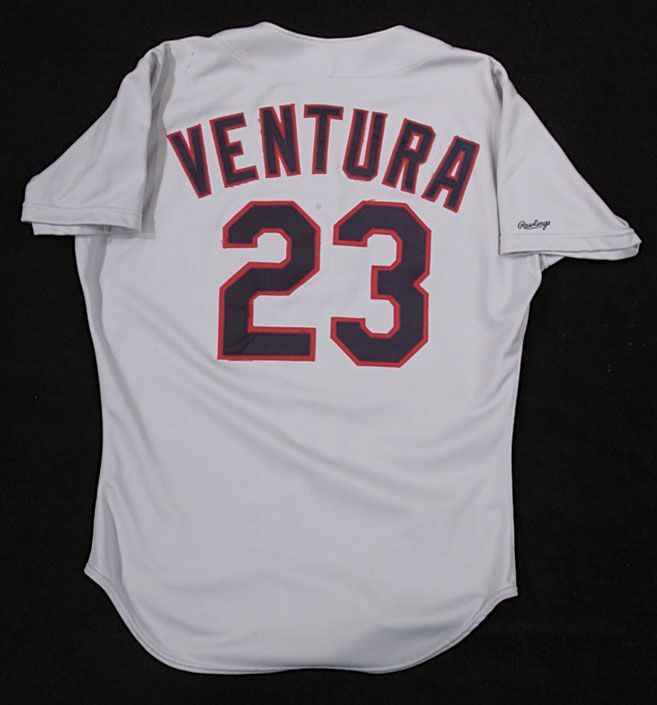 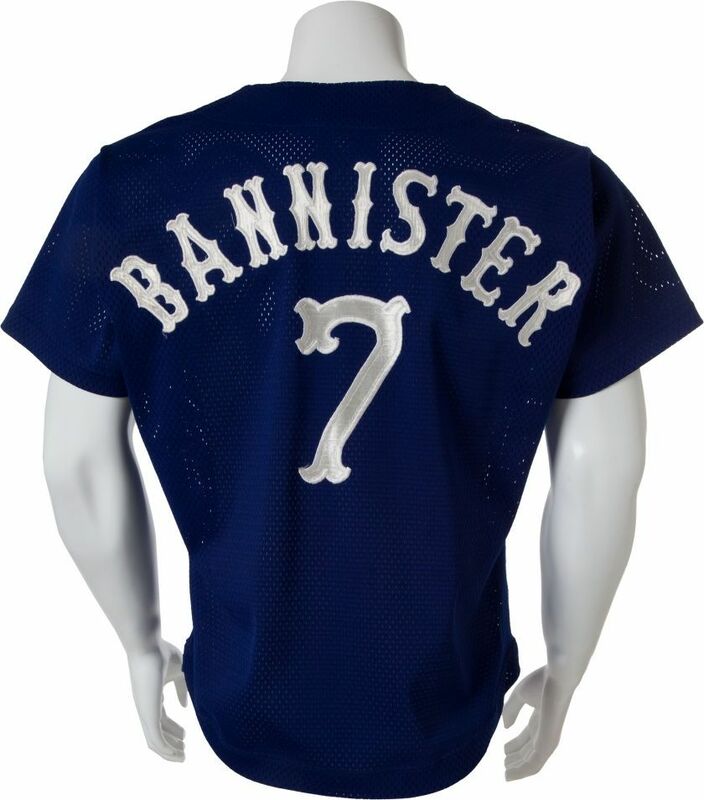 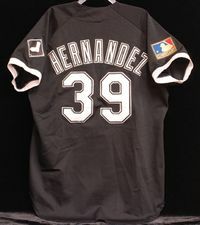 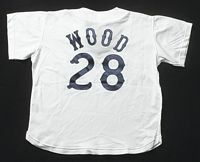 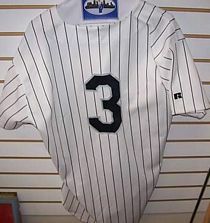 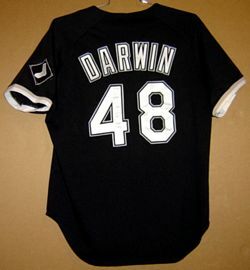 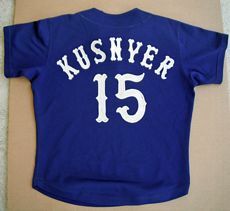 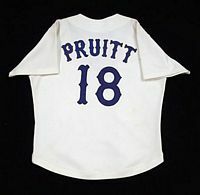 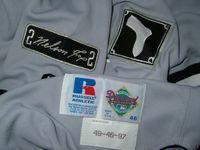 These jerseys were were highly reused over several seasons. 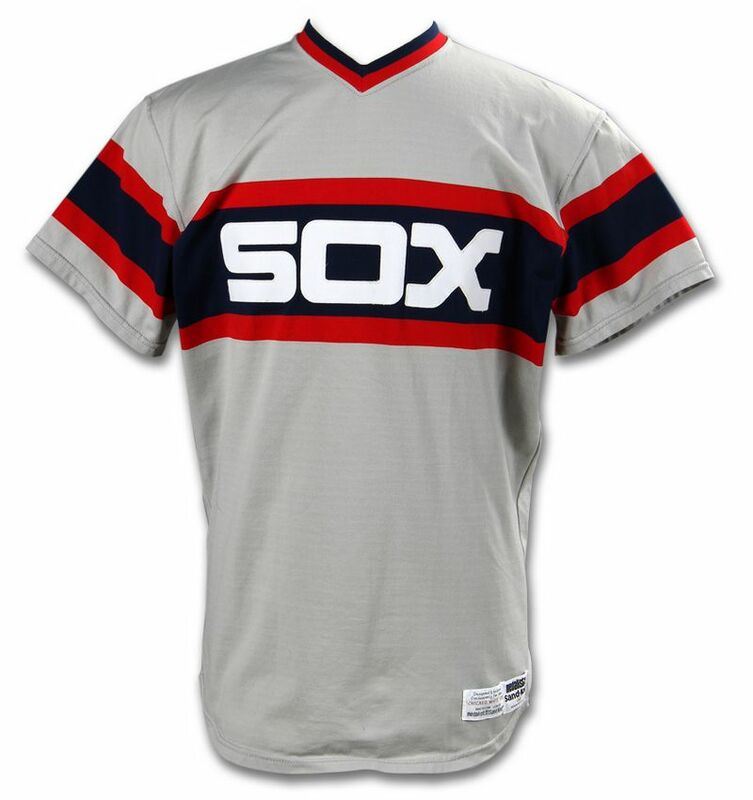 Another modern look, this one pulled from a fan contest. 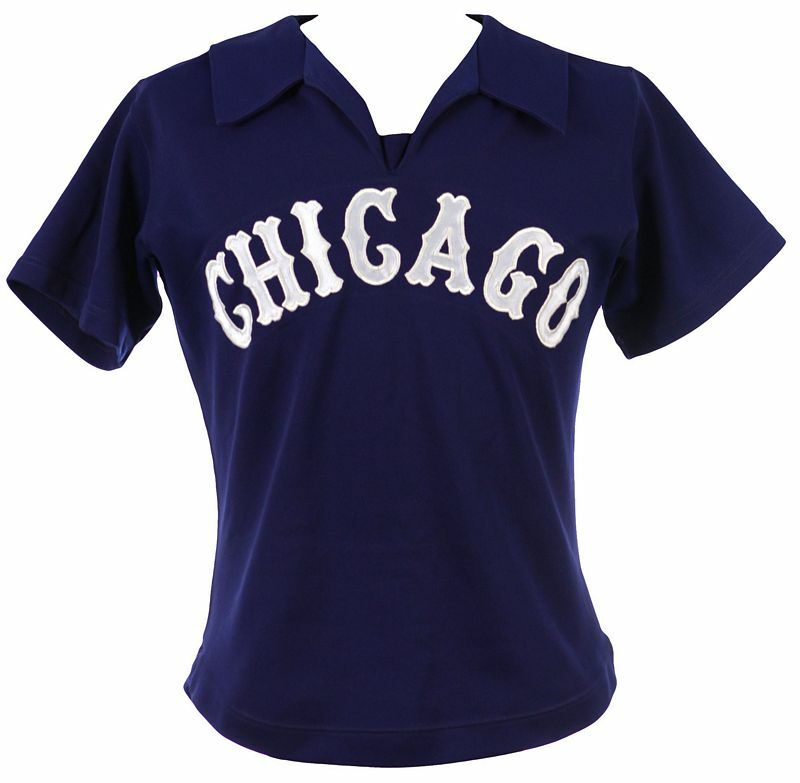 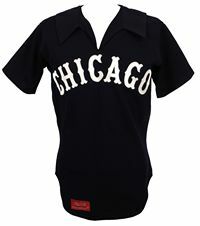 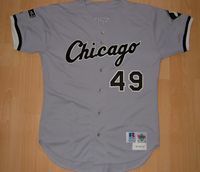 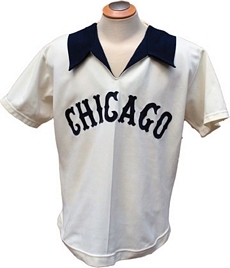 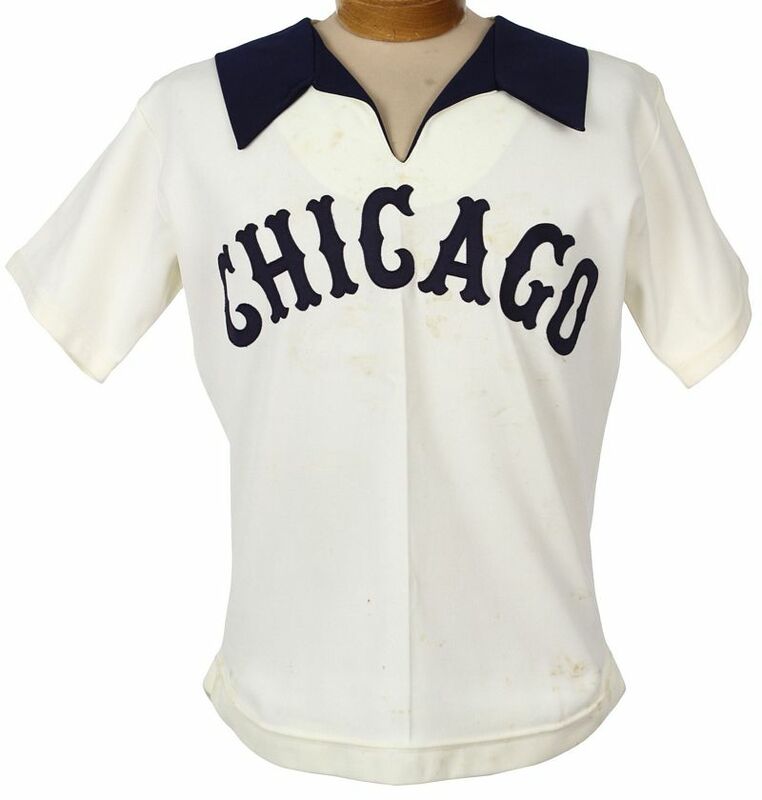 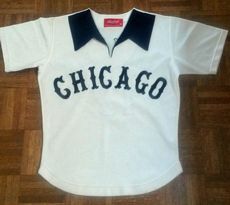 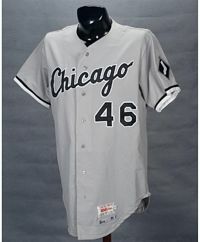 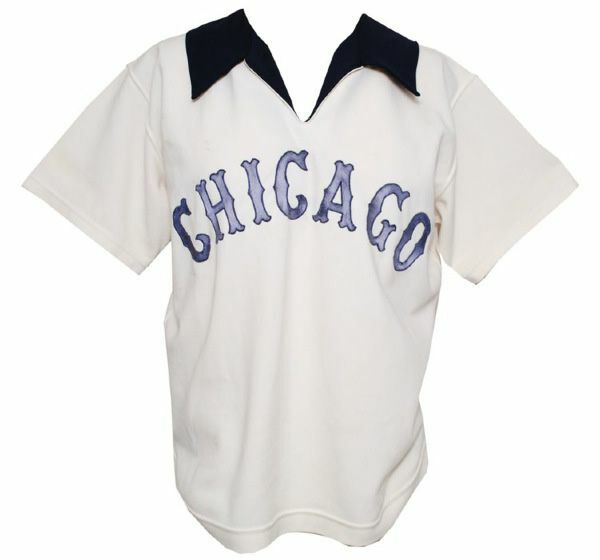 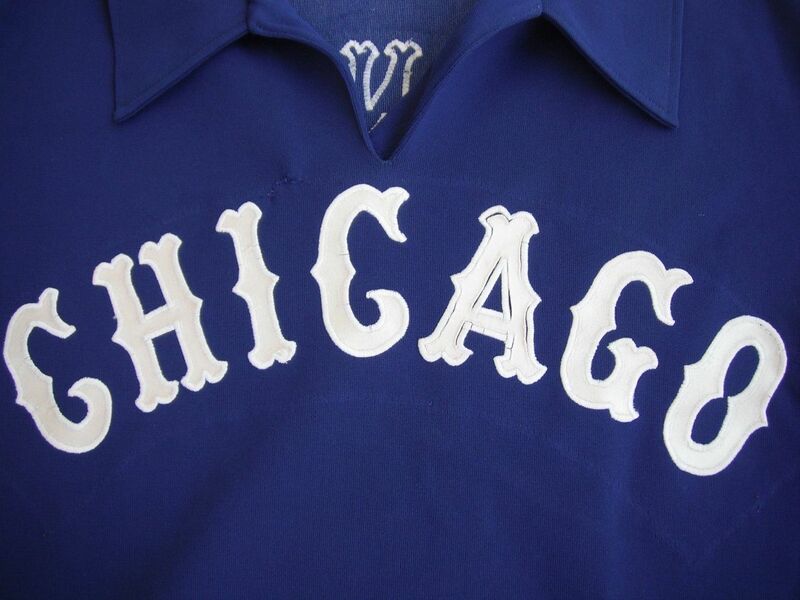 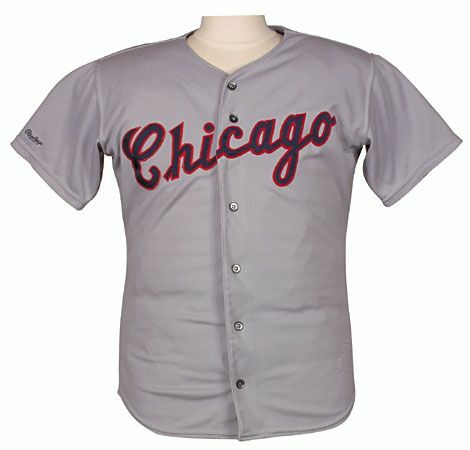 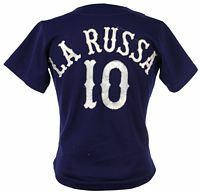 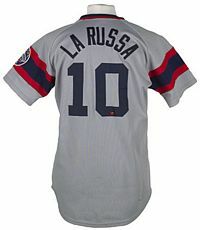 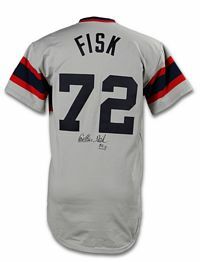 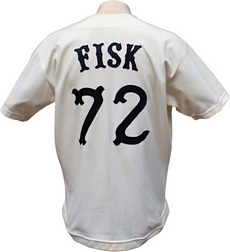 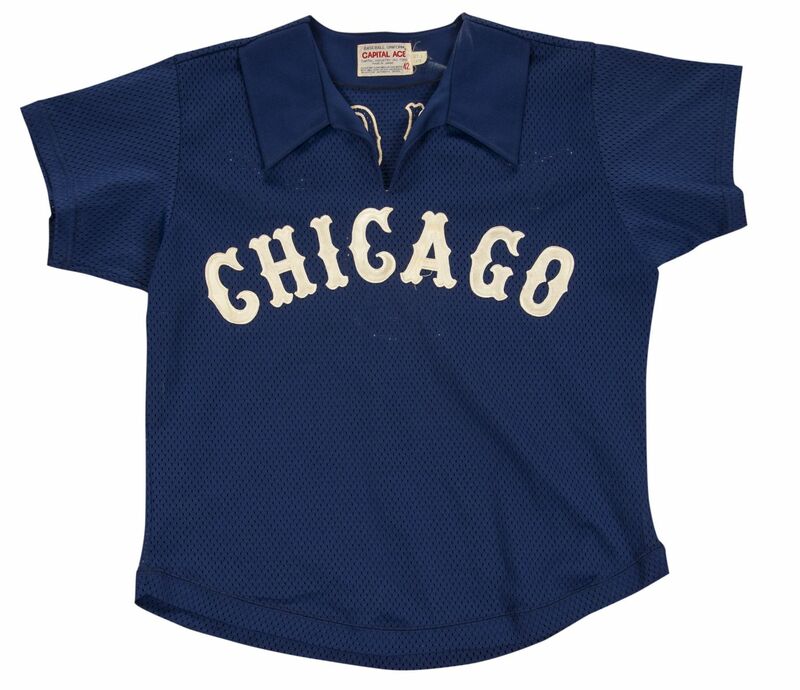 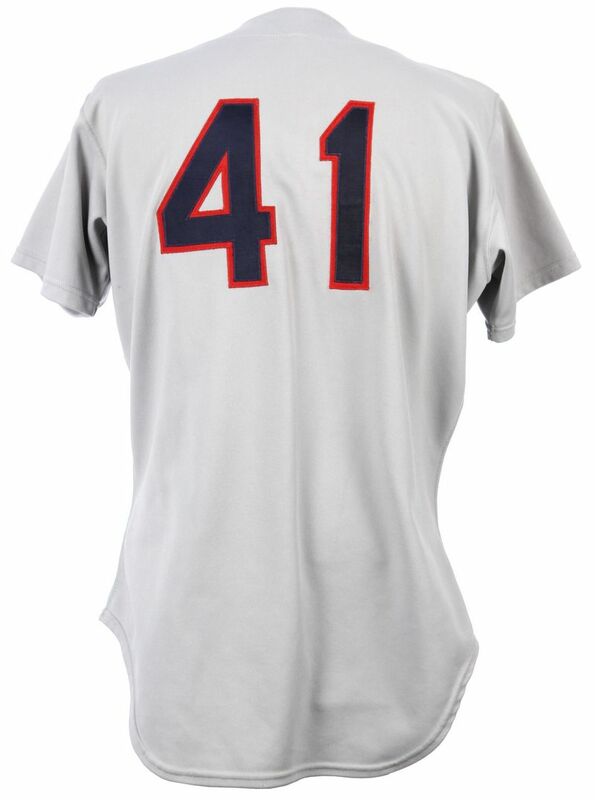 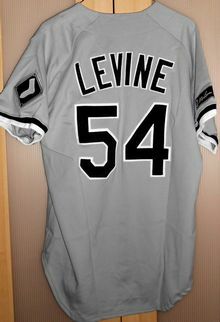 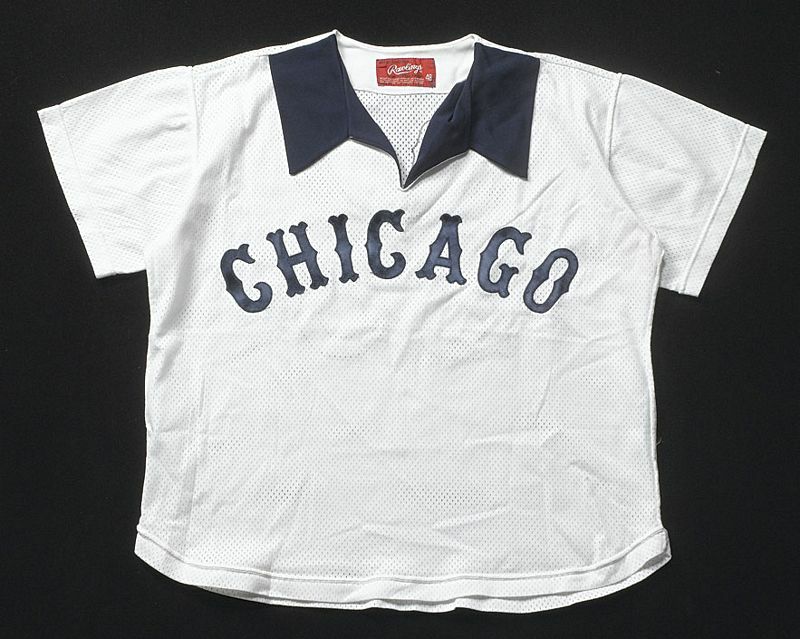 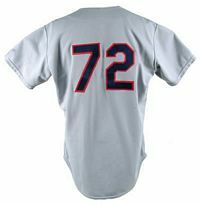 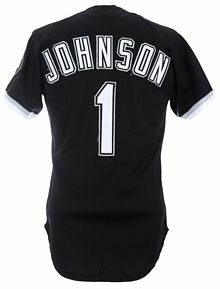 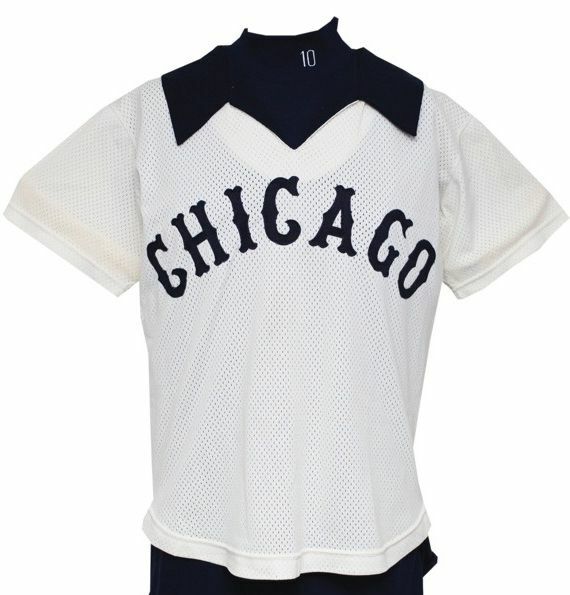 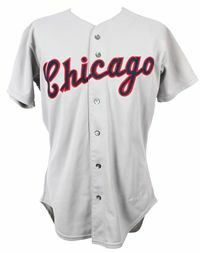 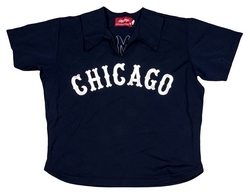 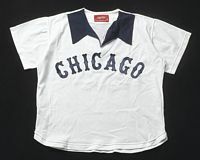 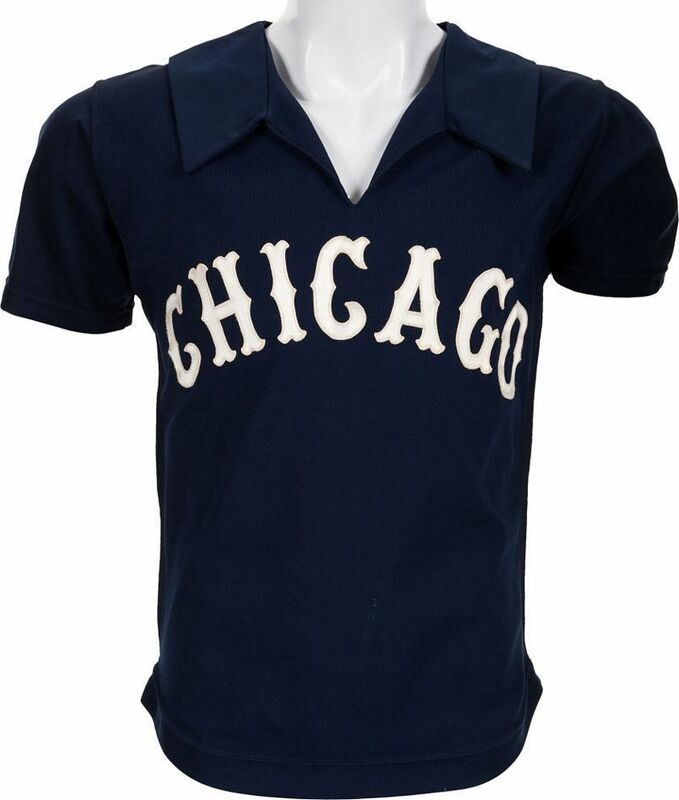 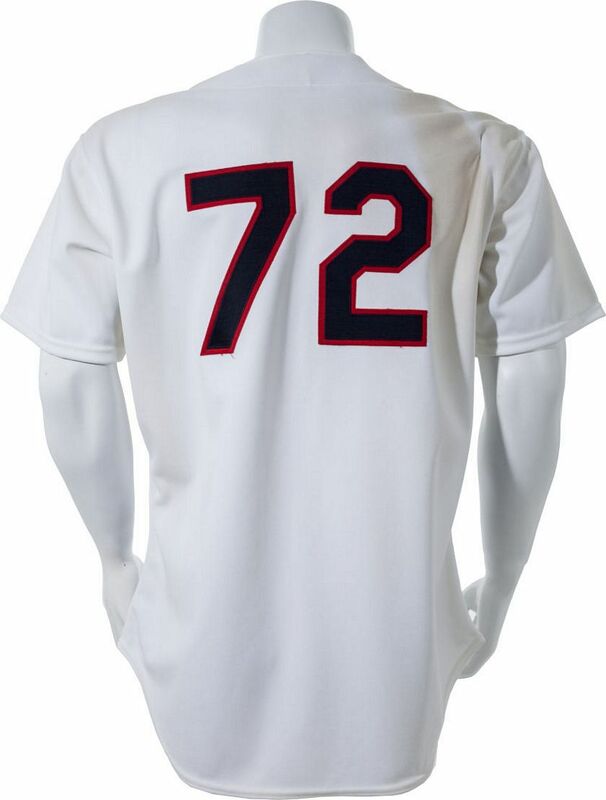 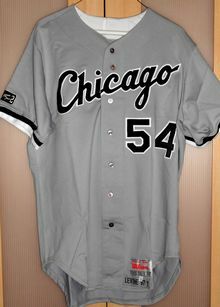 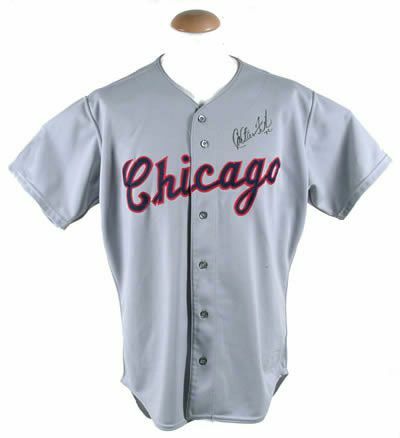 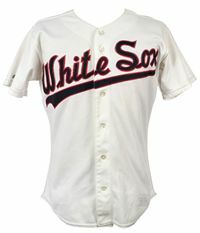 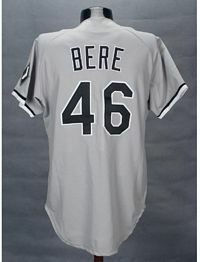 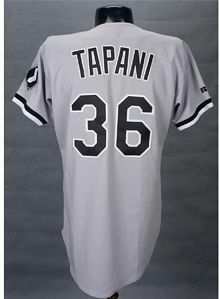 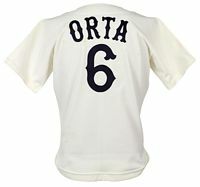 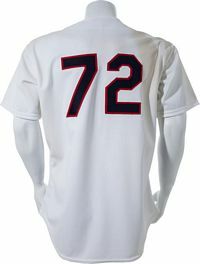 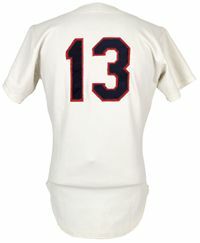 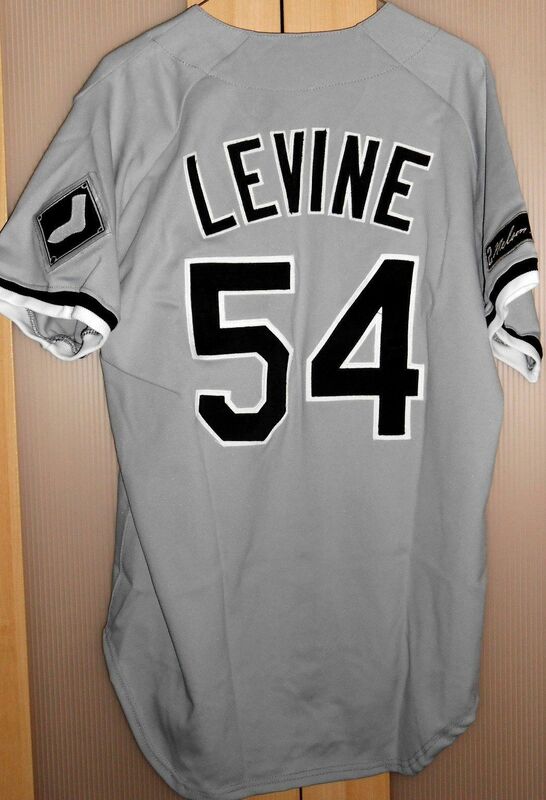 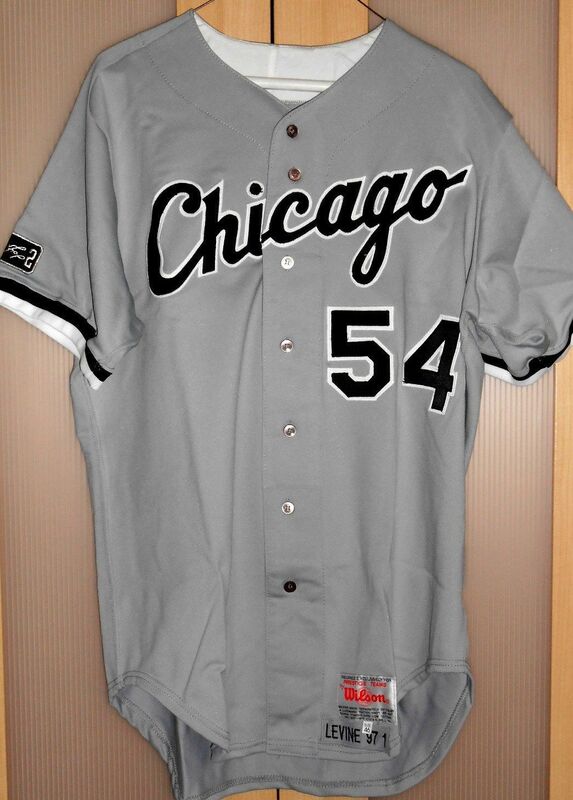 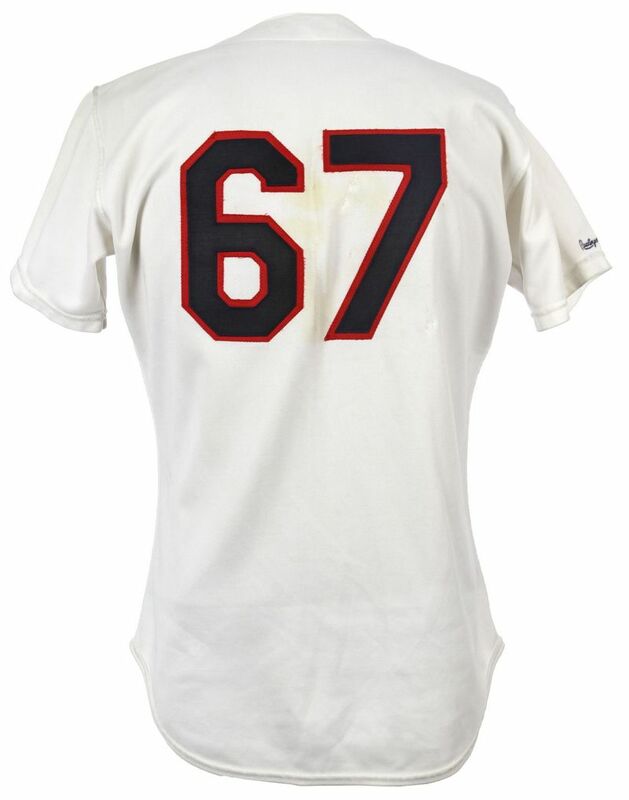 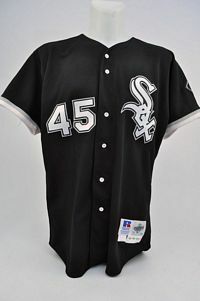 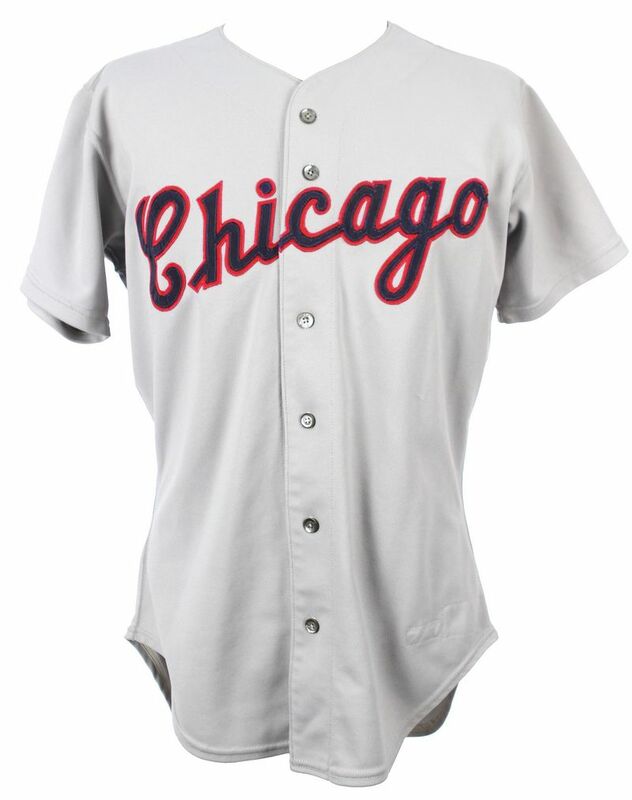 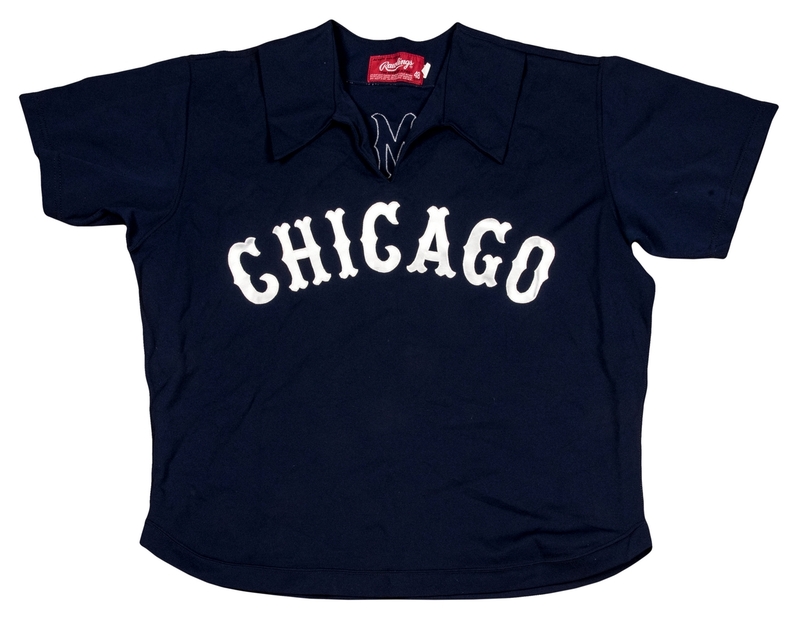 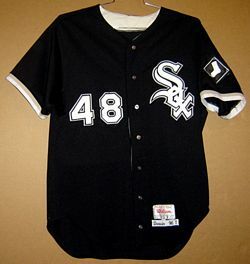 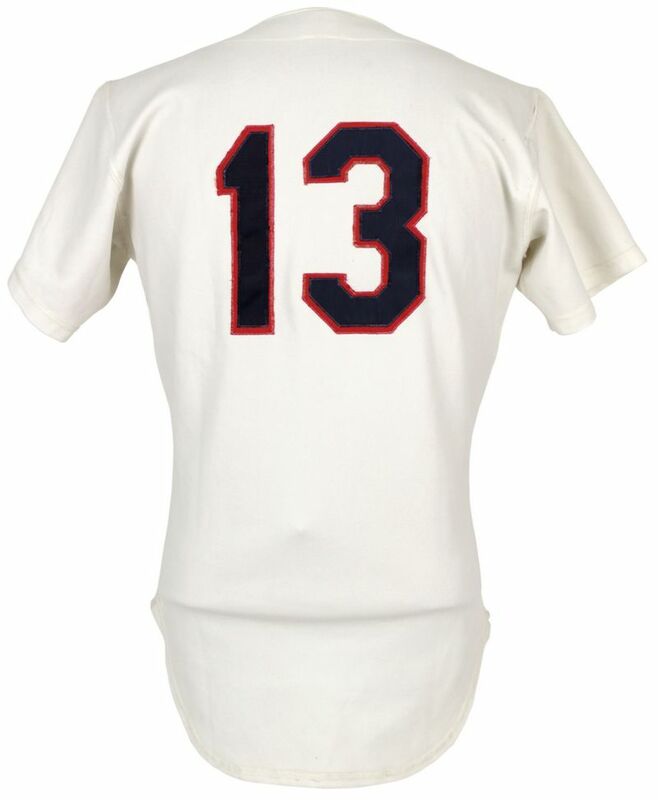 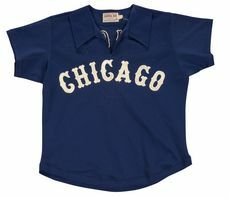 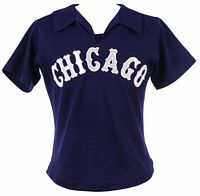 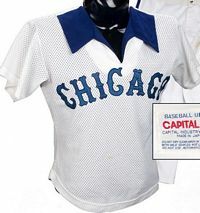 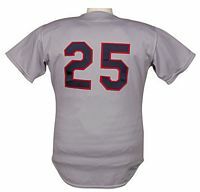 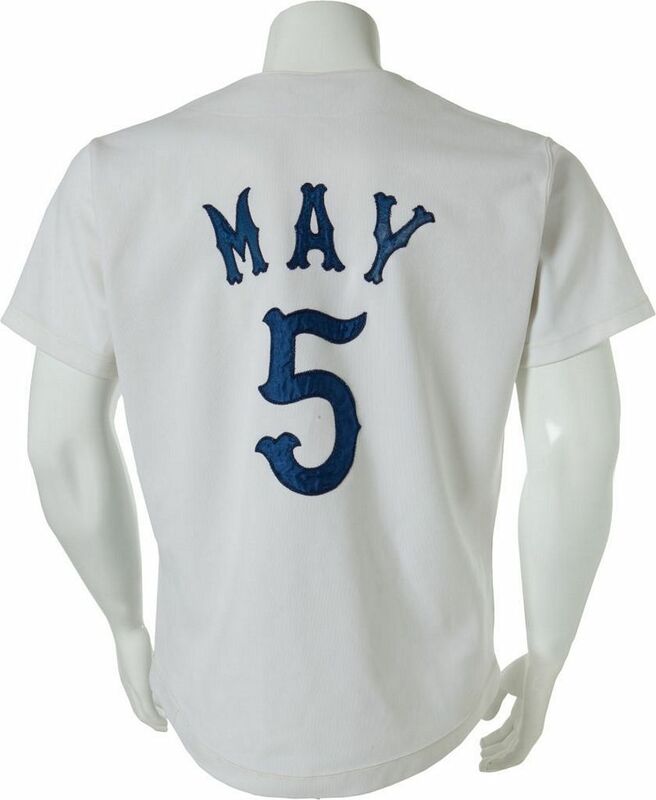 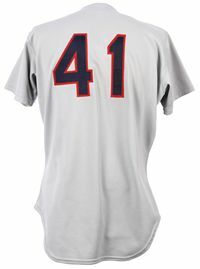 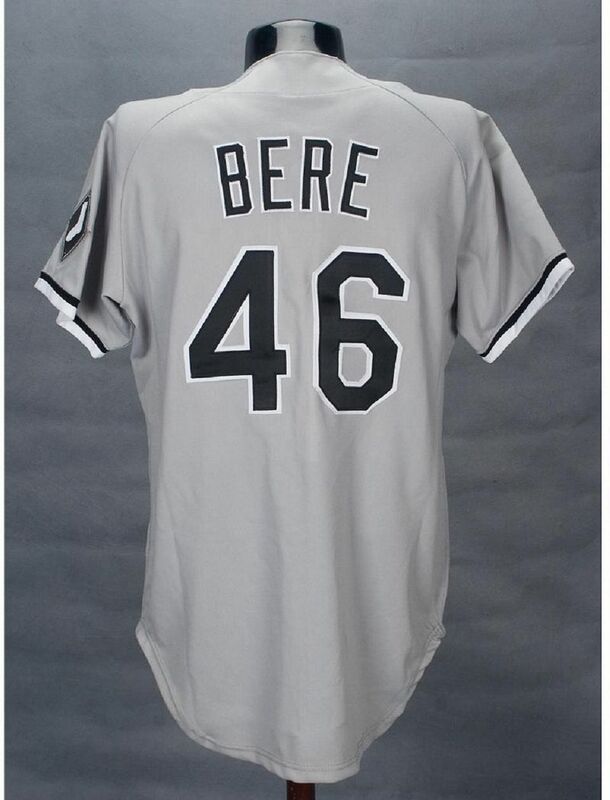 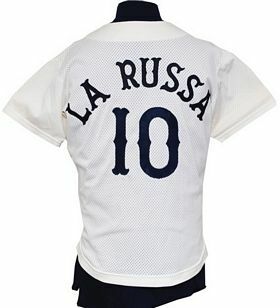 The Sox drop the pullovers and adopt a conservative design based on the (one-year style) 1942 home jersey. 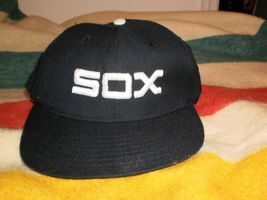 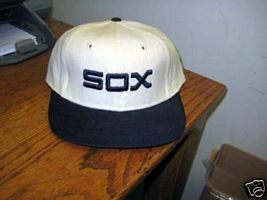 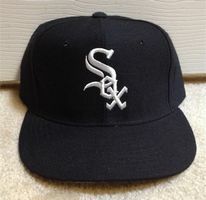 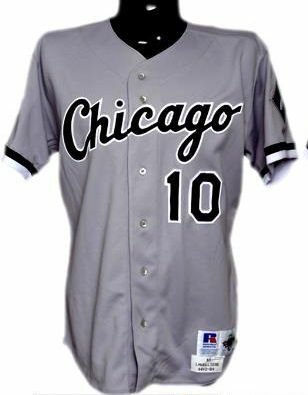 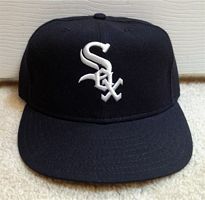 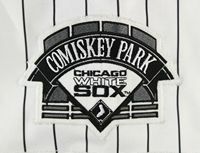 For the final few games at old Comiskey Park in 1990, the White Sox break out another new look along with a black alternate. It's inspired by the 1949-63 look but using silver as accent in place of red. 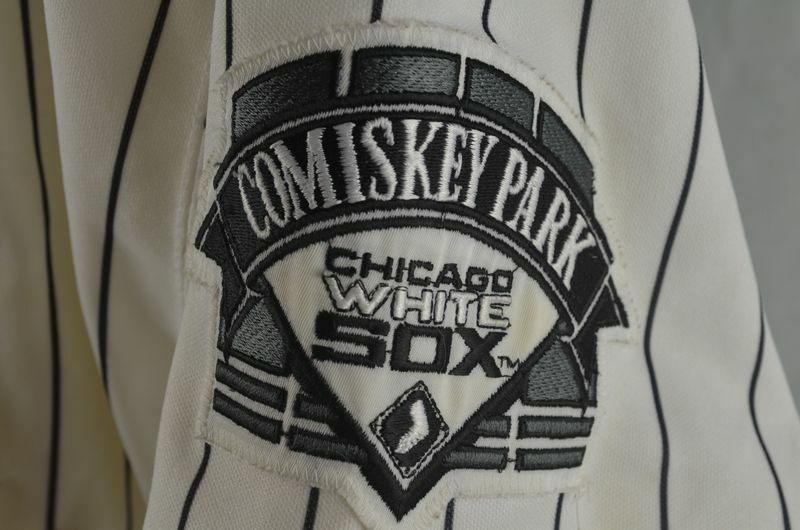 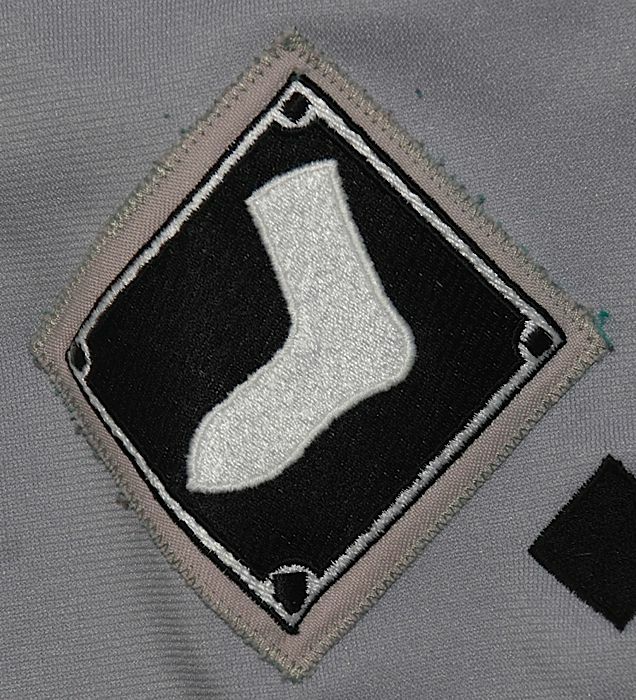 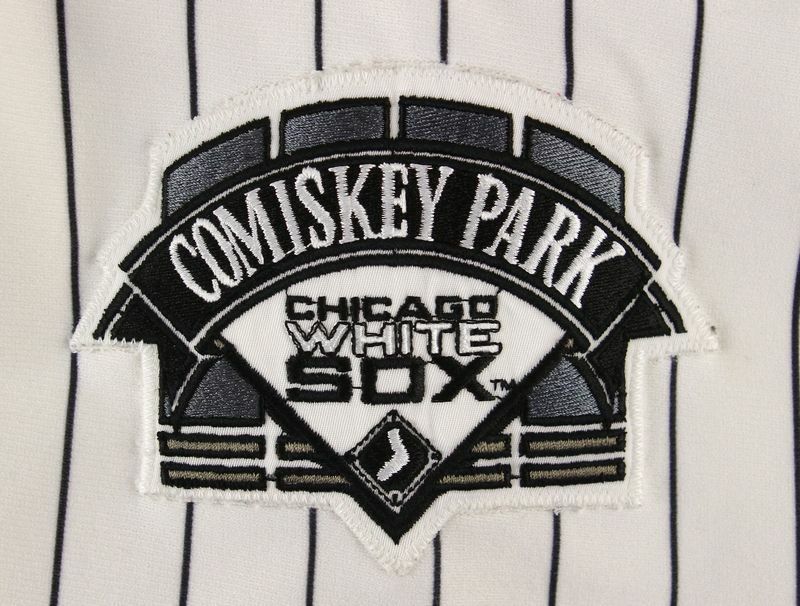 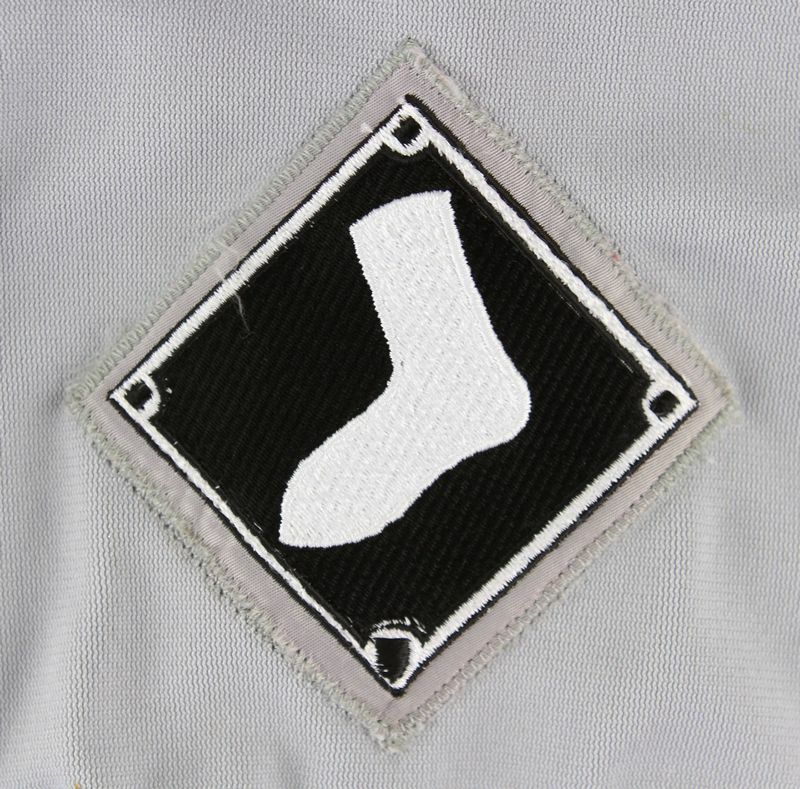 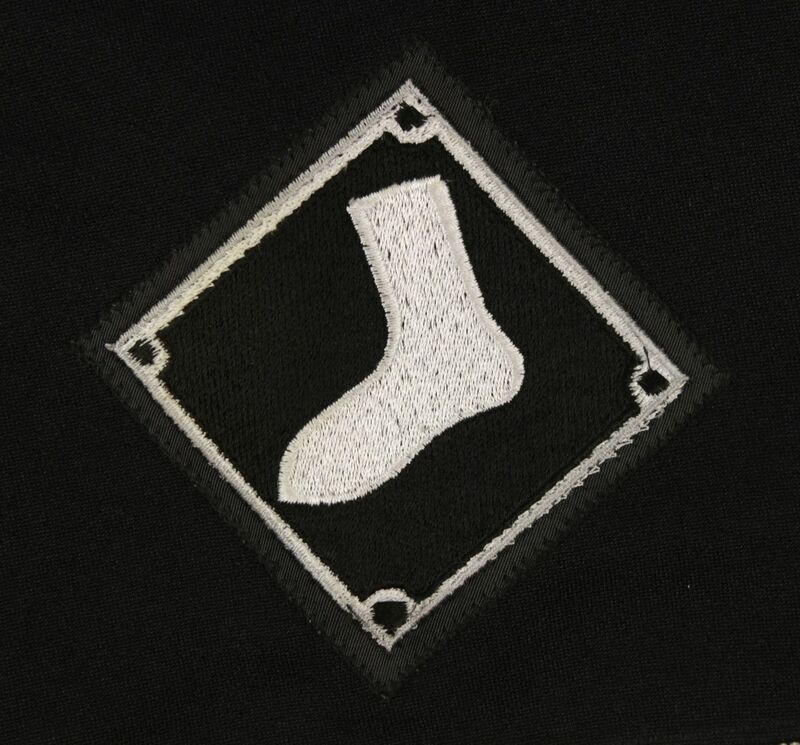 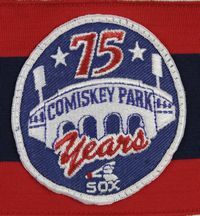 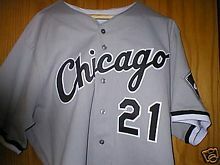 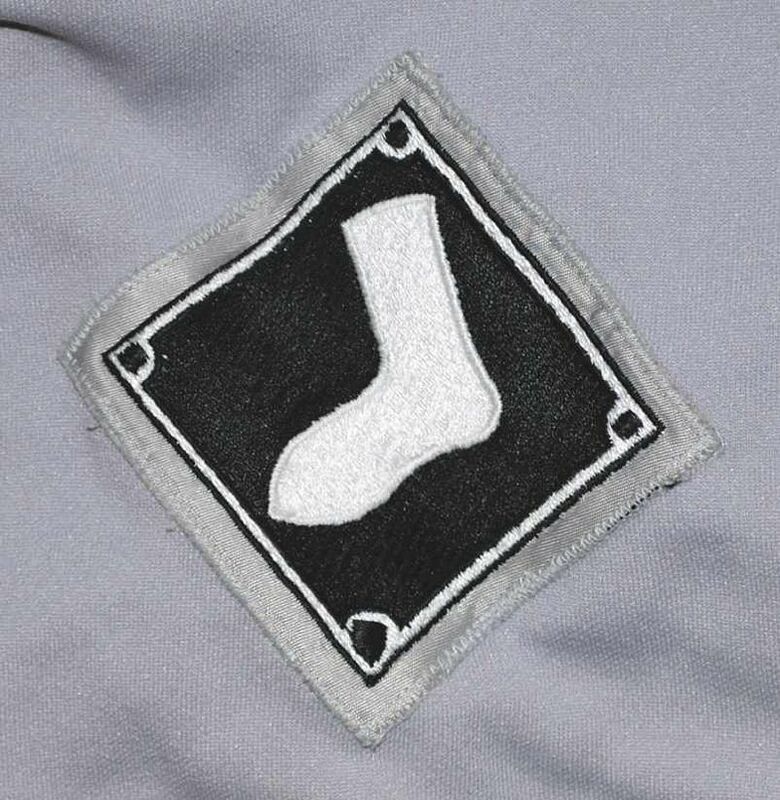 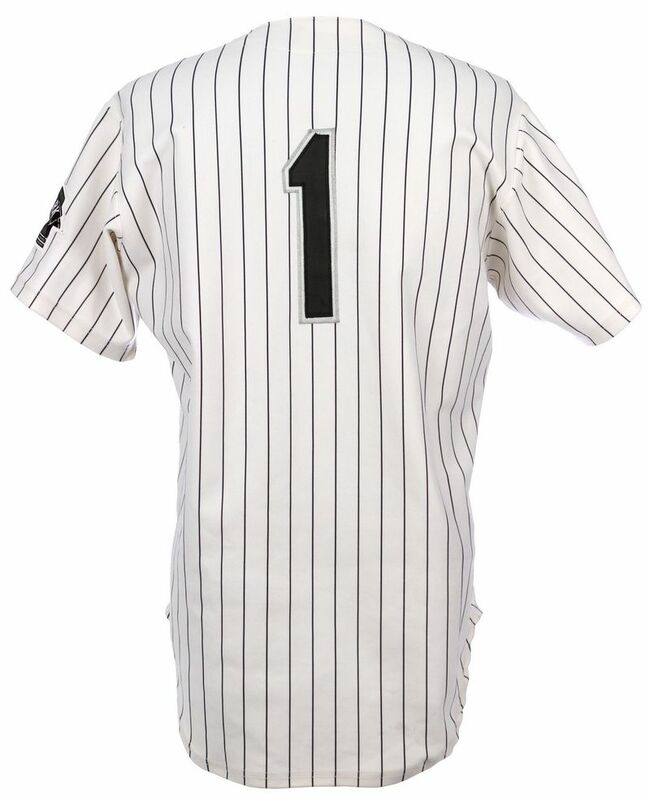 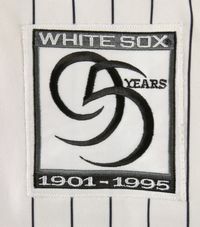 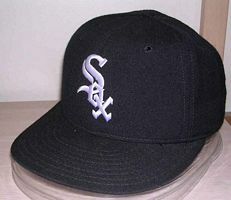 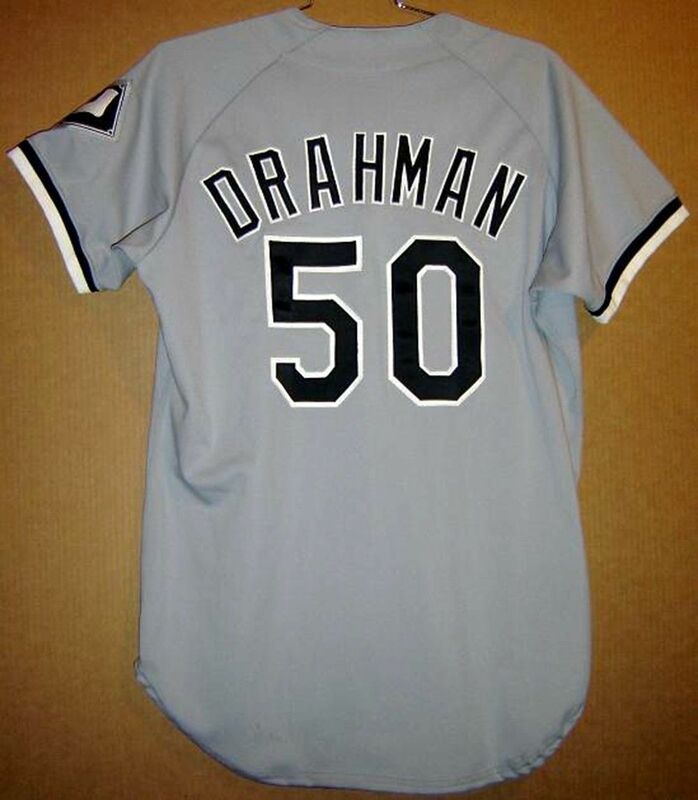 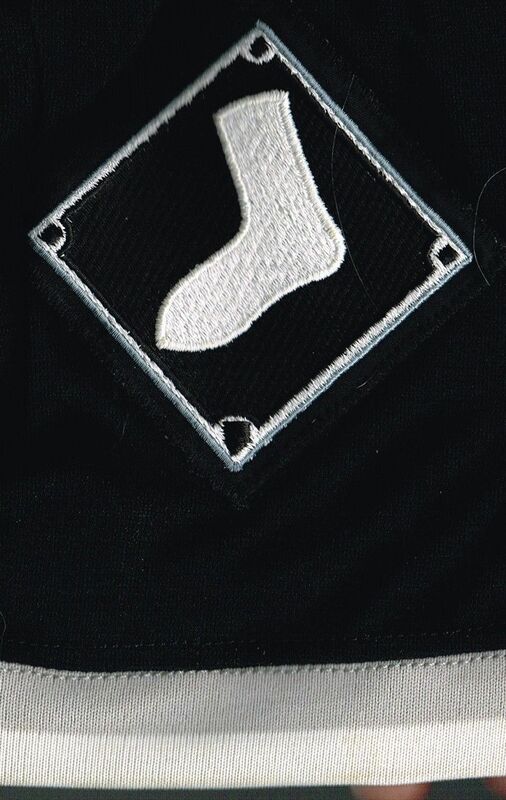 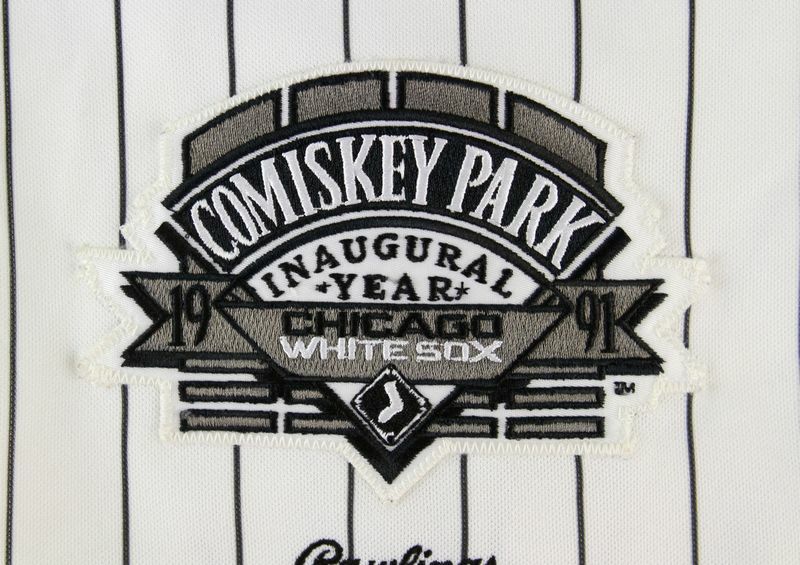 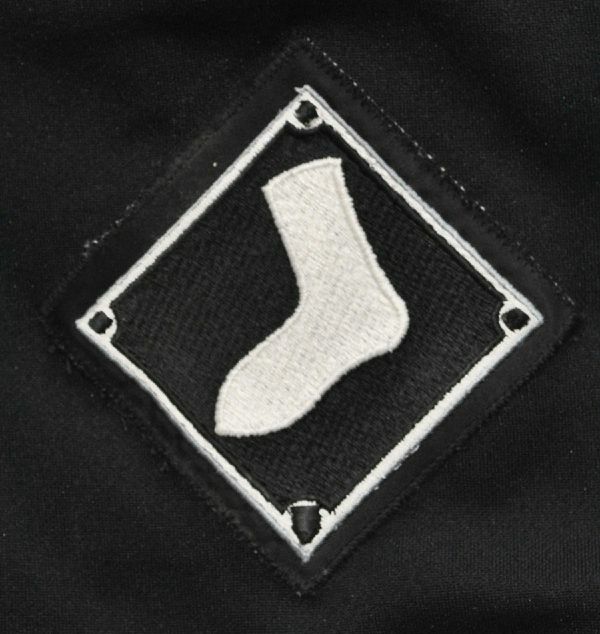 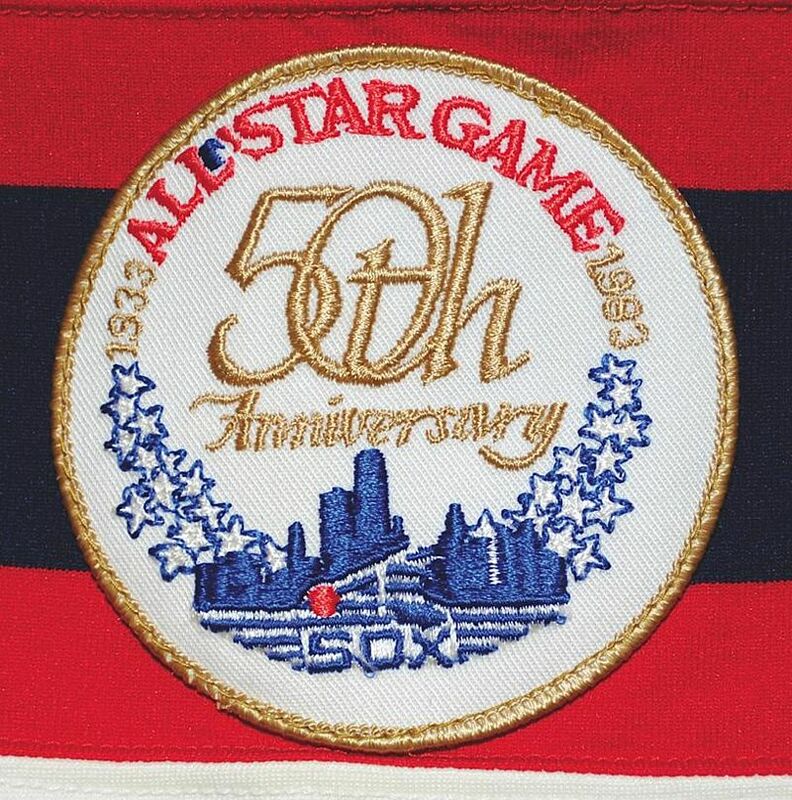 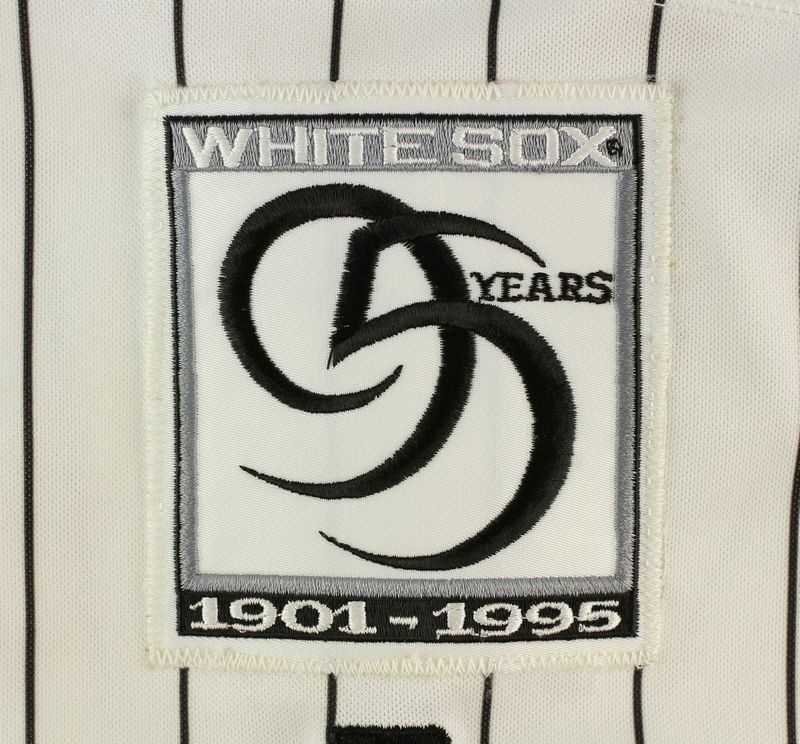 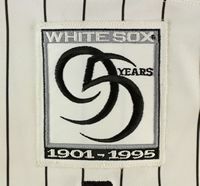 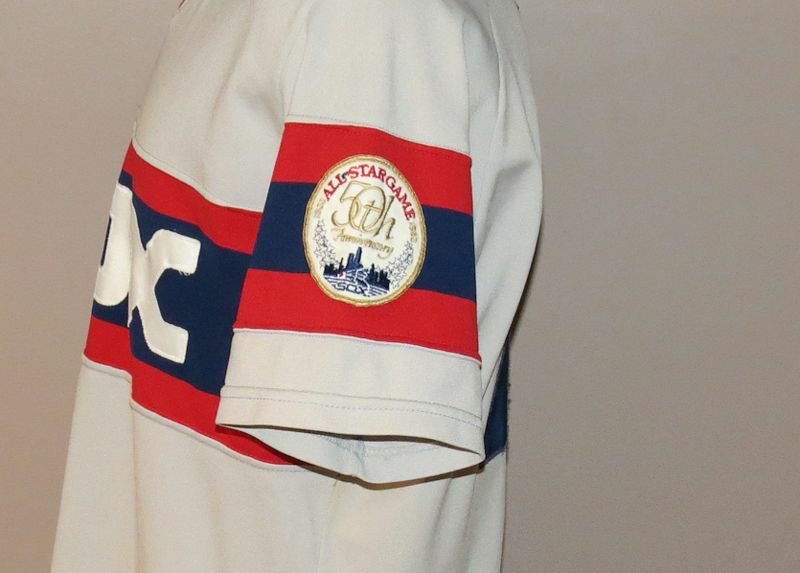 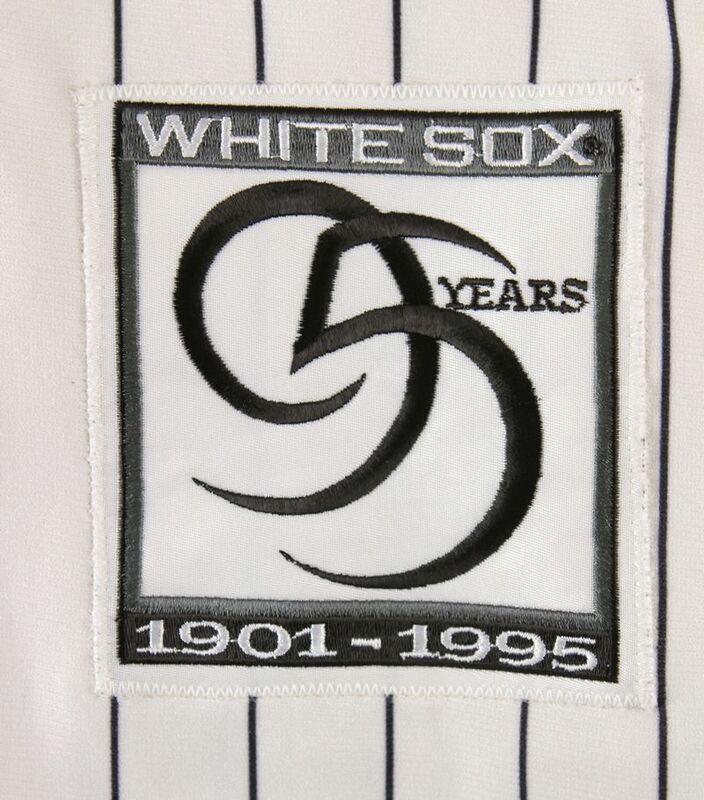 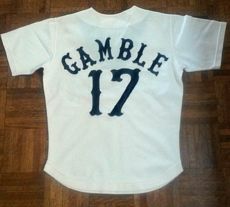 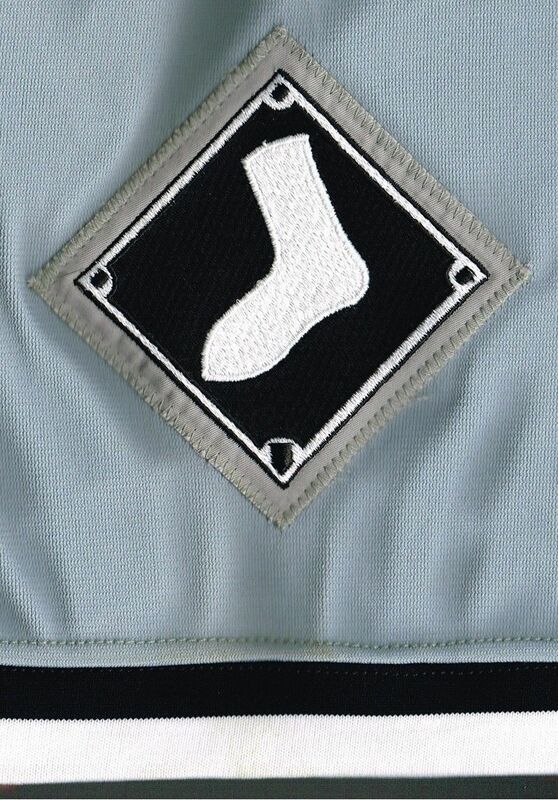 Comiskey Park Inaugural Year patch worn on home and black alternate jerseys right sleeve. 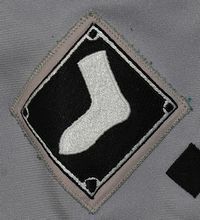 Road jerseys also sport a sock patch on the left. 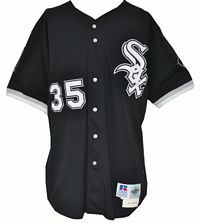 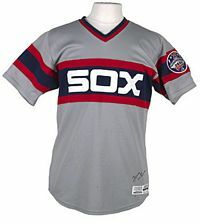 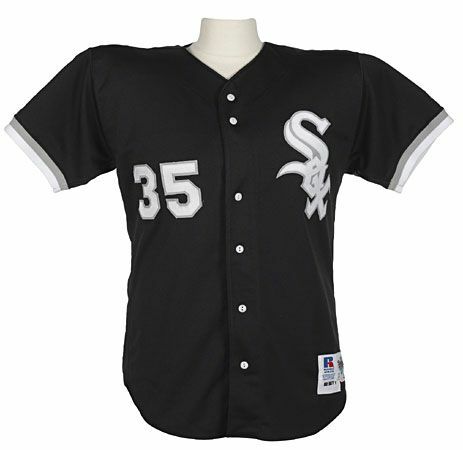 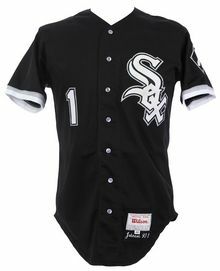 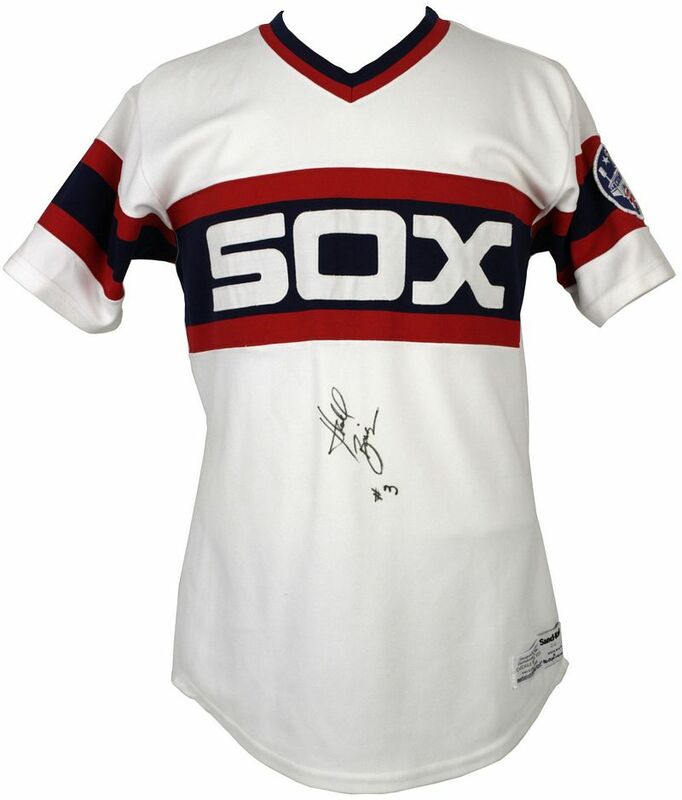 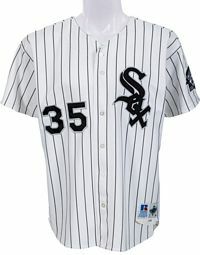 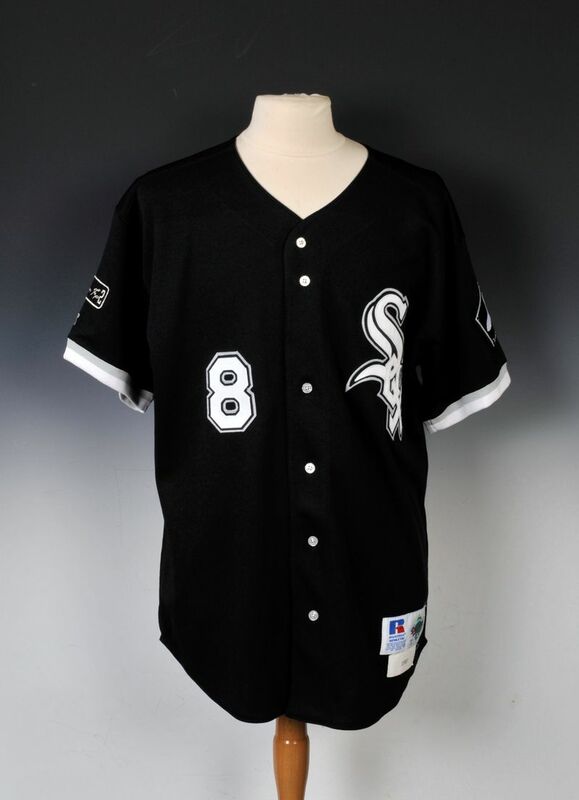 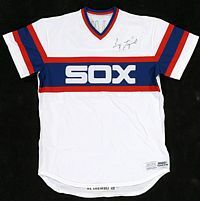 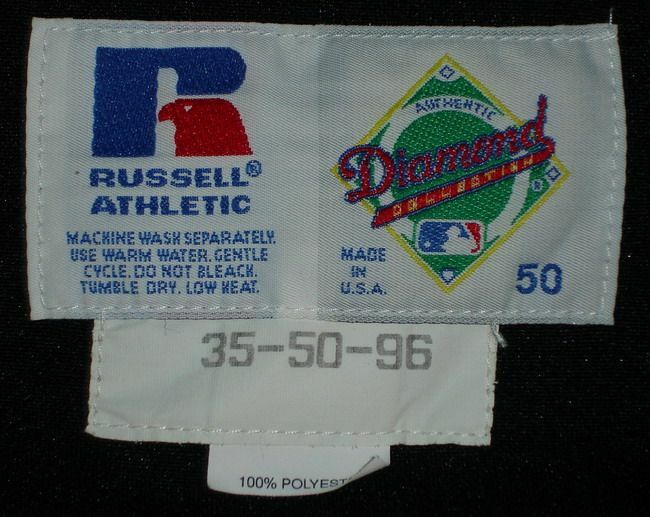 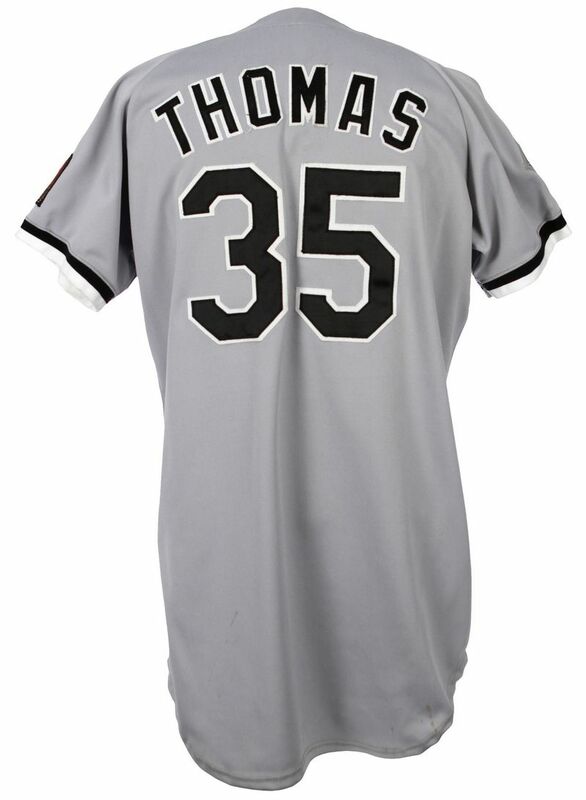 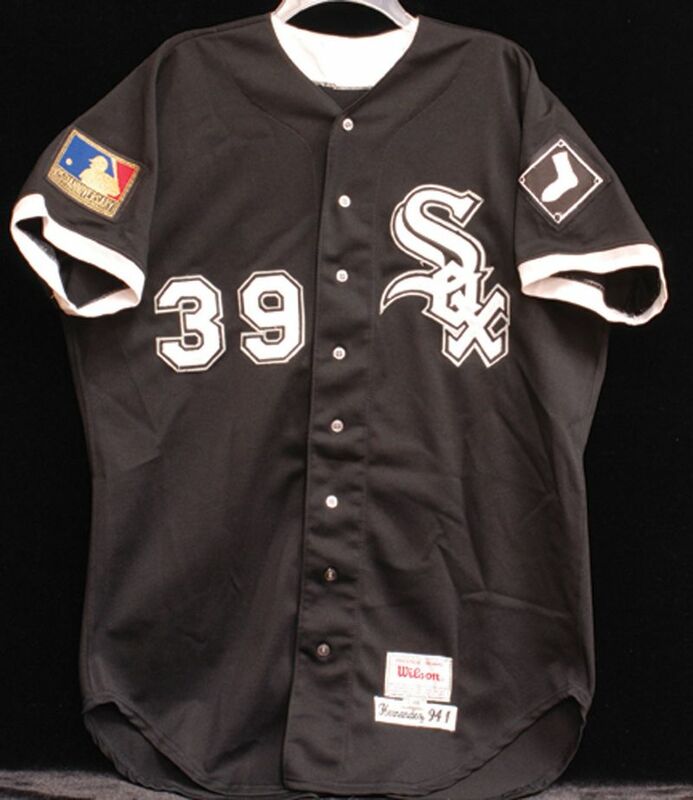 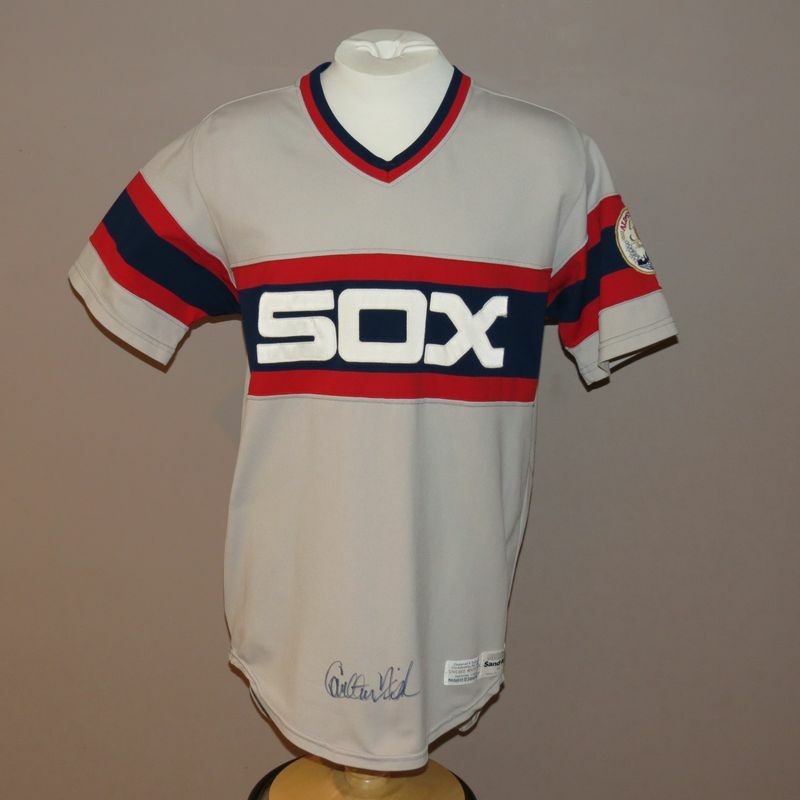 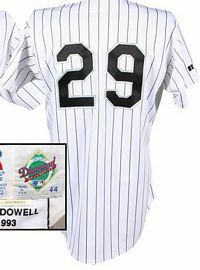 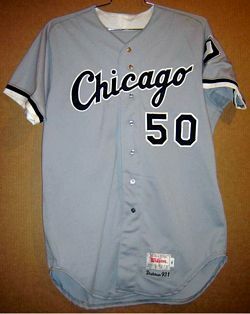 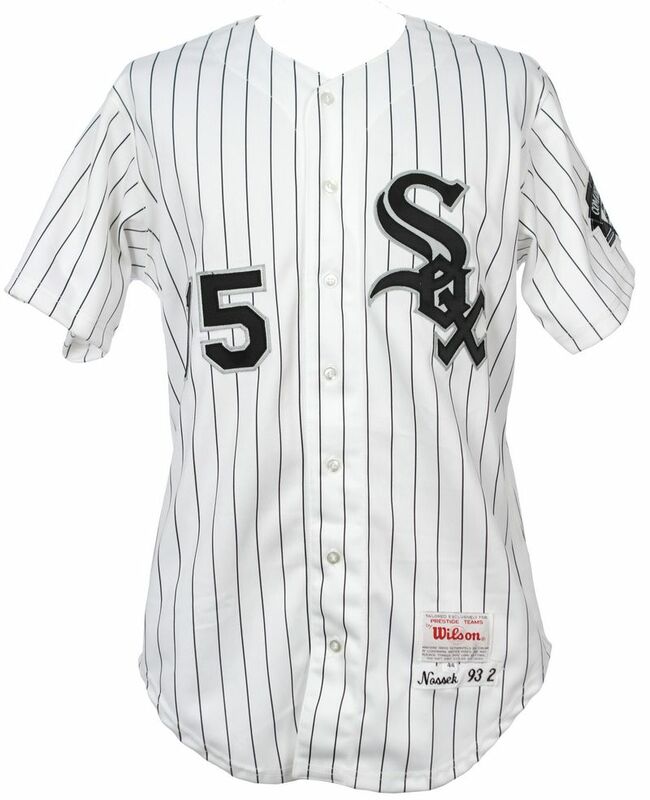 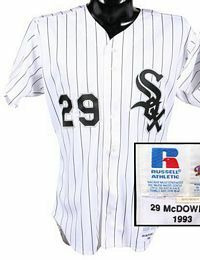 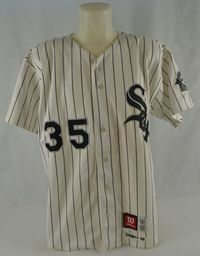 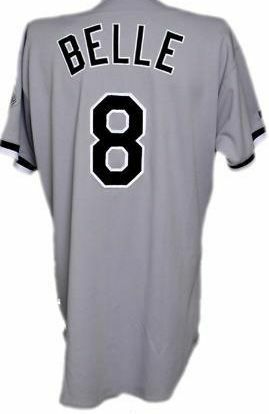 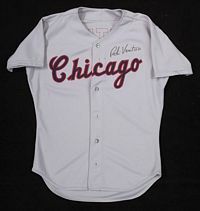 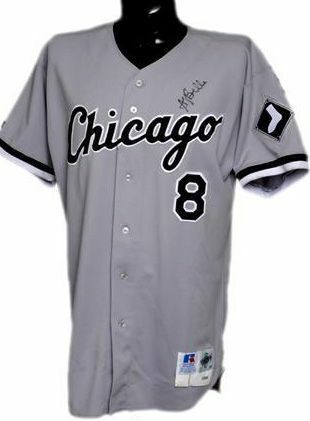 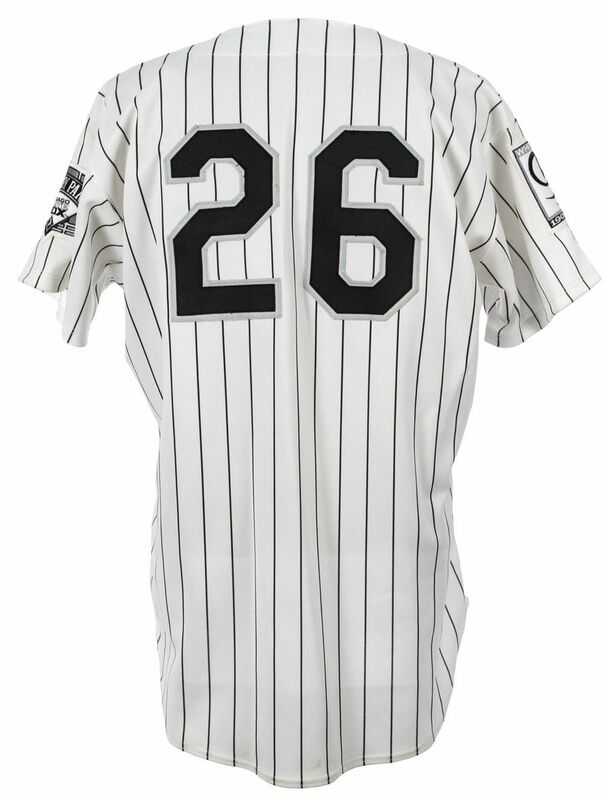 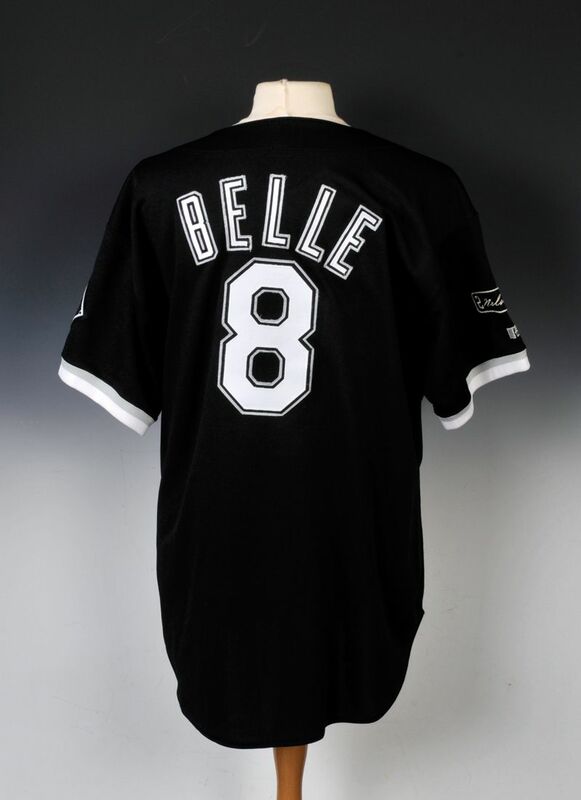 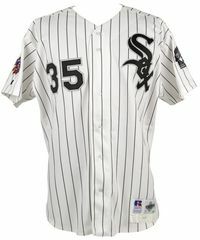 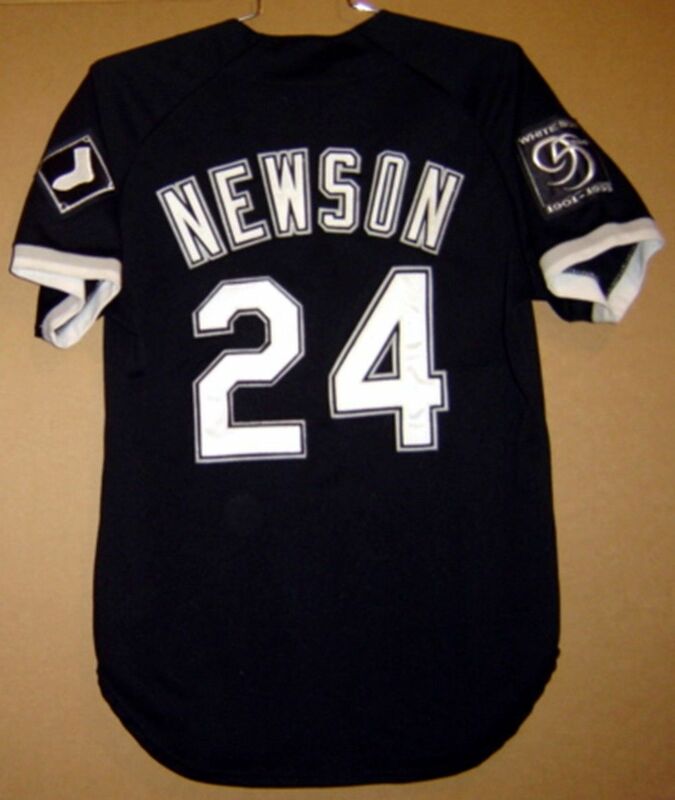 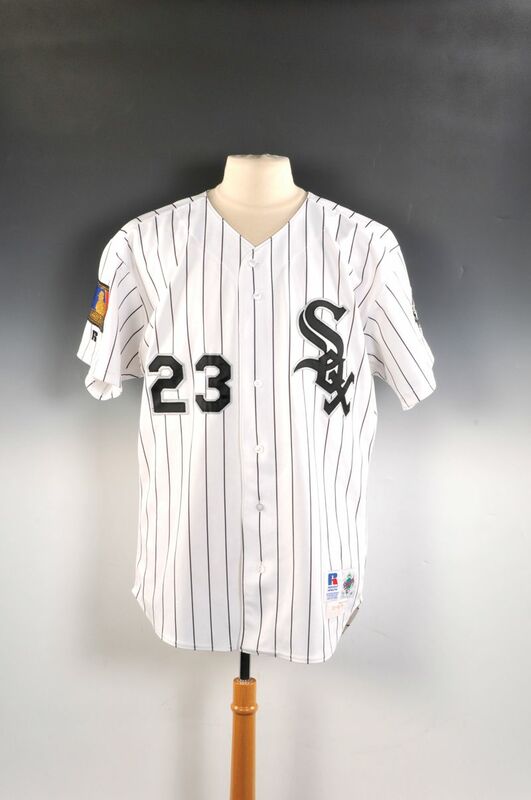 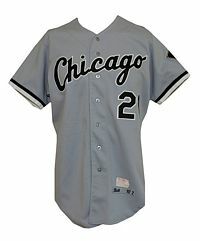 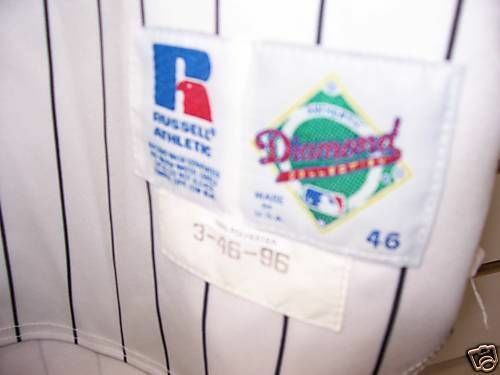 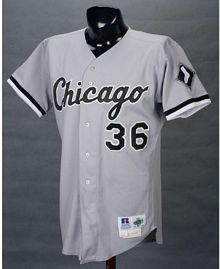 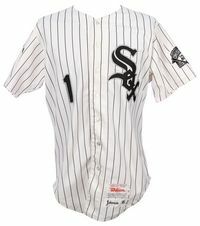 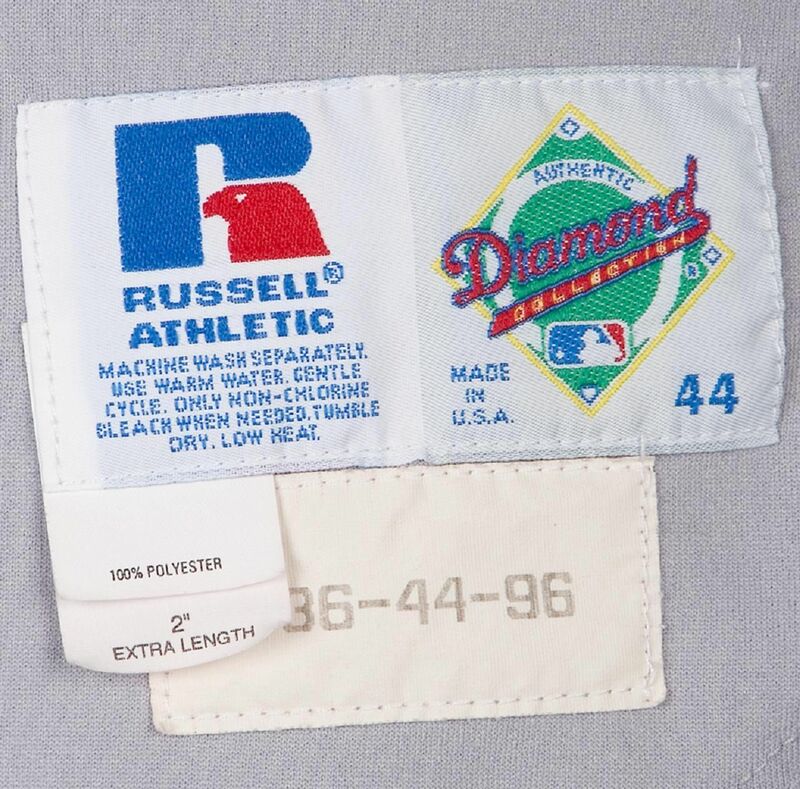 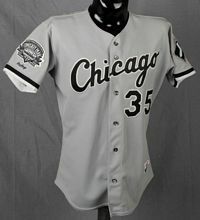 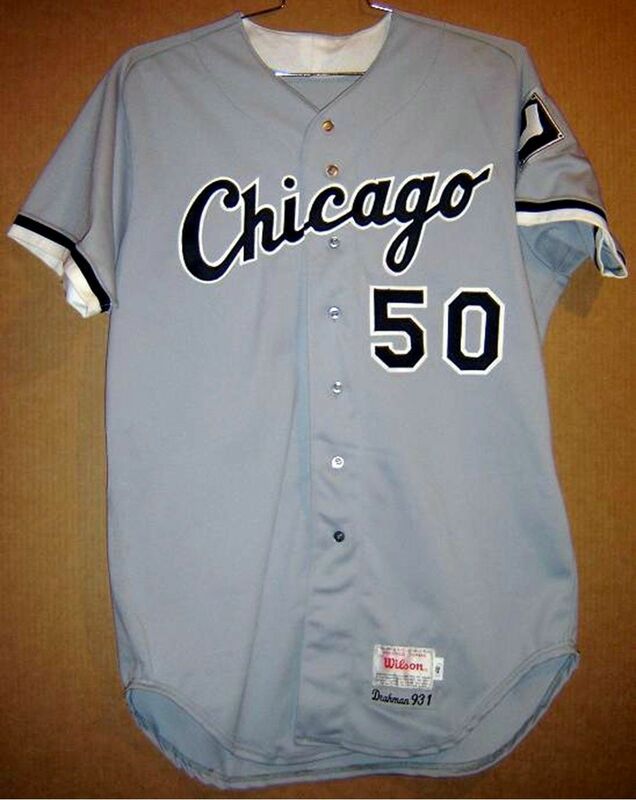 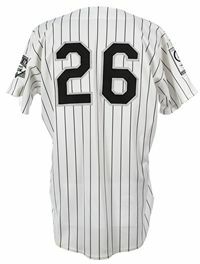 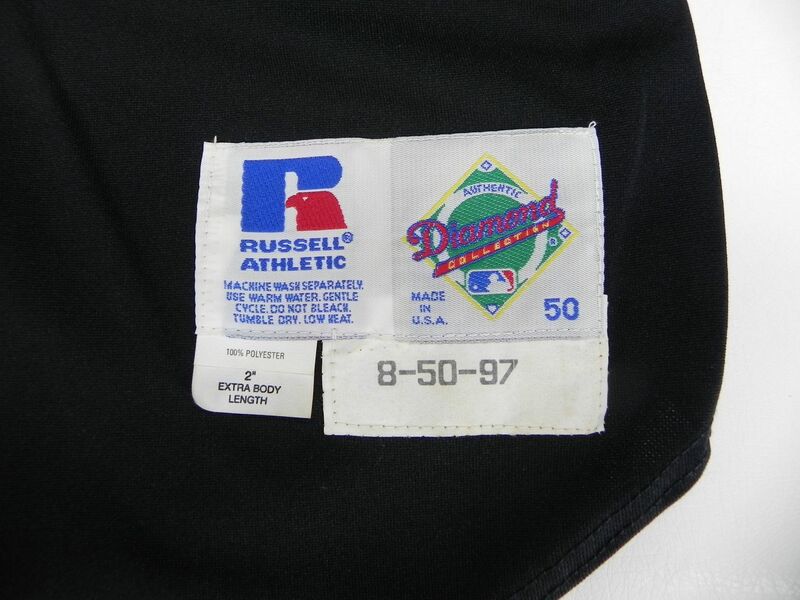 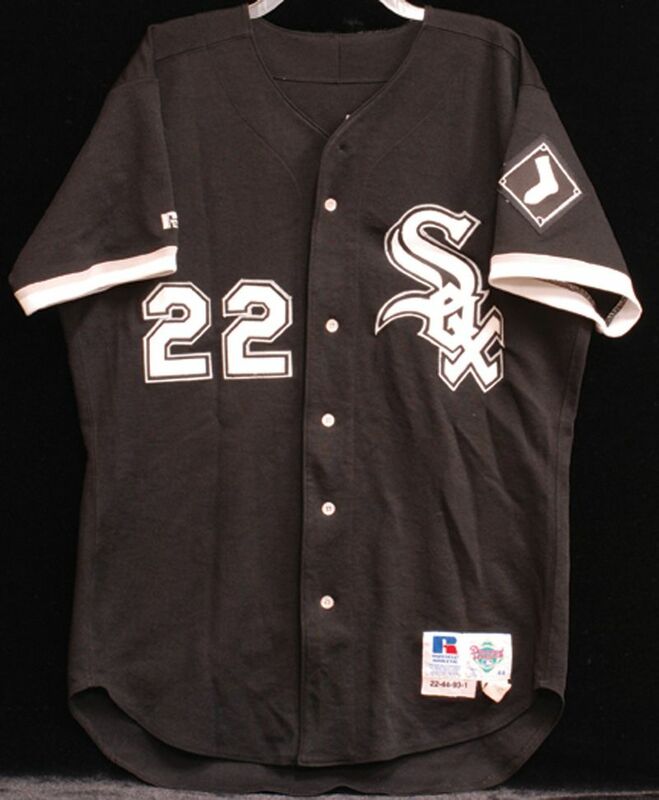 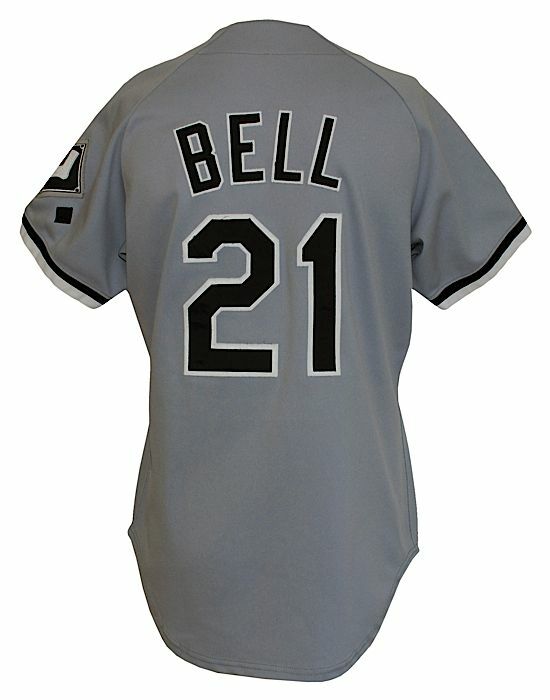 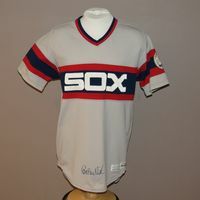 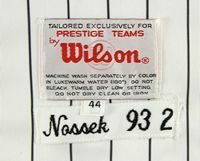 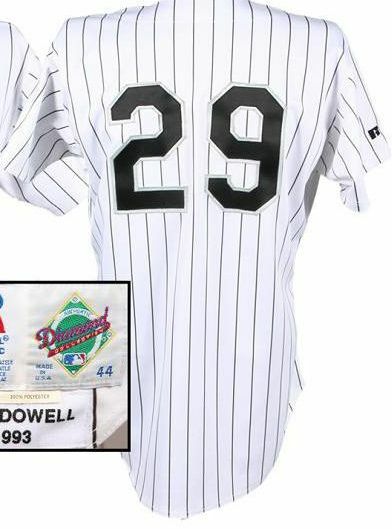 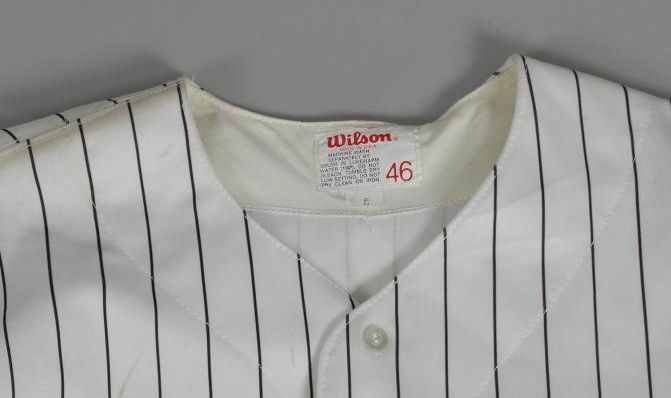 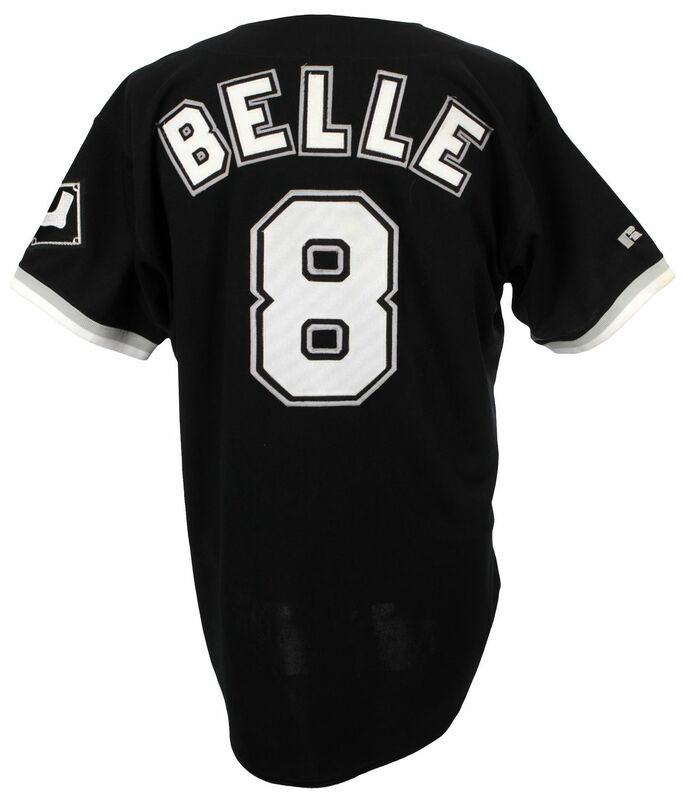 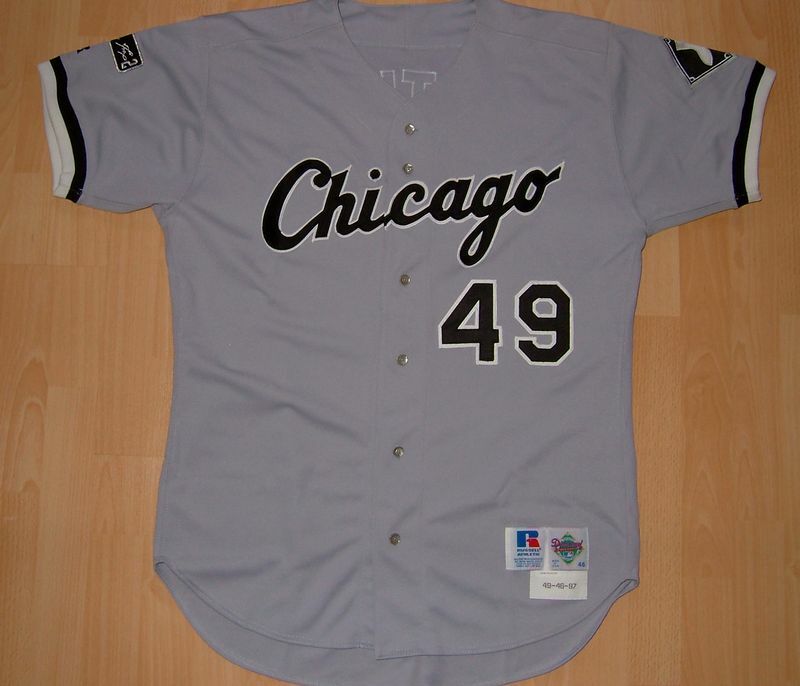 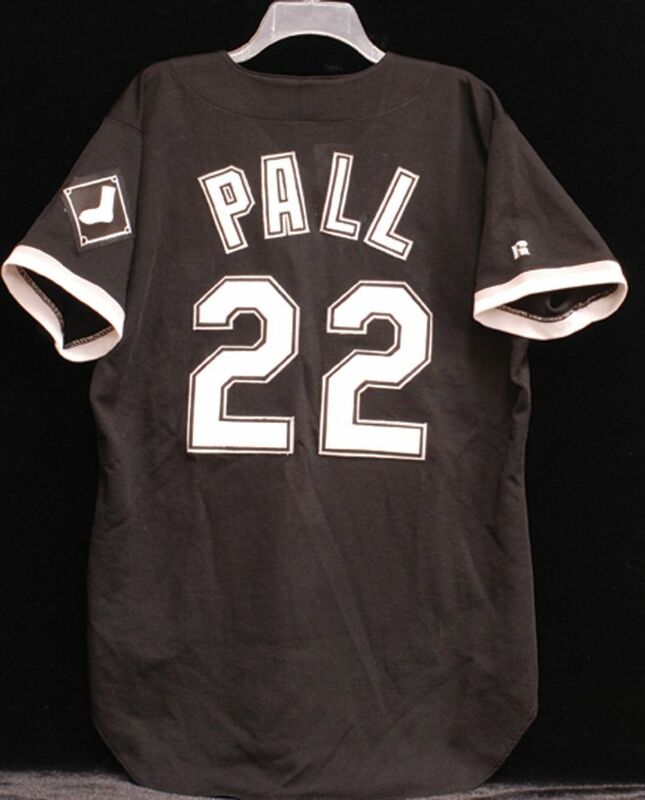 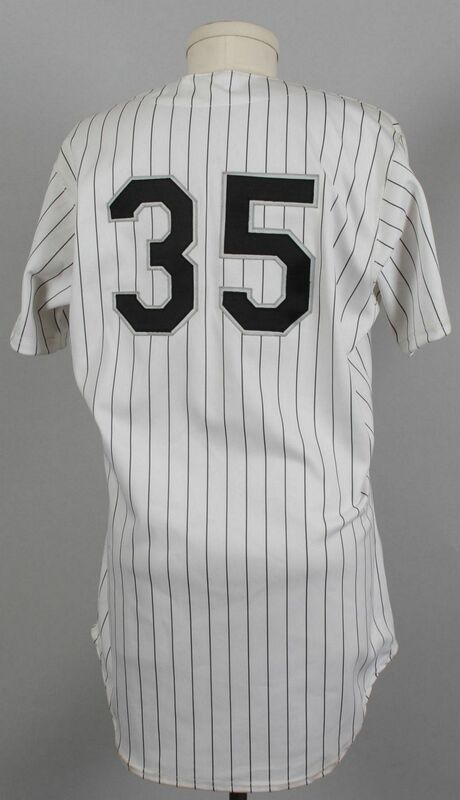 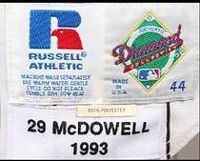 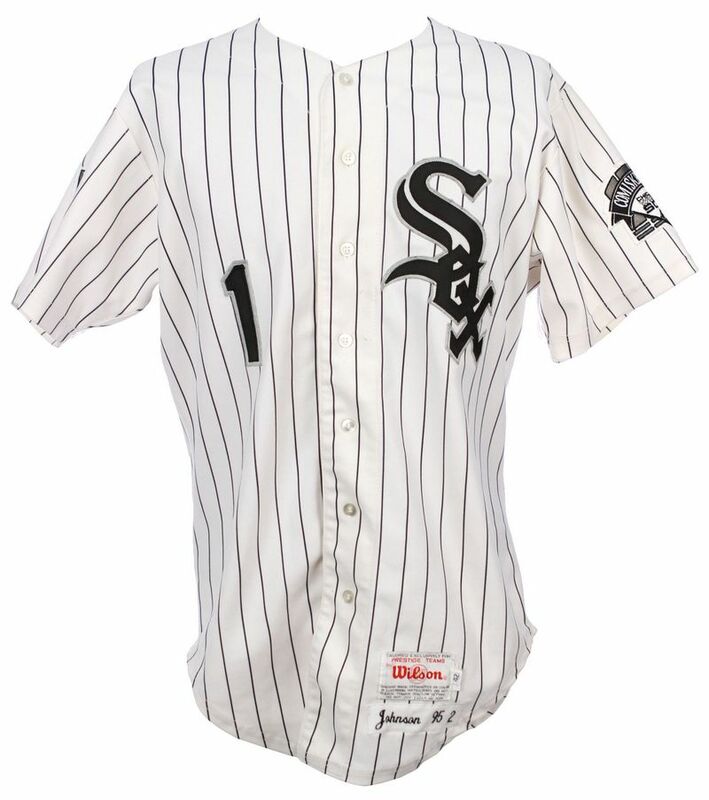 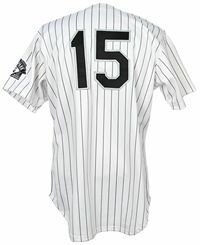 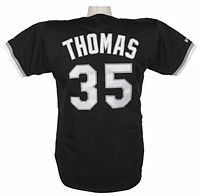 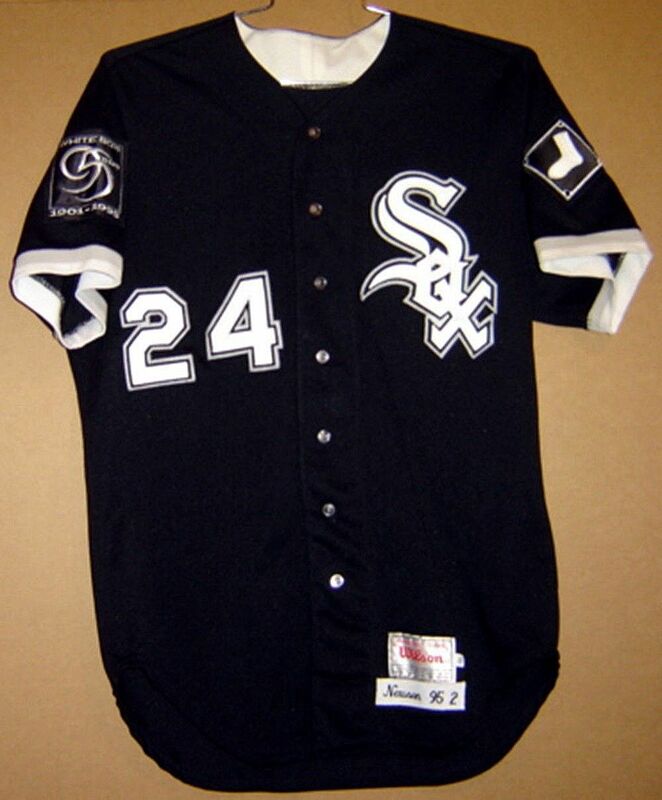 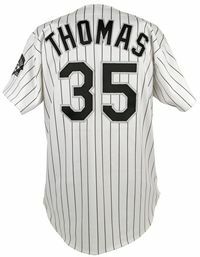 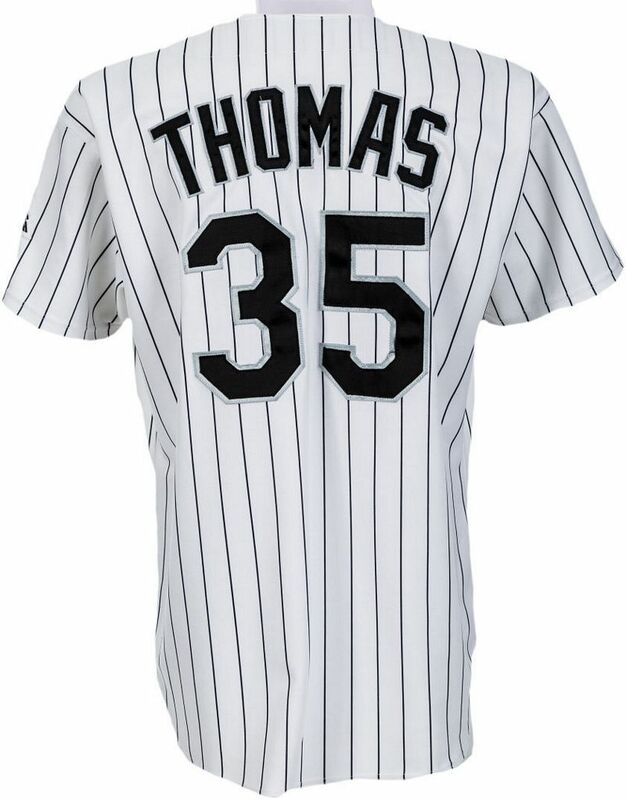 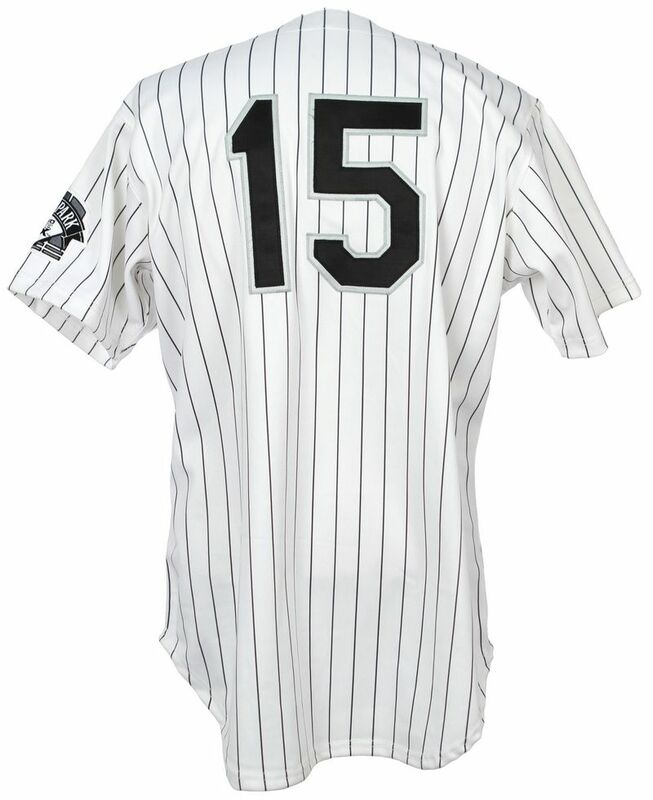 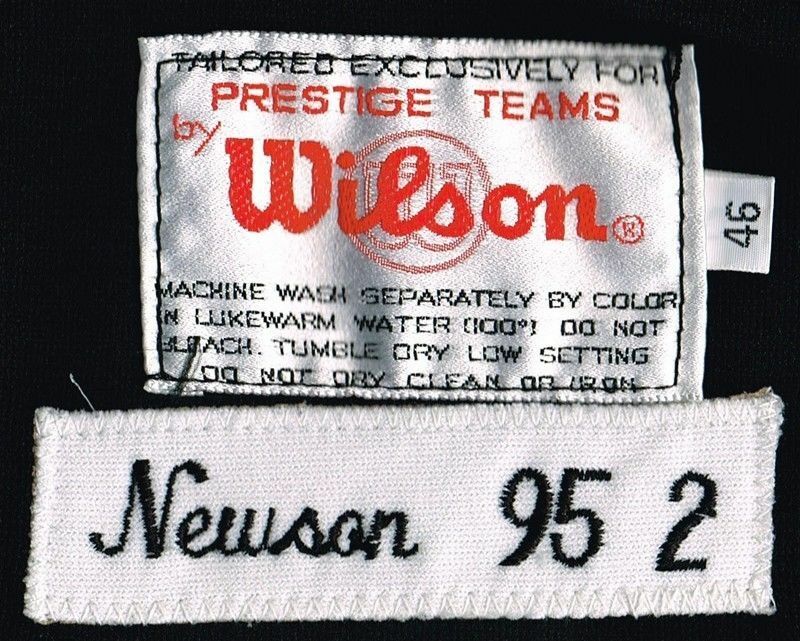 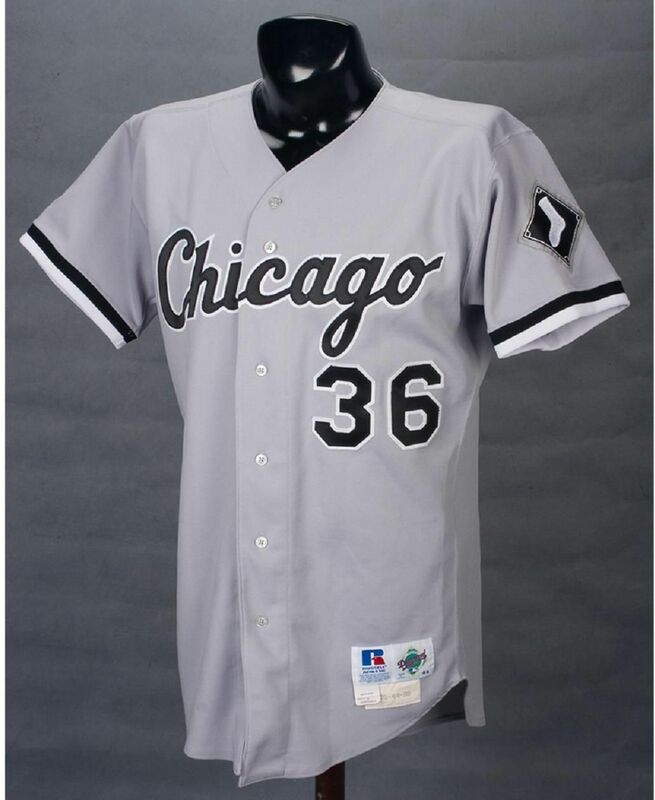 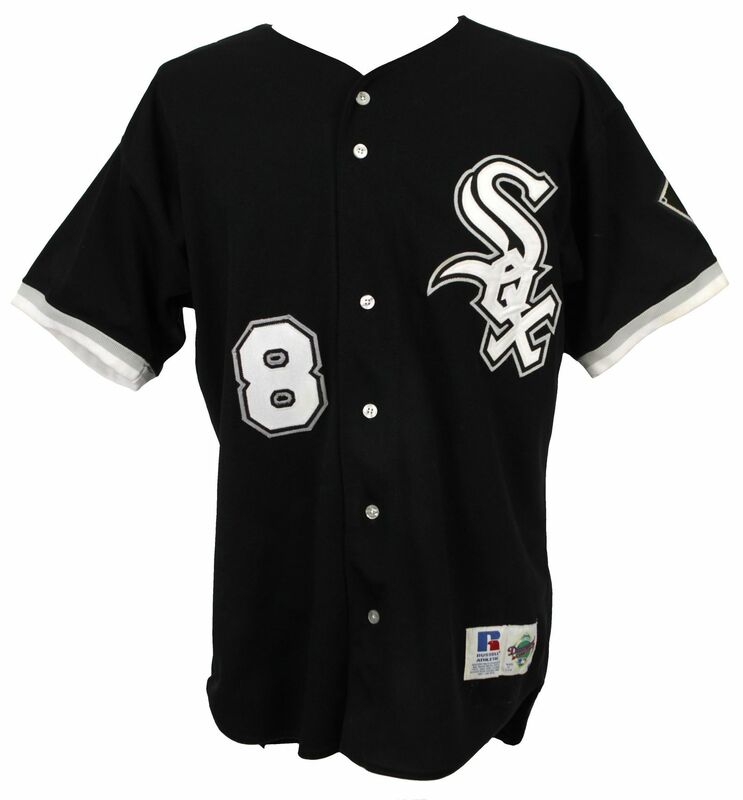 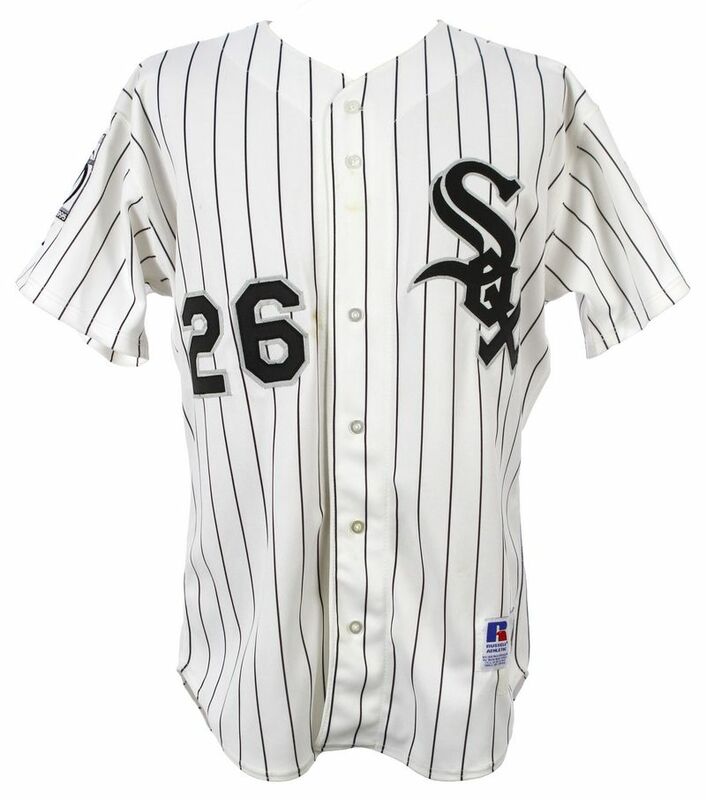 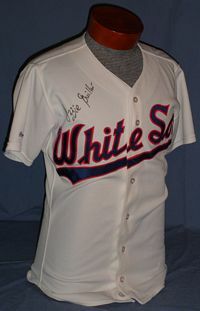 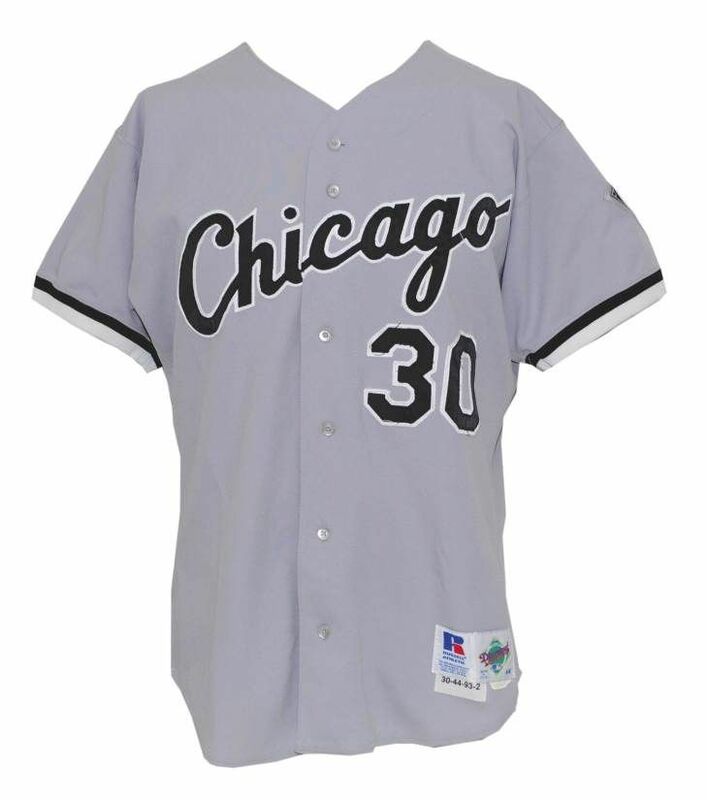 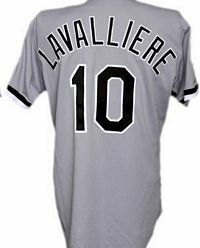 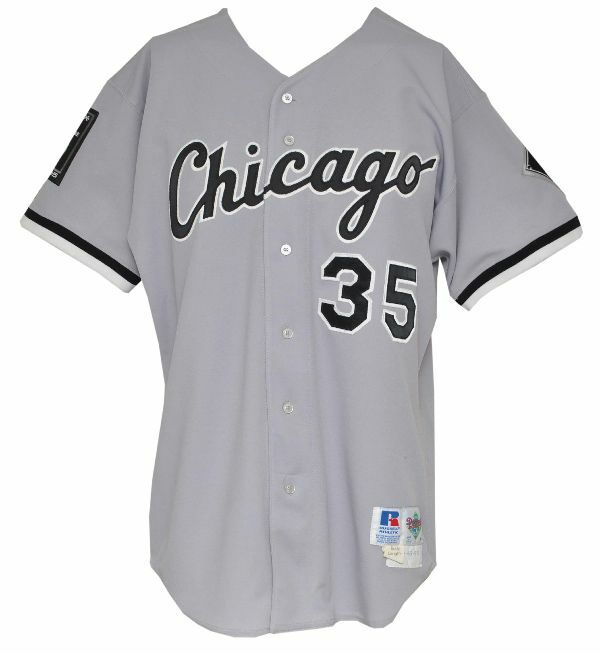 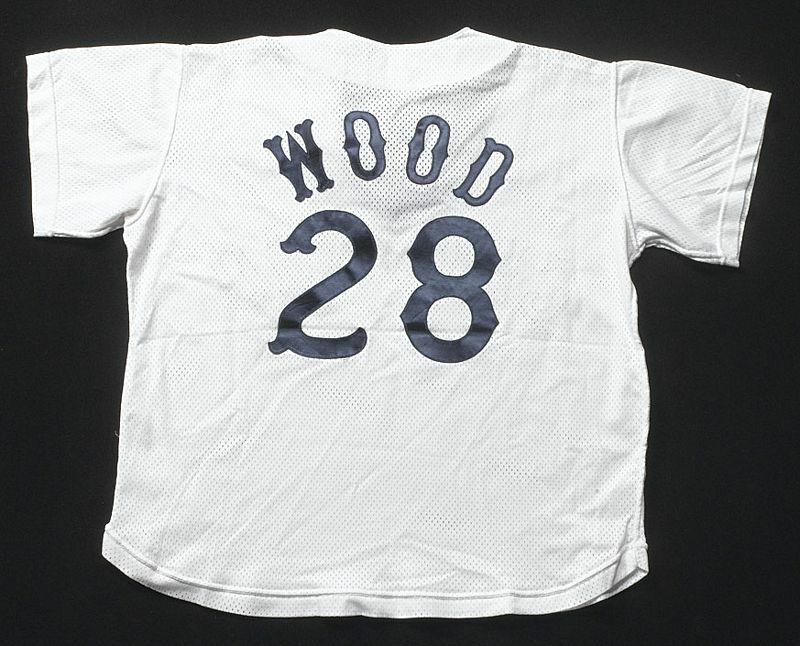 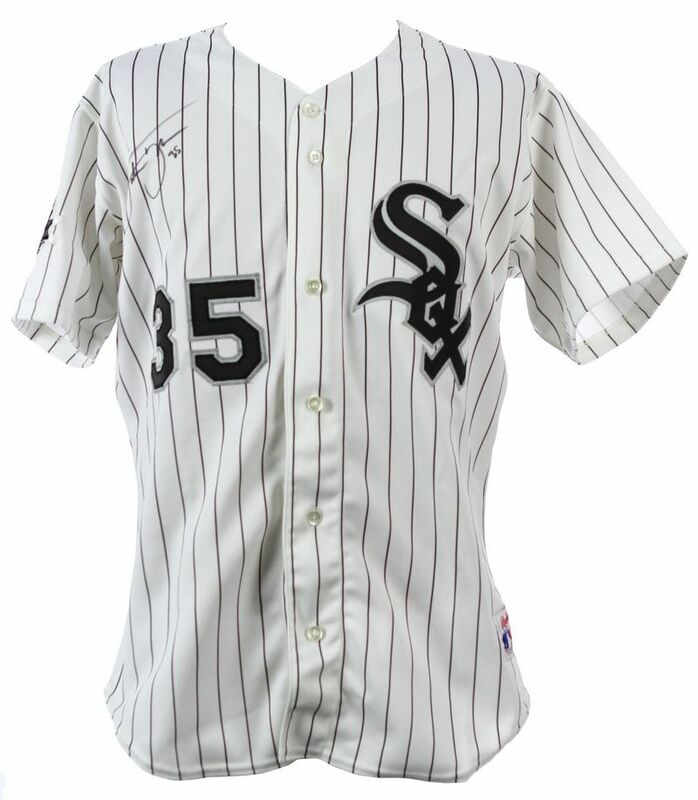 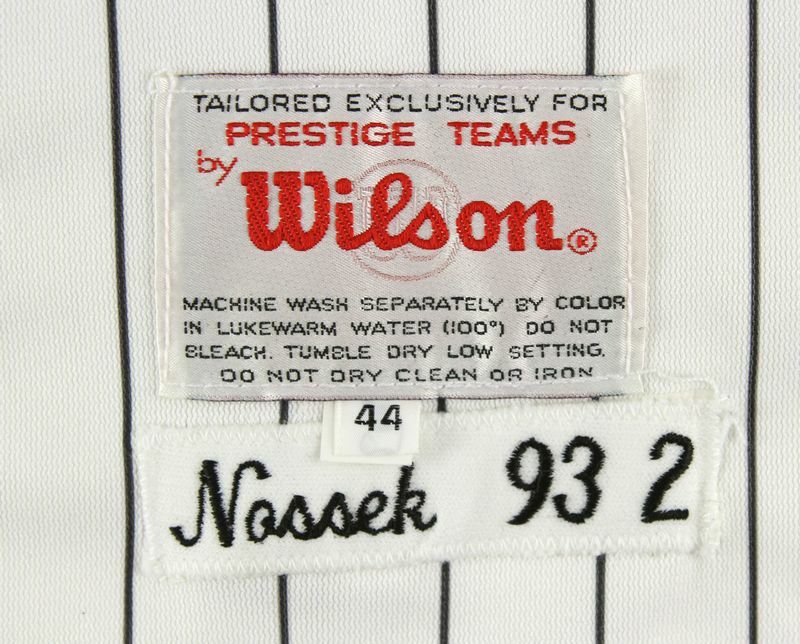 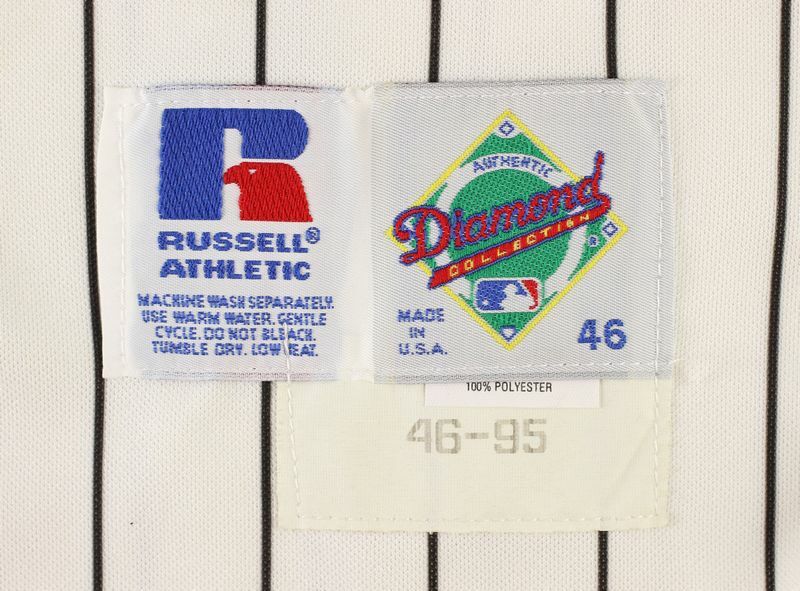 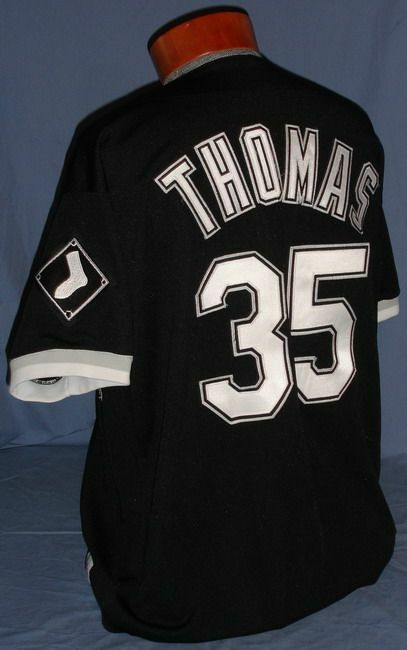 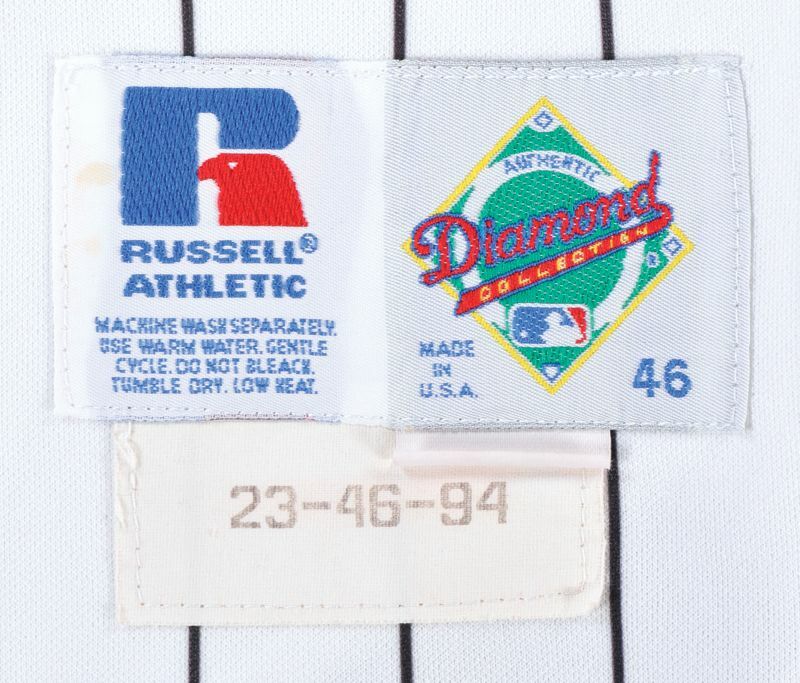 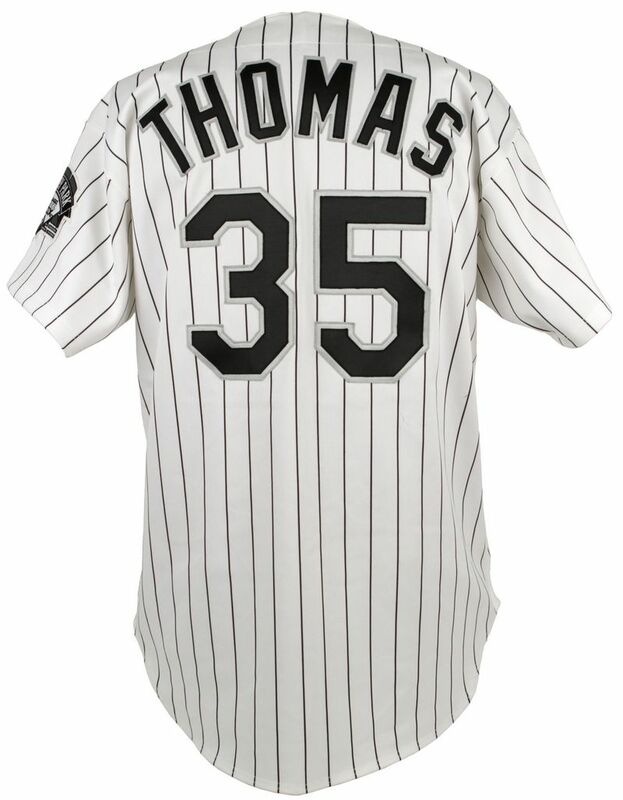 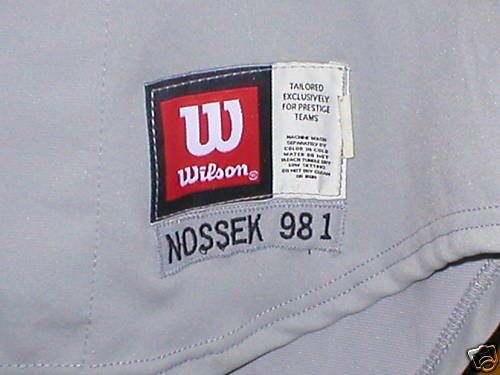 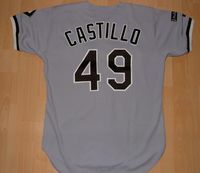 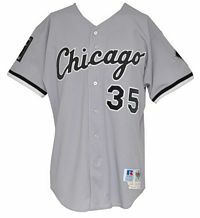 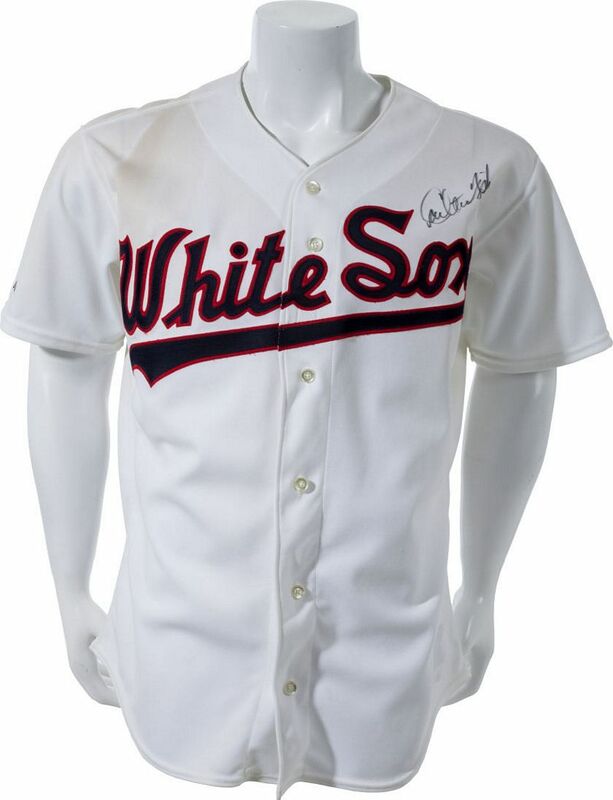 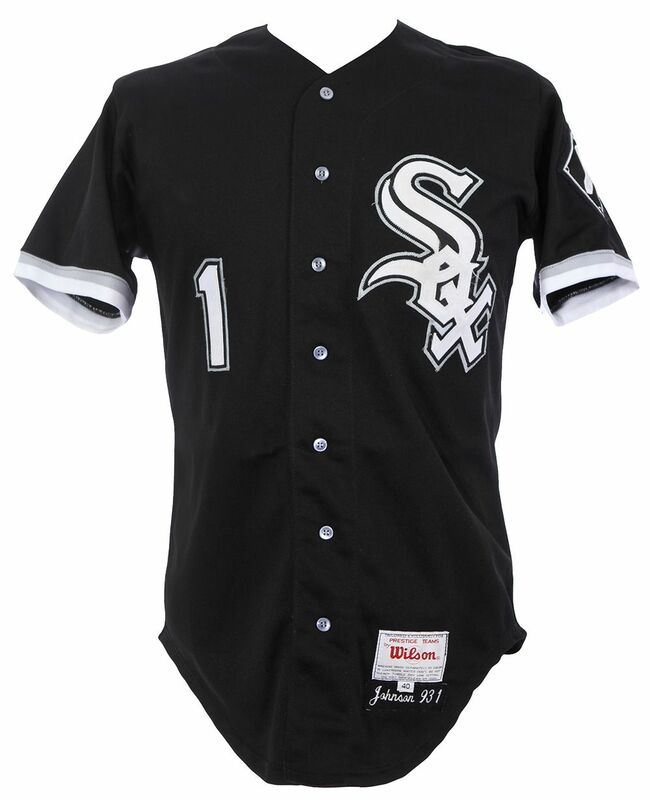 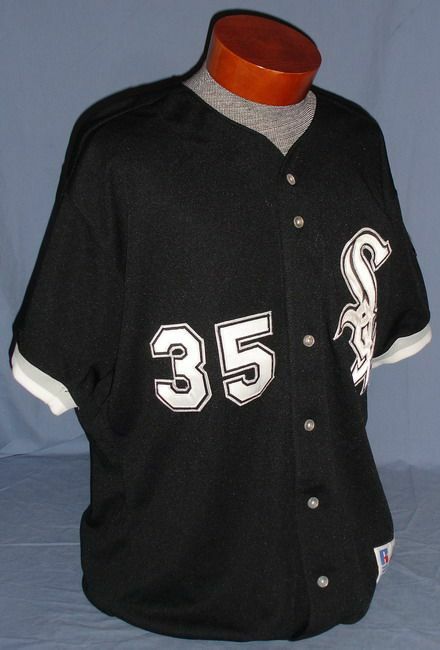 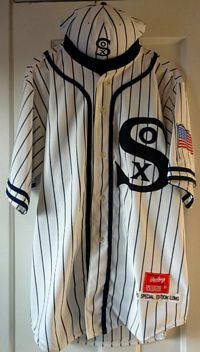 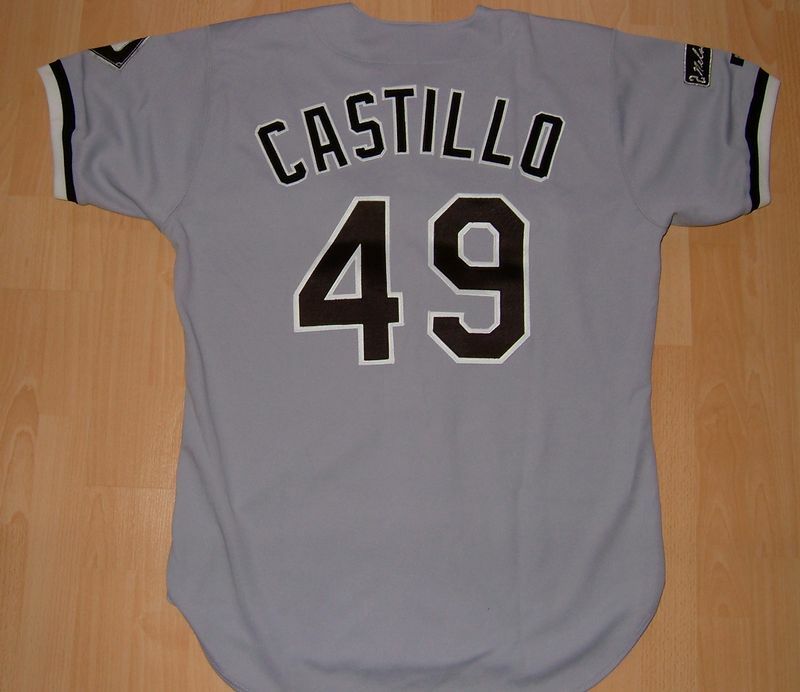 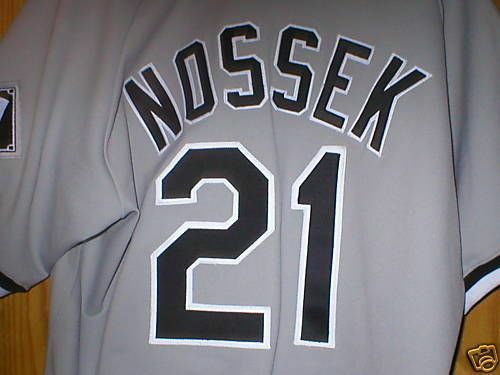 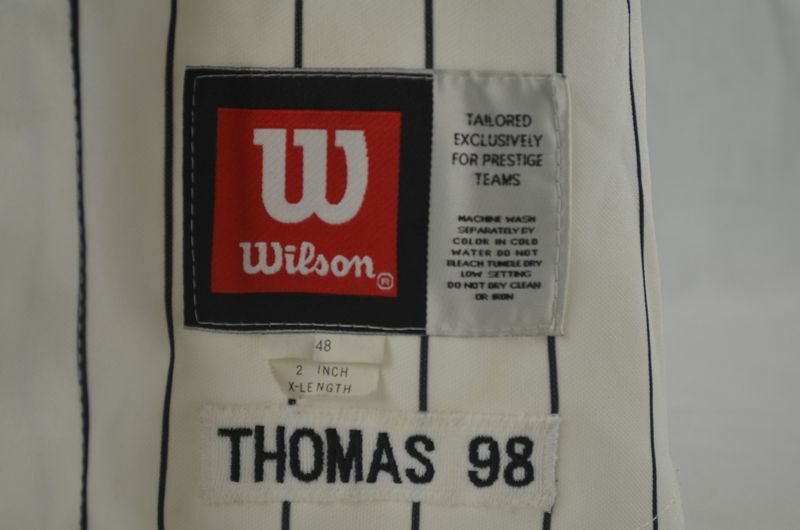 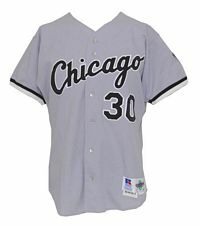 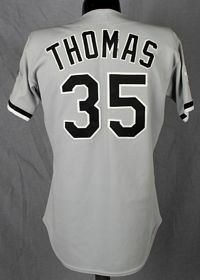 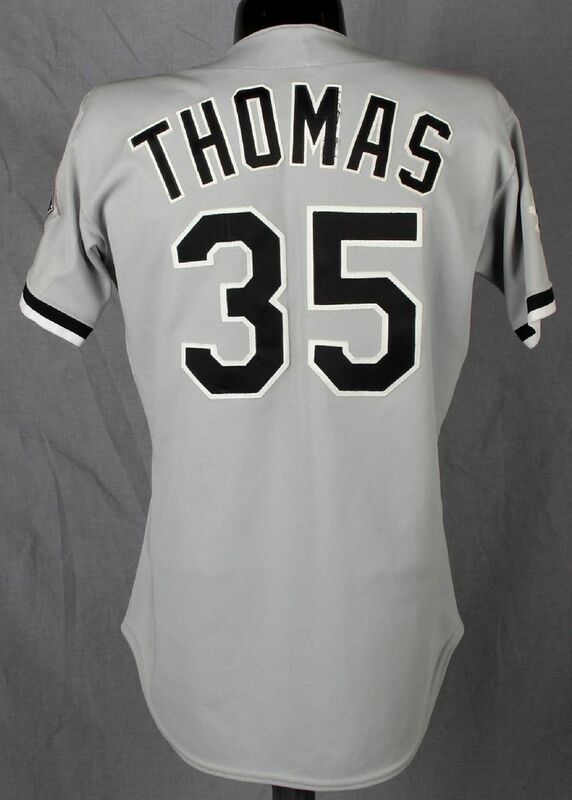 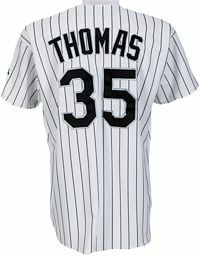 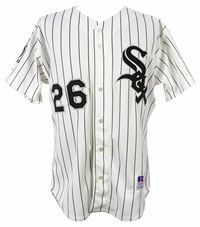 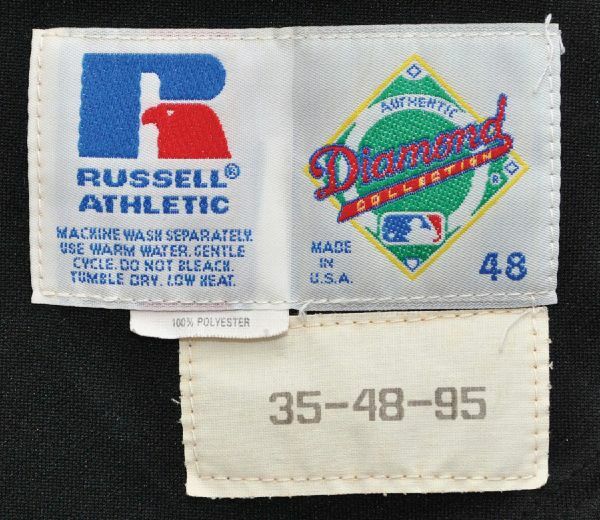 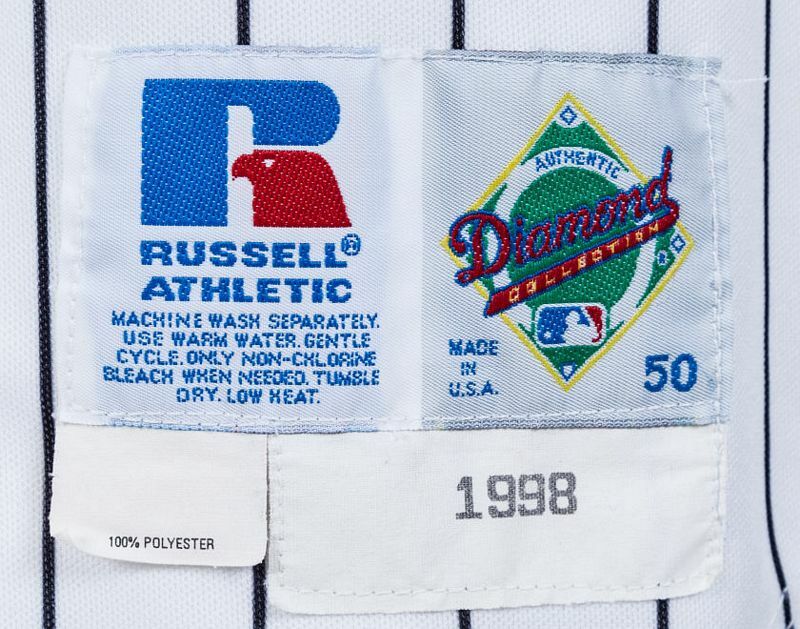 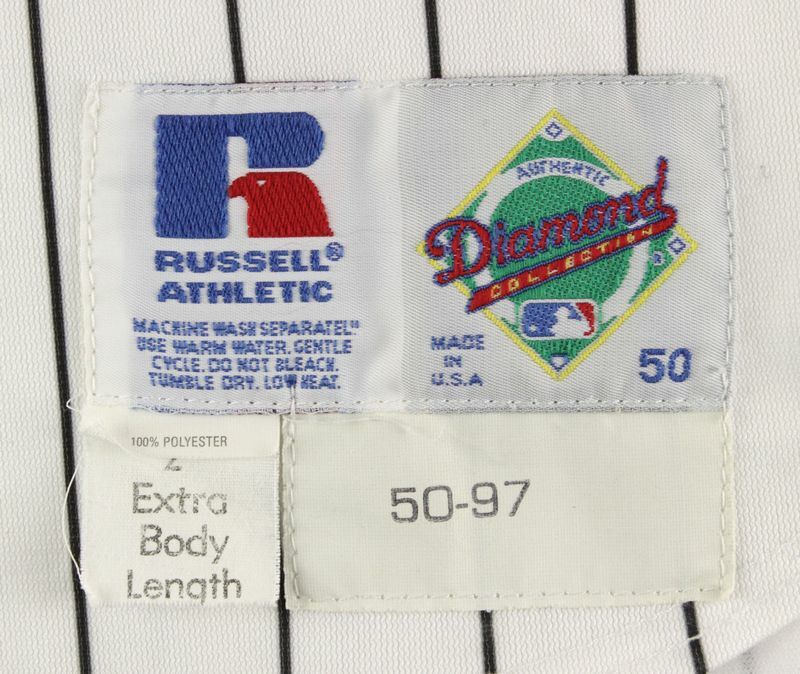 From 1992-98, the White Sox use both Russell and Wilson jerseys, letting players choose. I don't have them all here, so if you have one that I don't show, please send pics! 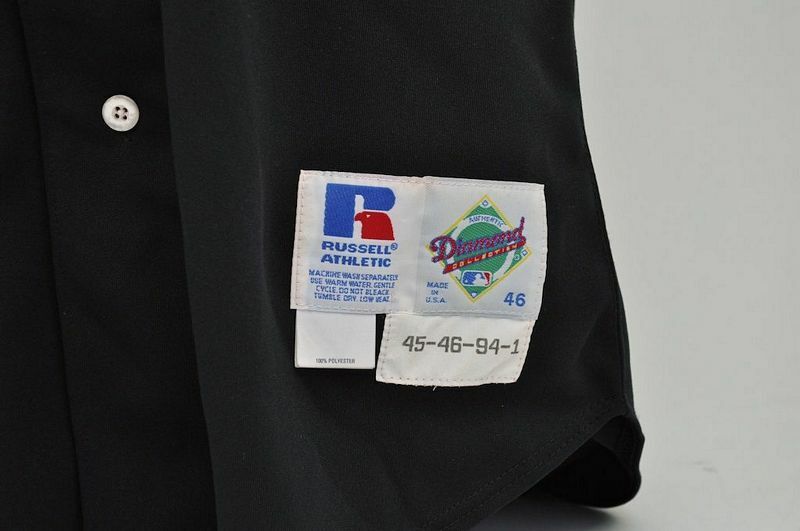 Sleeve cuffs added to black alternate. 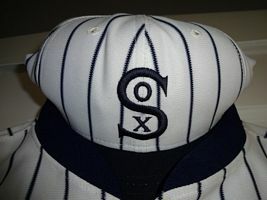 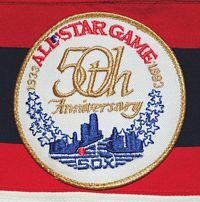 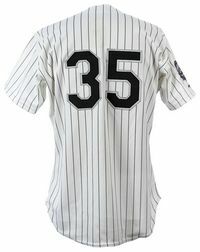 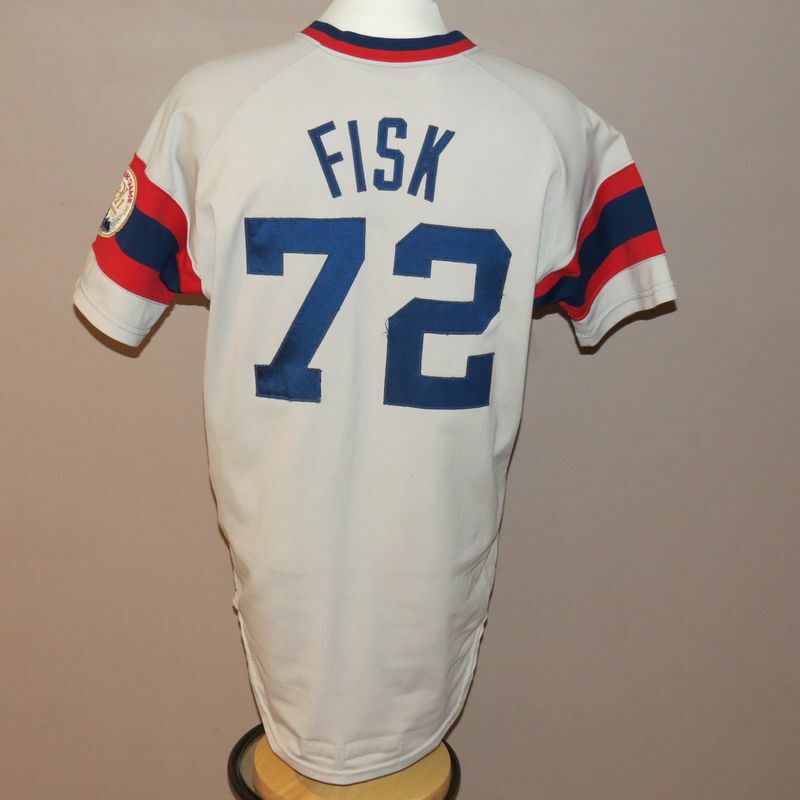 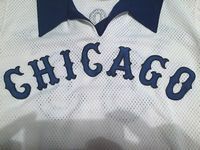 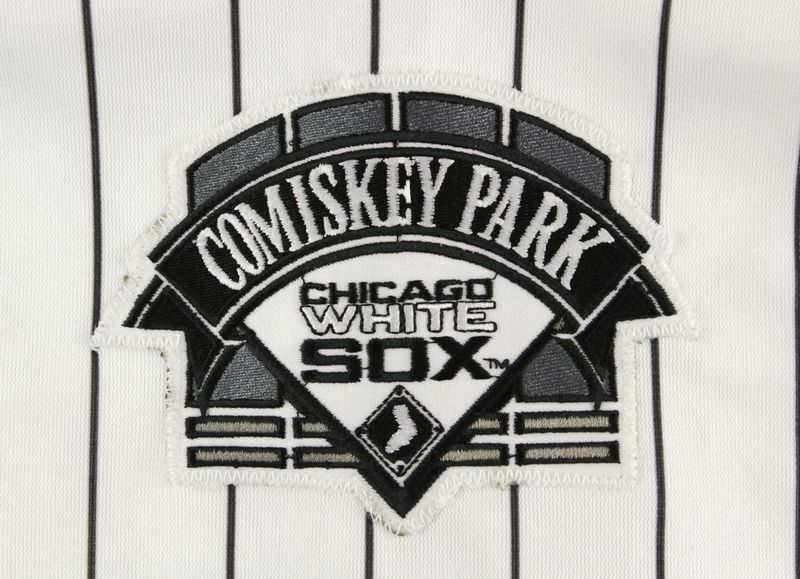 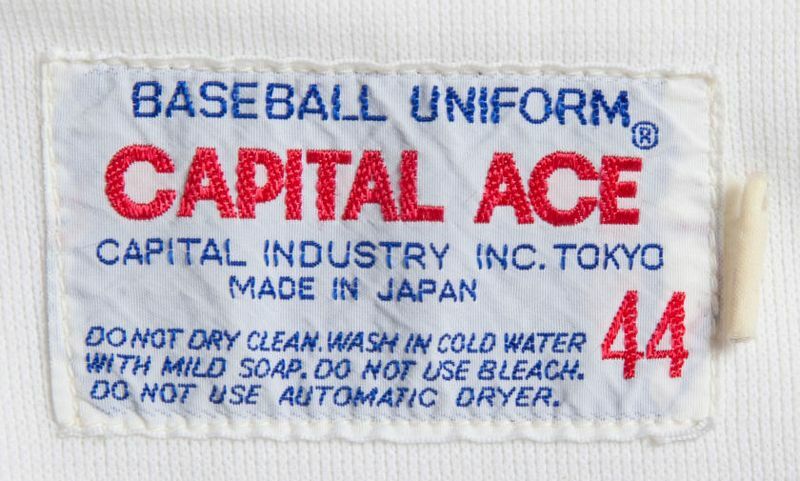 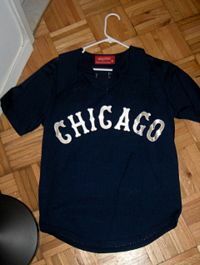 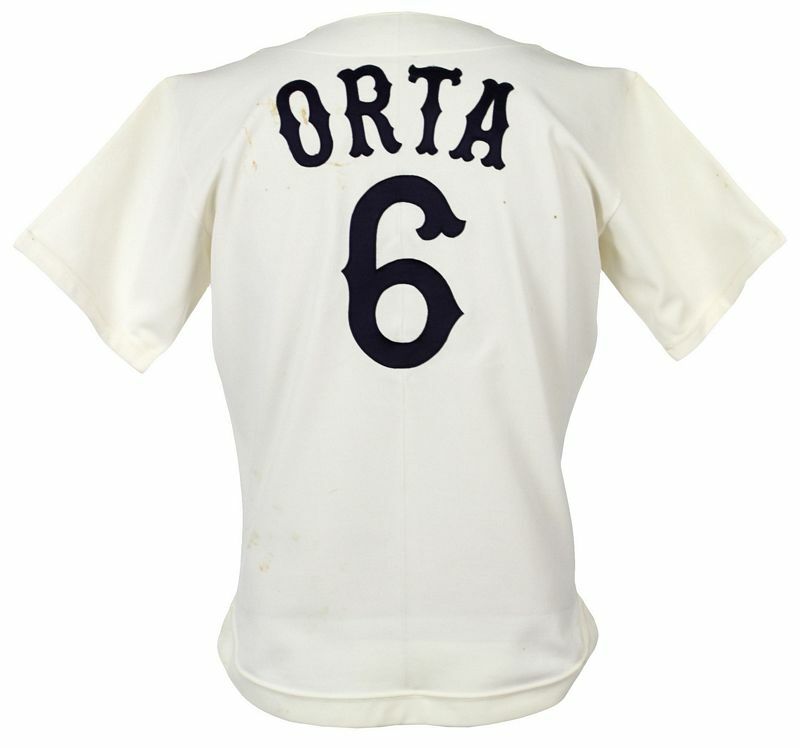 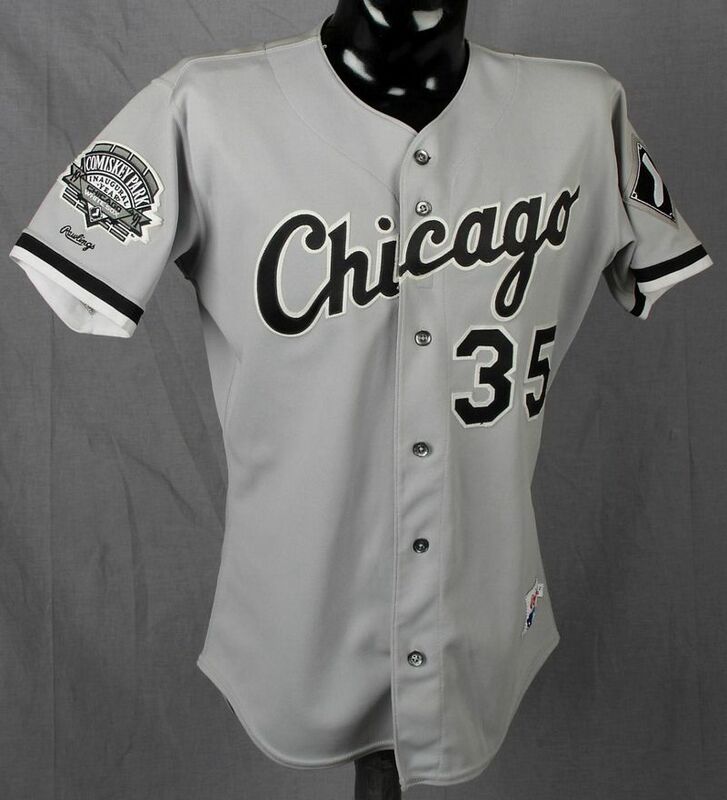 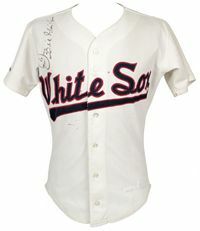 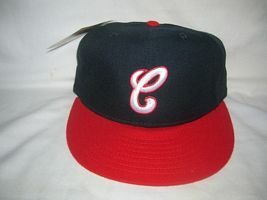 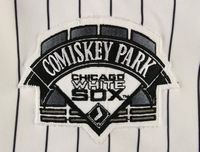 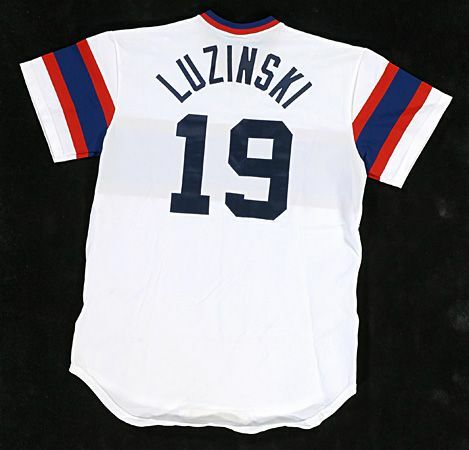 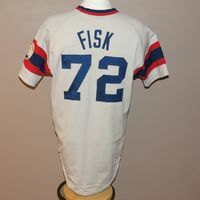 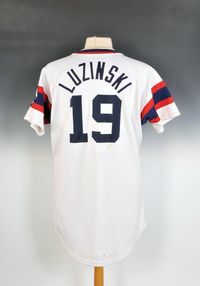 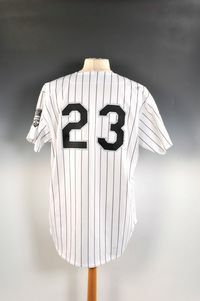 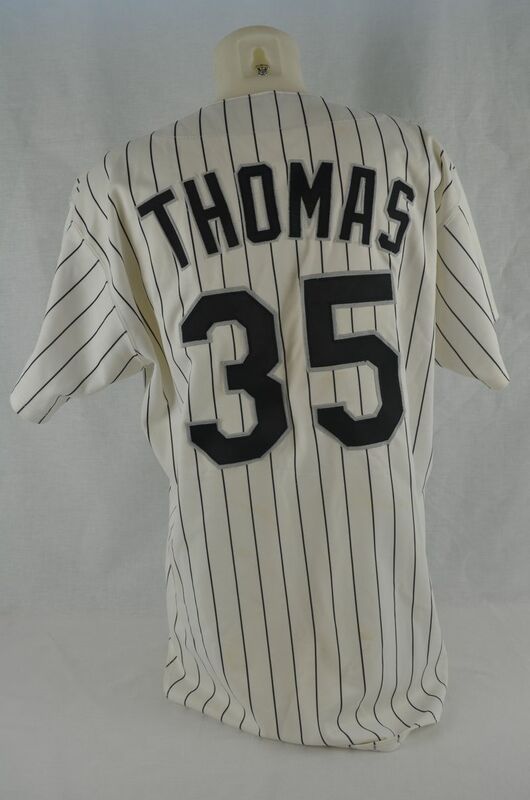 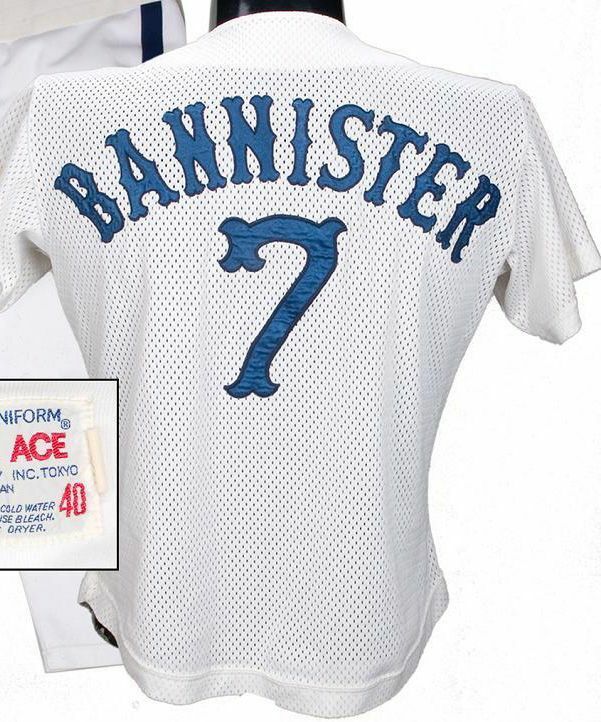 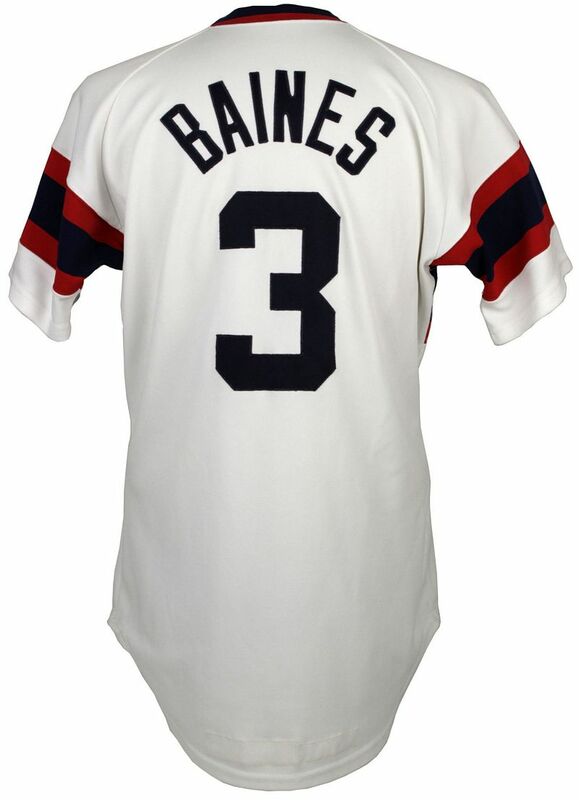 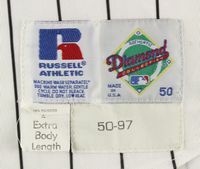 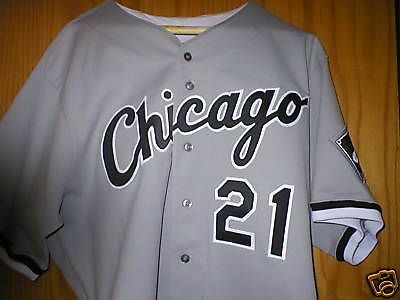 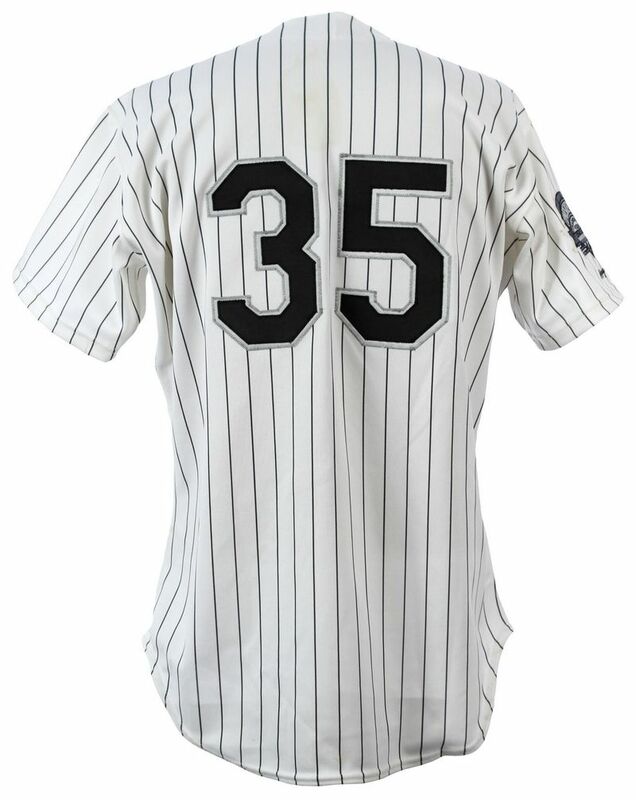 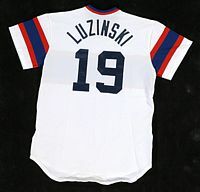 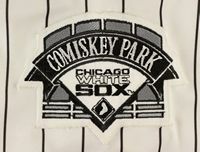 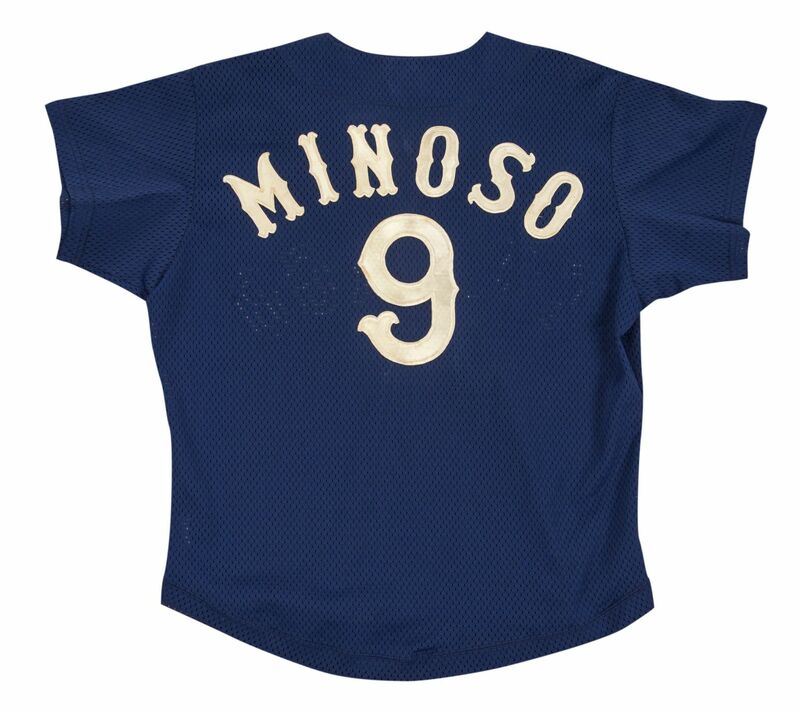 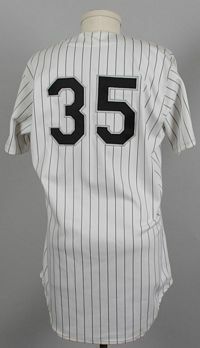 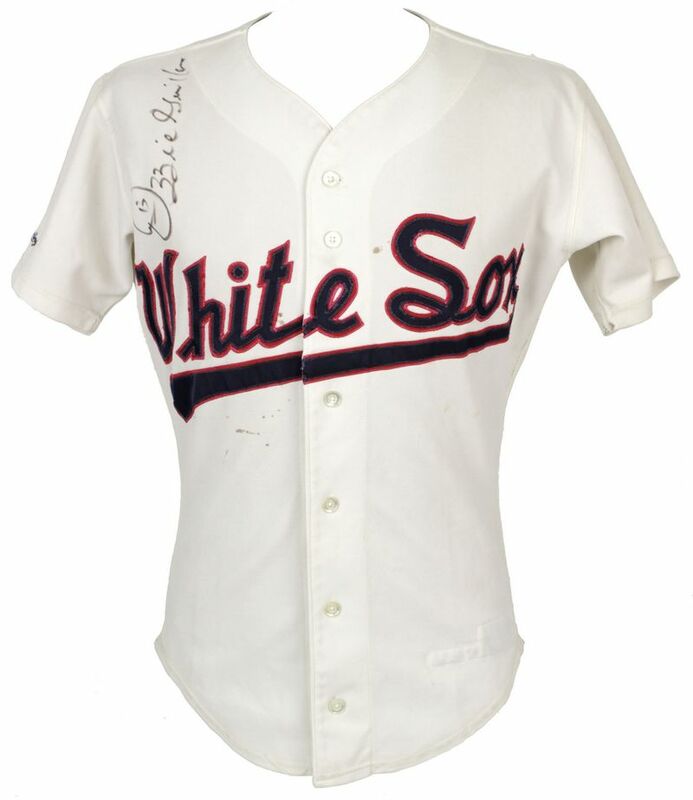 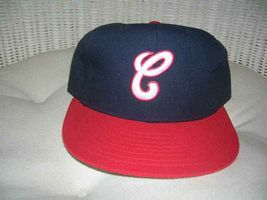 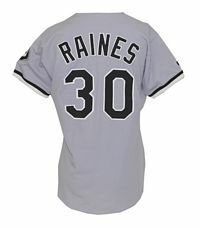 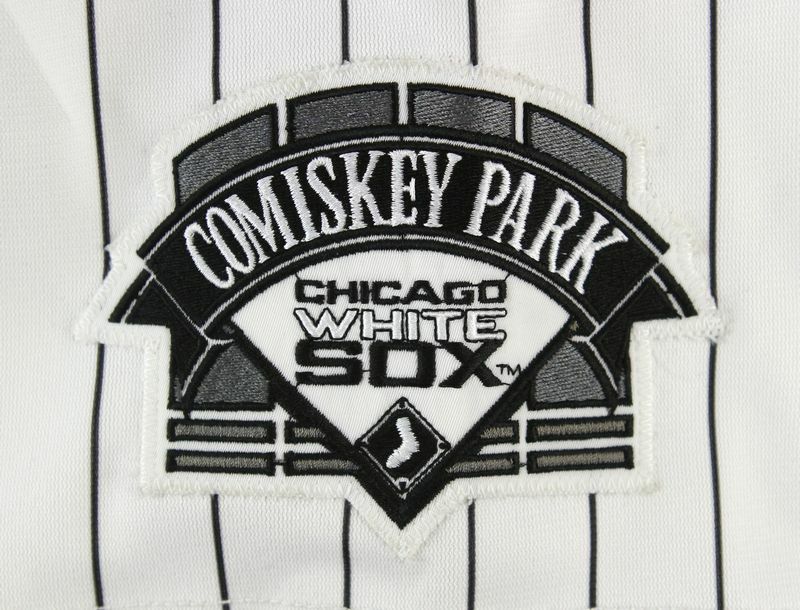 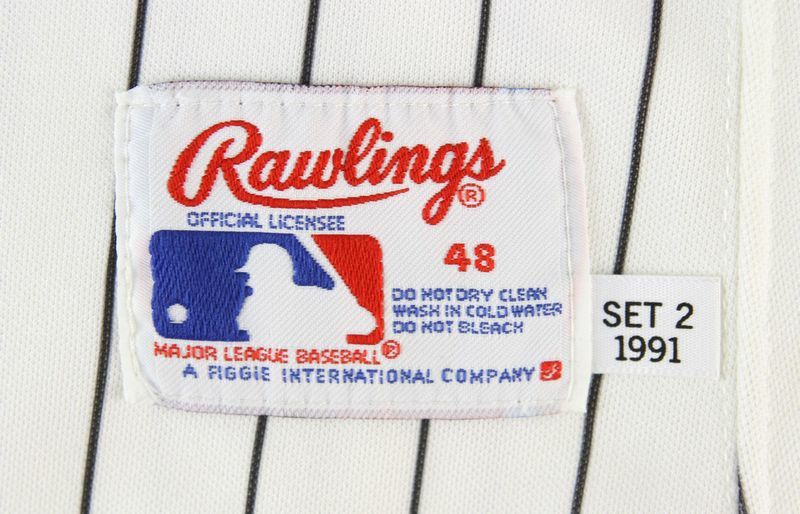 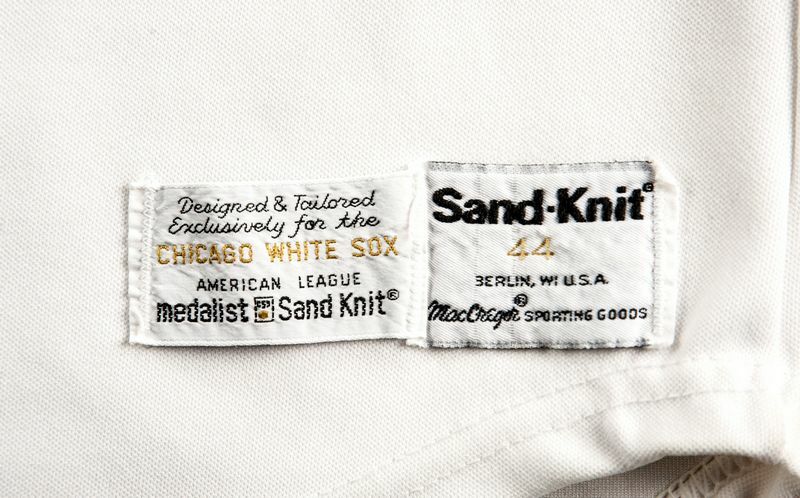 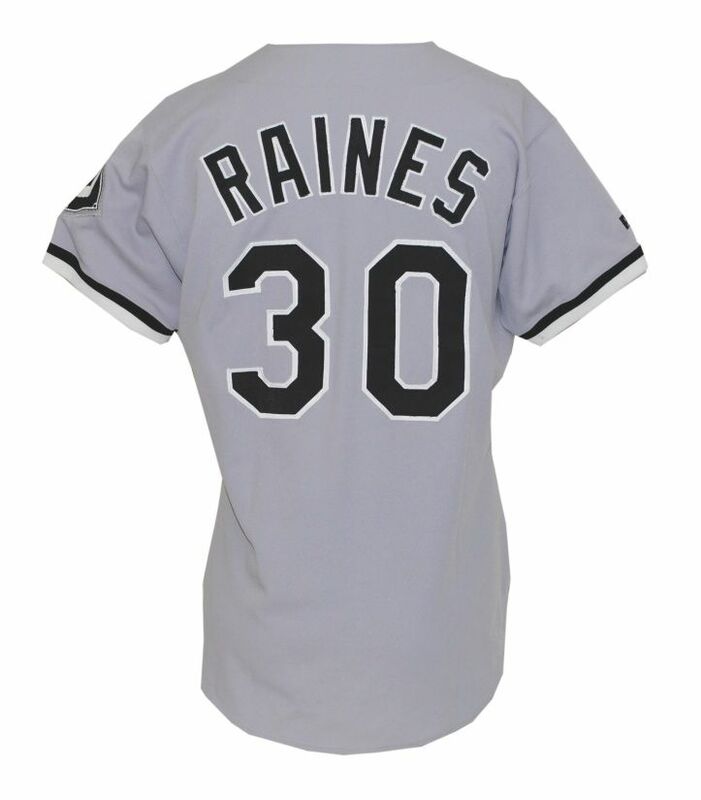 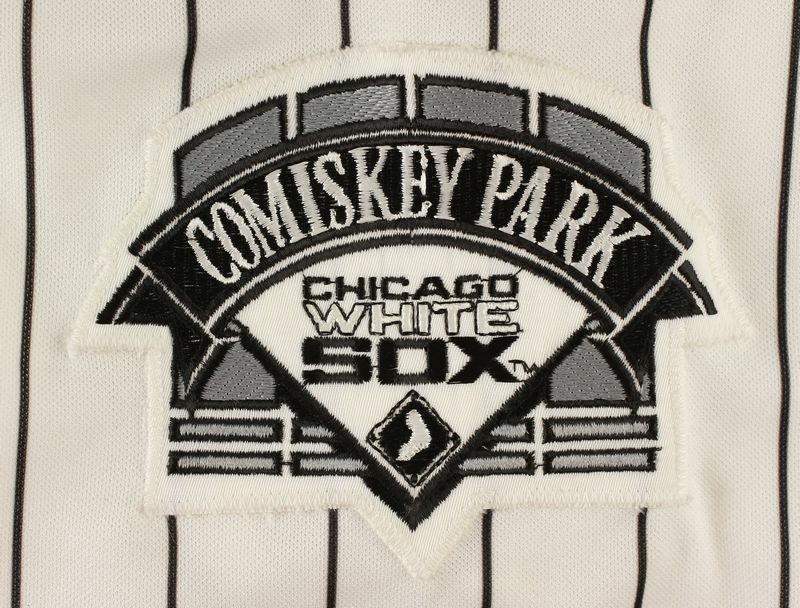 Comiskey Park sleeve patch added on home jersey. 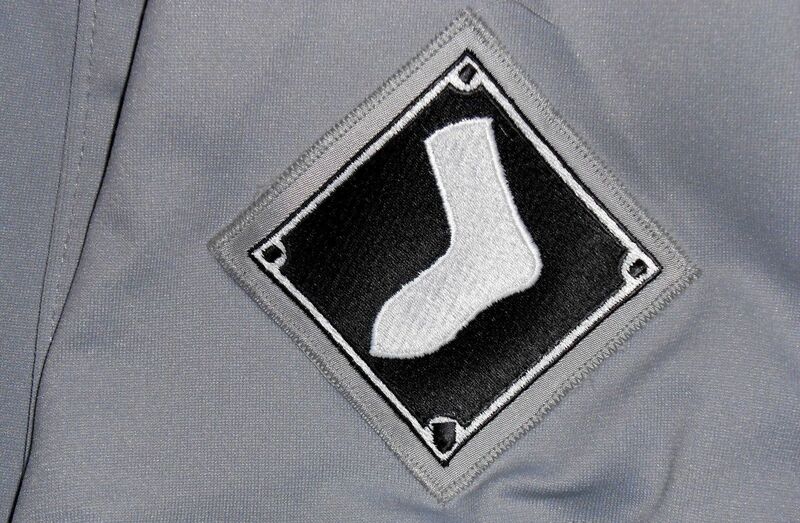 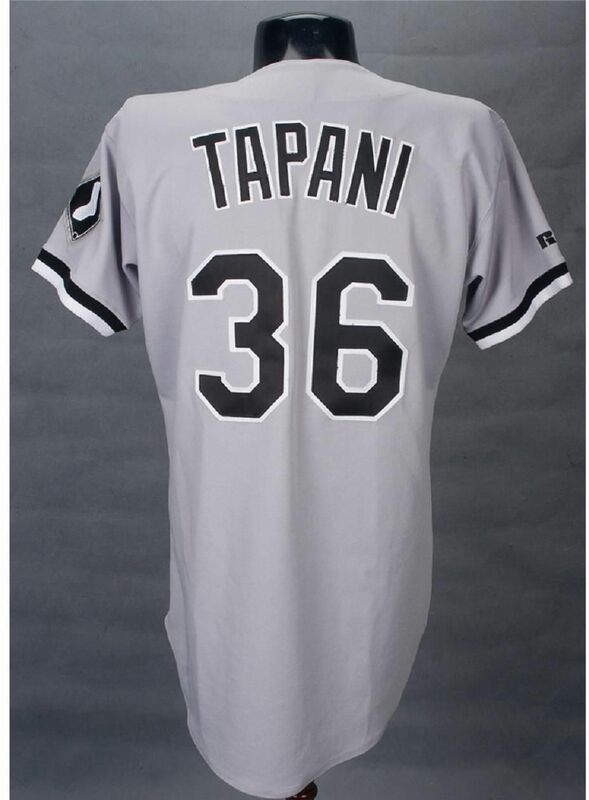 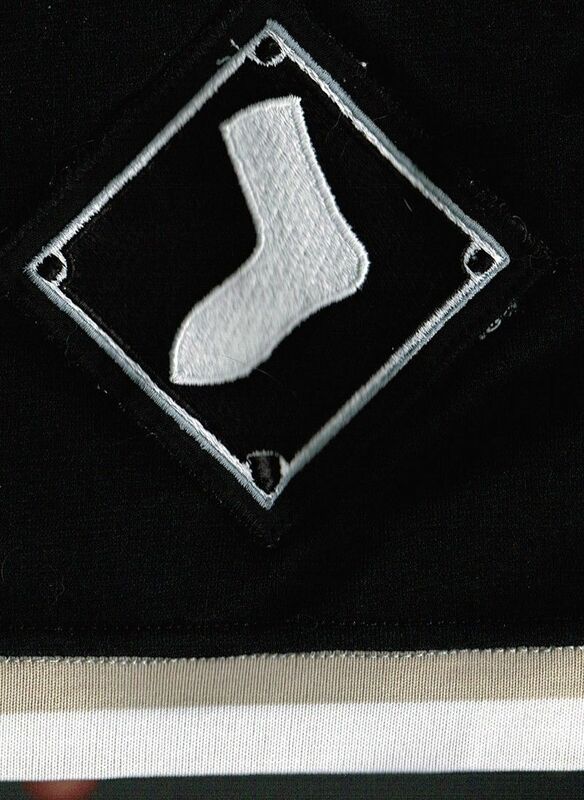 Alternate jersey lettering gets an outline and the sock sleeve patch is added. 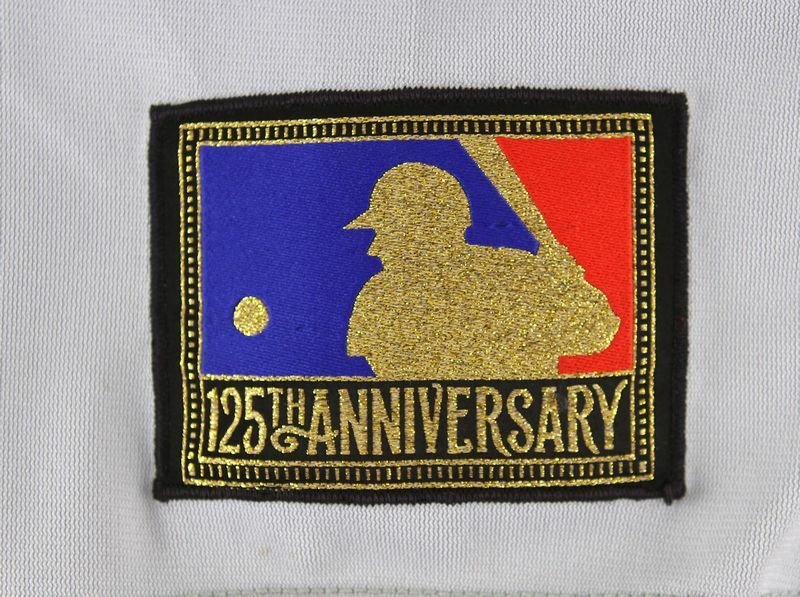 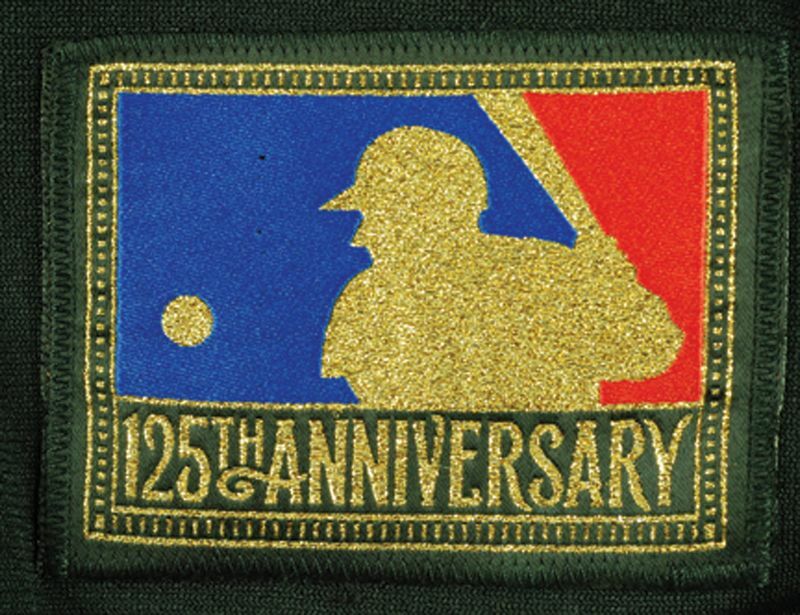 MLB 125th Anniversary sleeve patch on right. 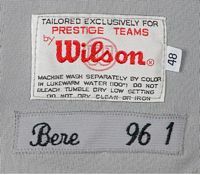 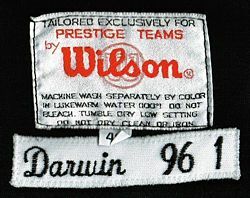 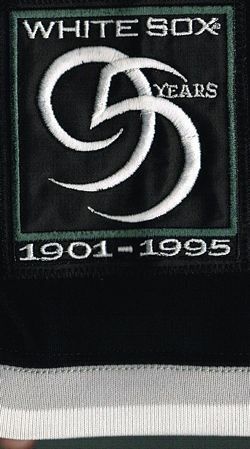 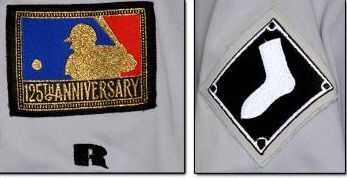 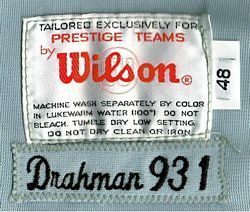 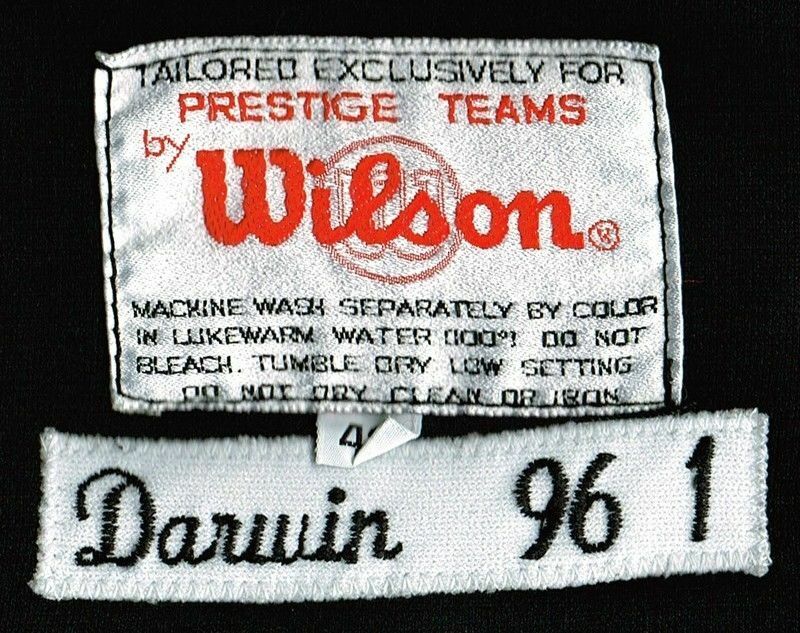 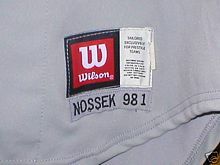 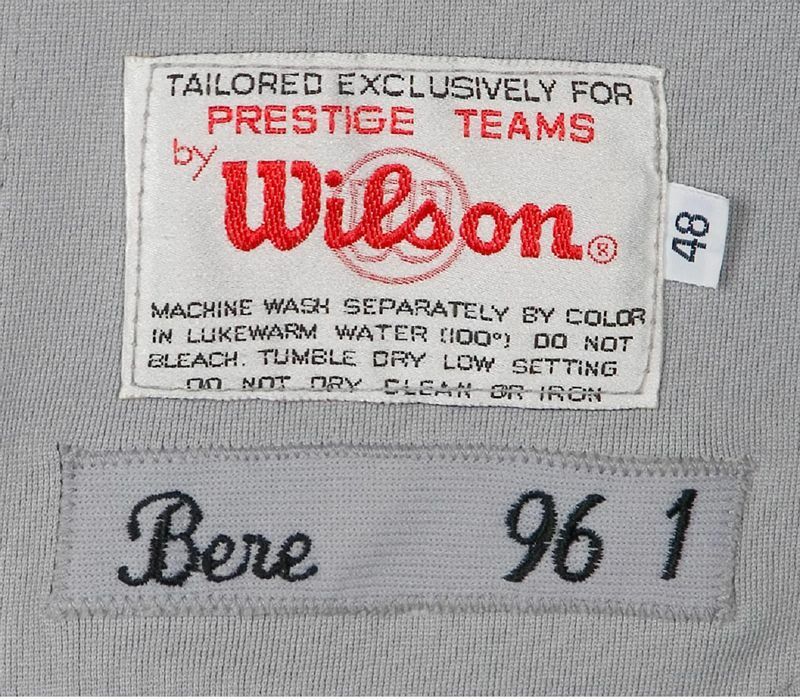 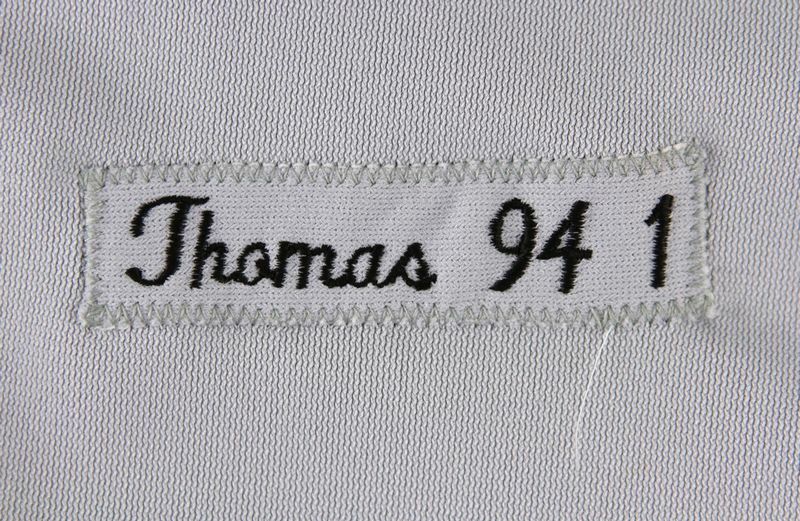 95th anniversary patch on right sleeve. 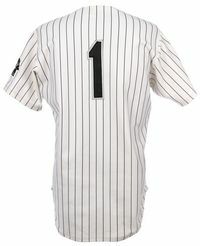 NOB added to home jersey. 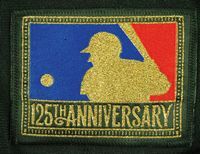 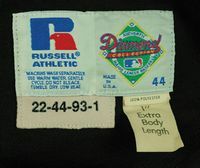 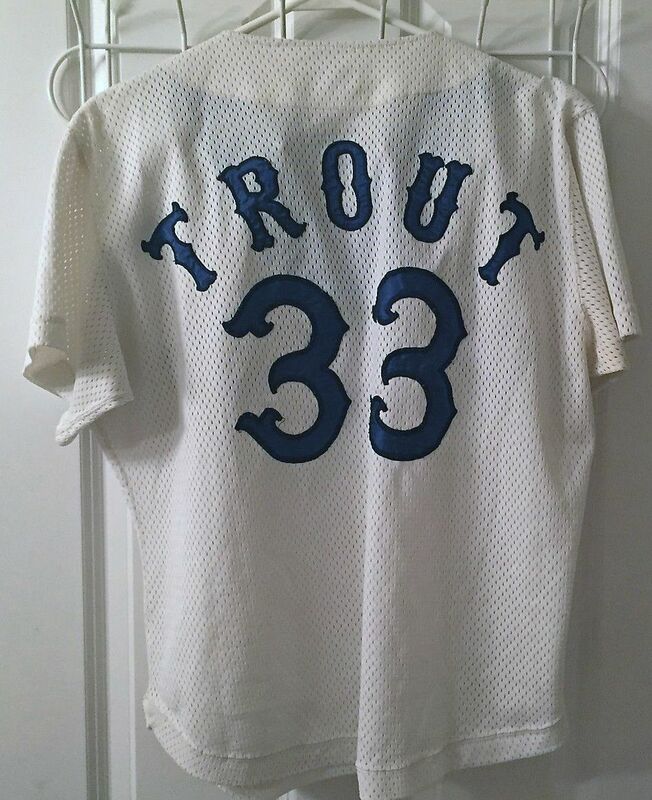 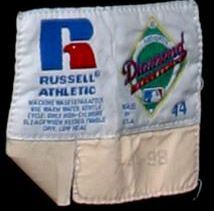 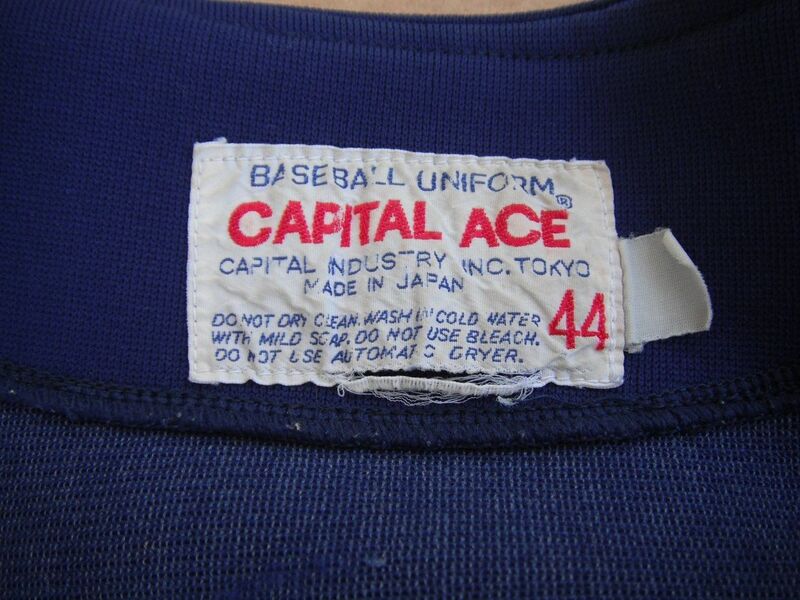 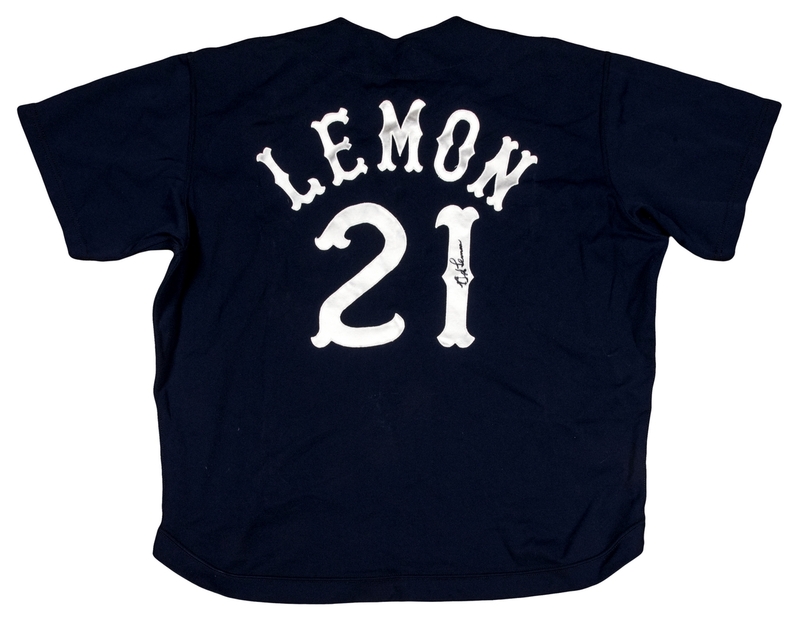 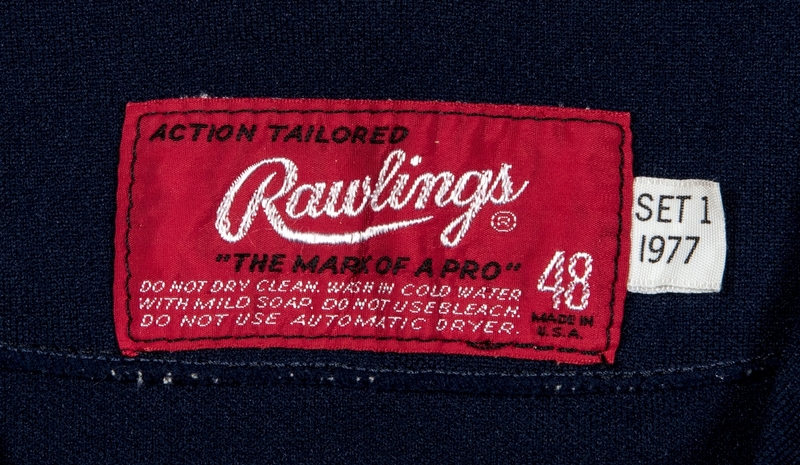 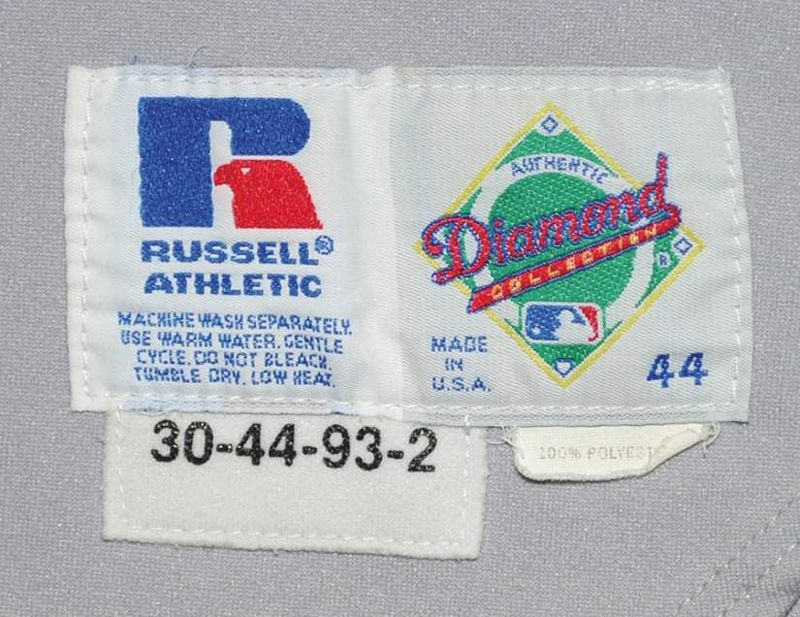 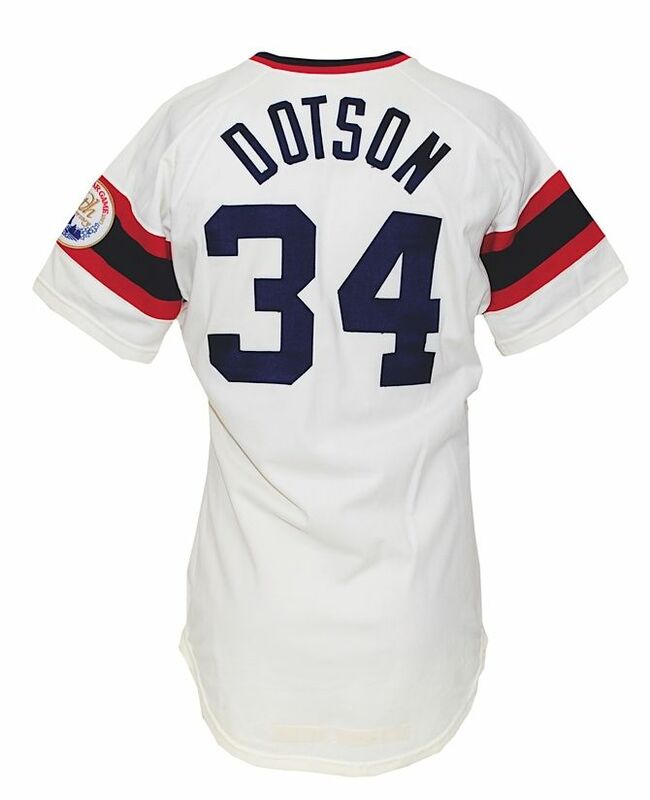 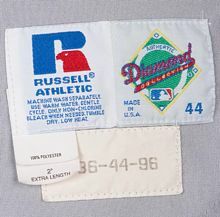 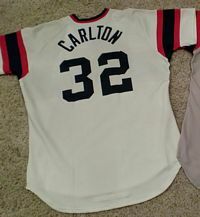 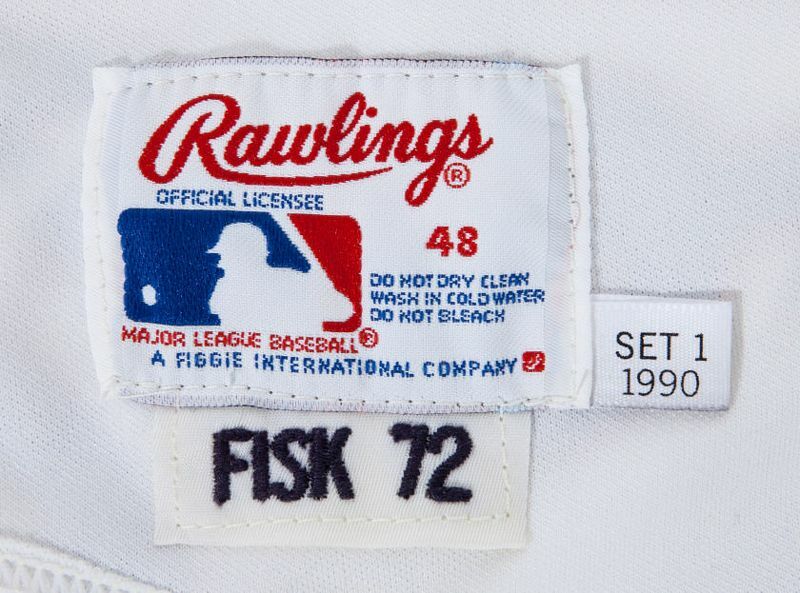 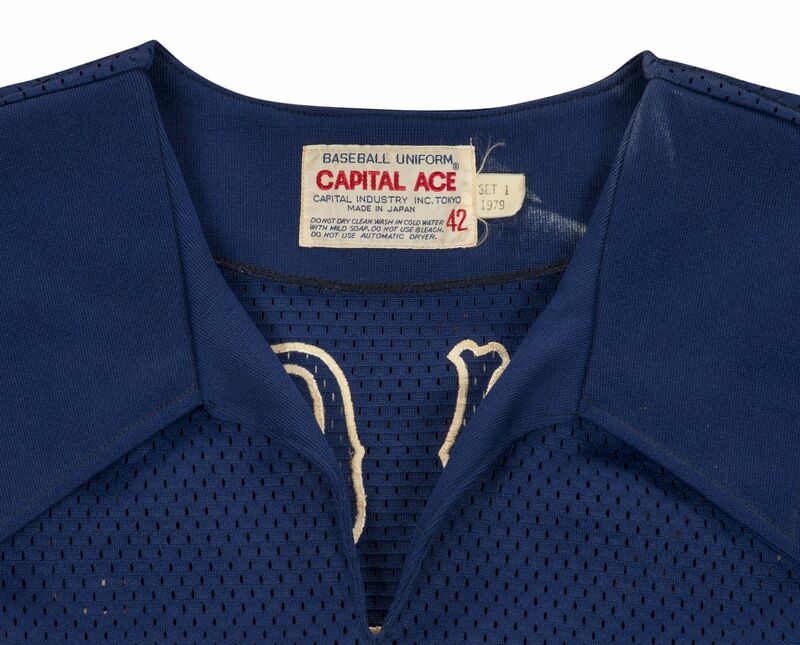 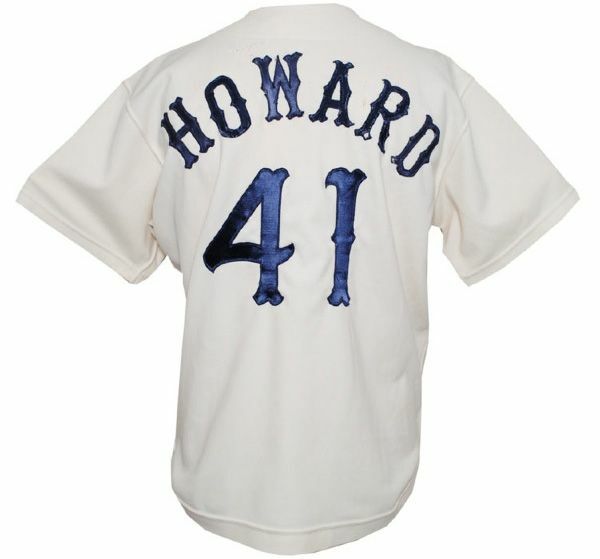 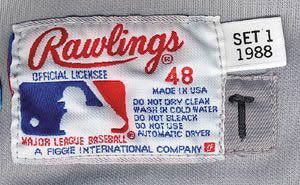 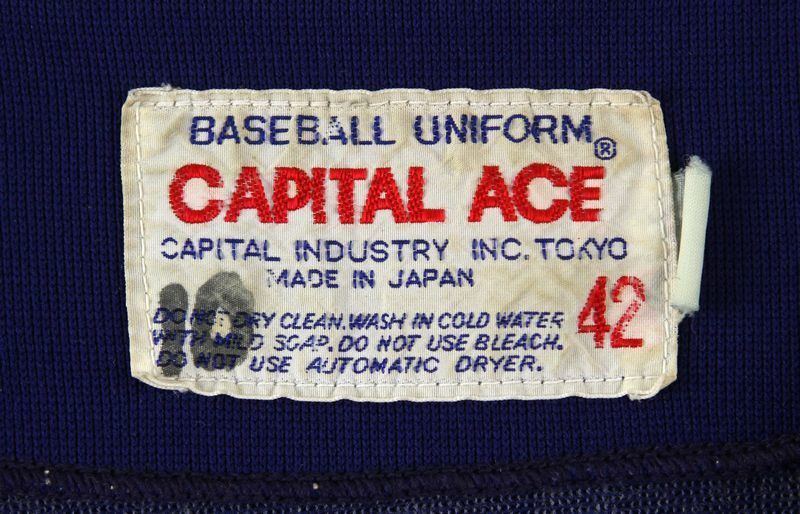 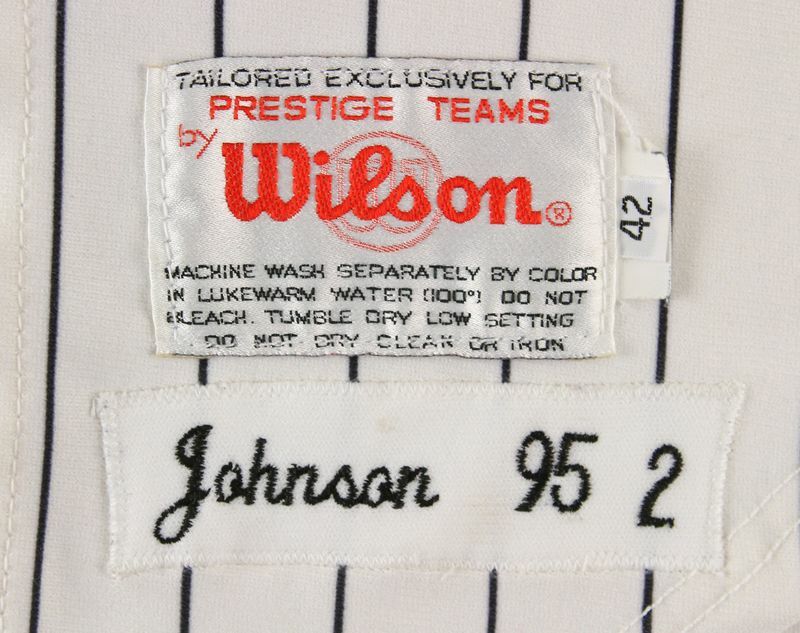 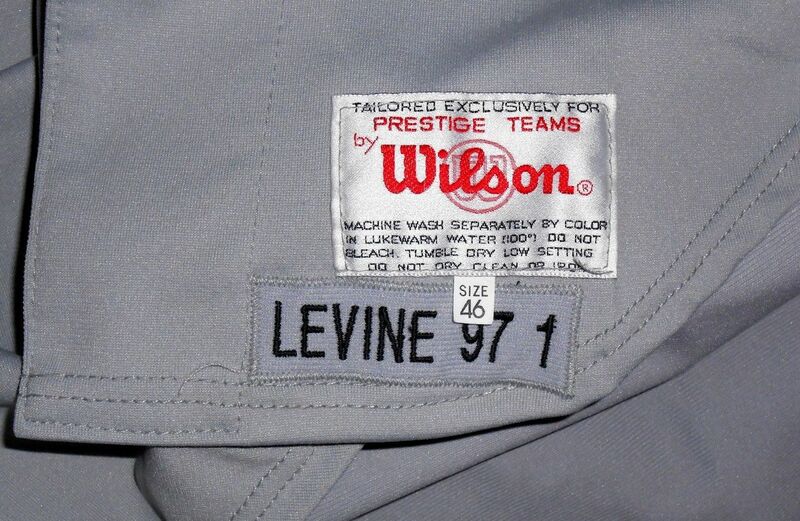 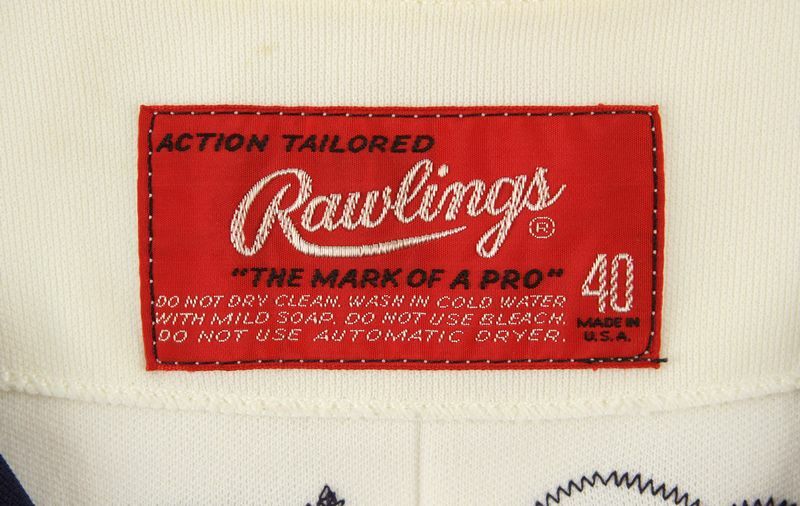 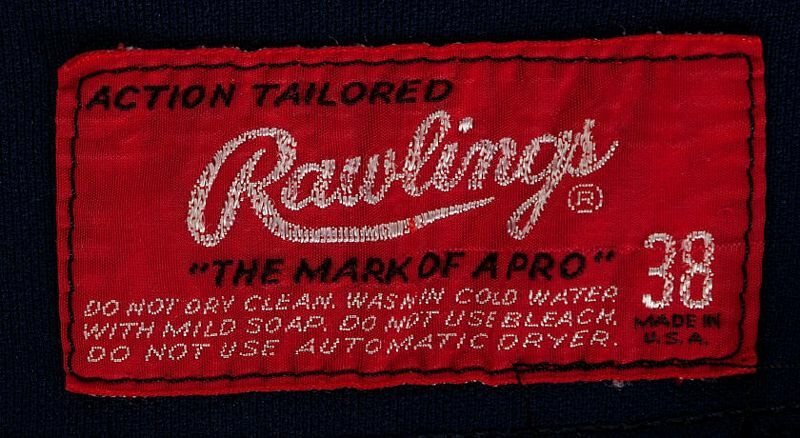 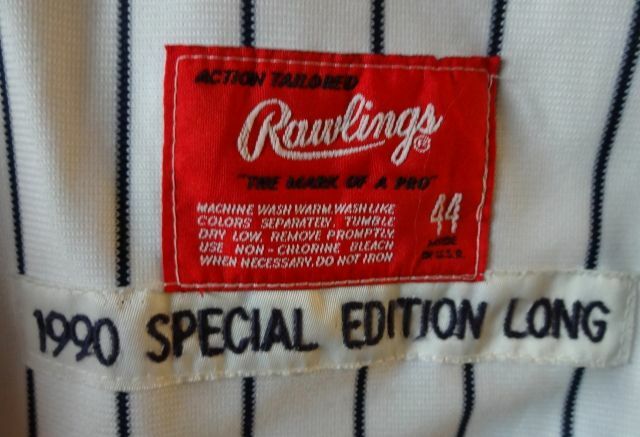 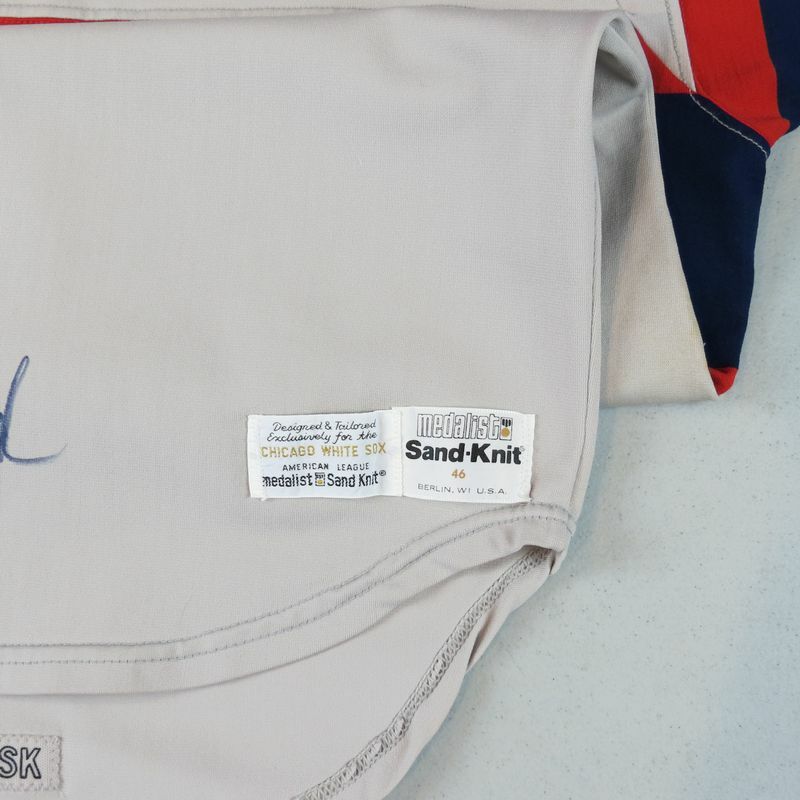 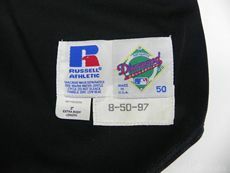 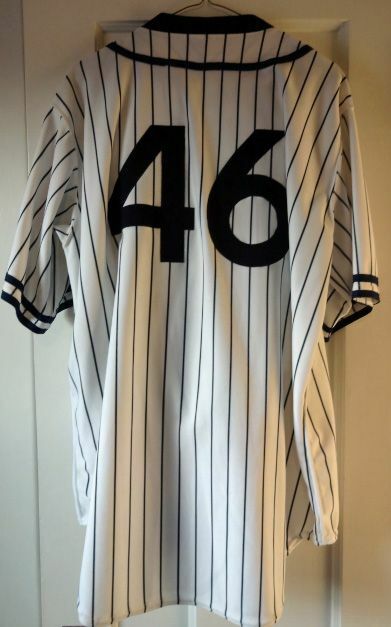 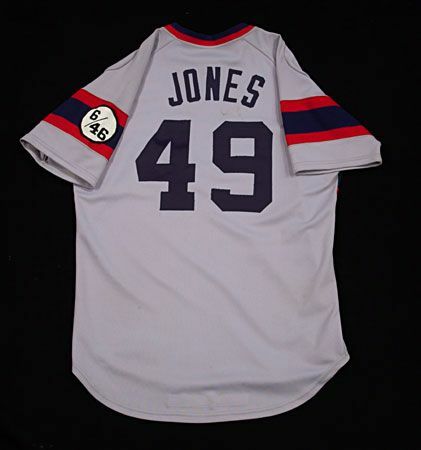 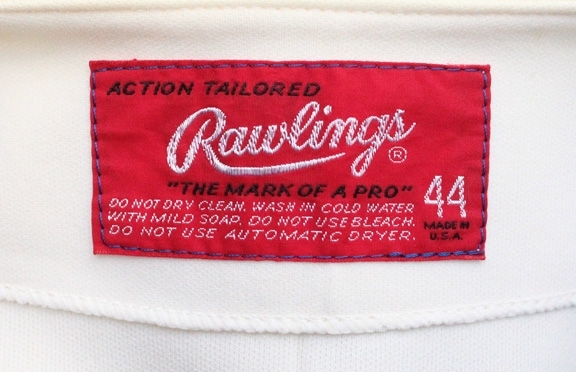 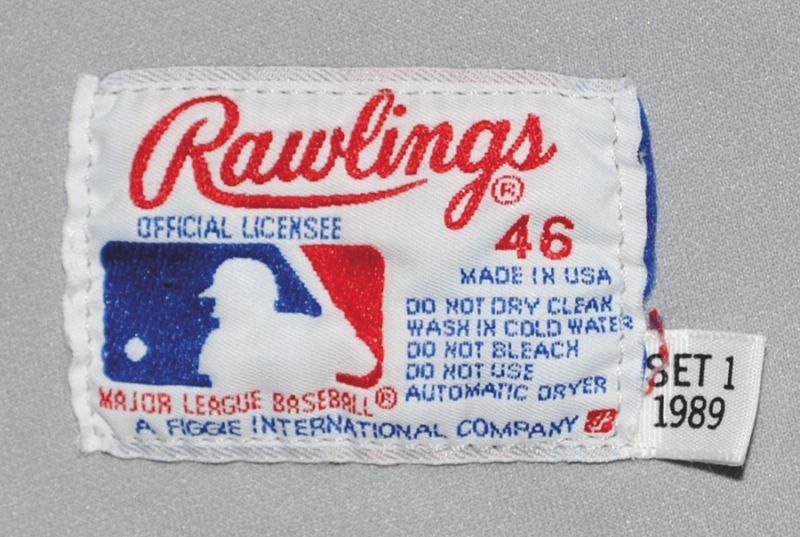 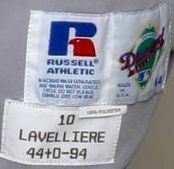 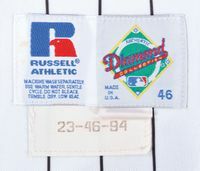 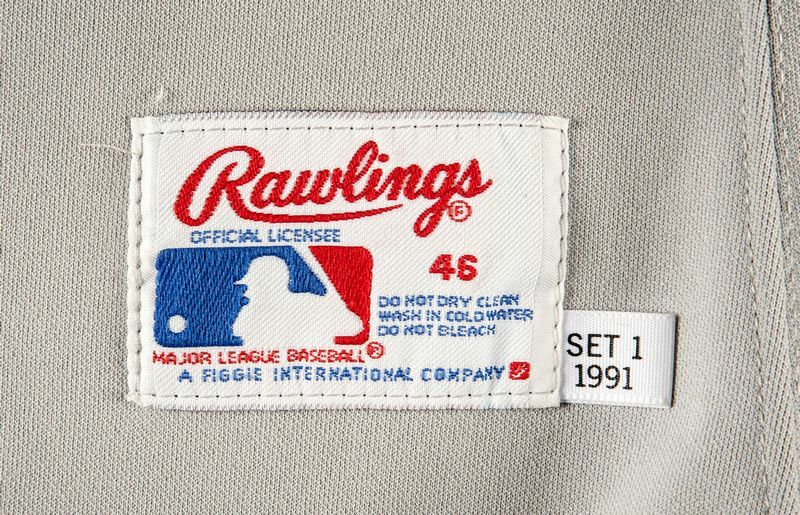 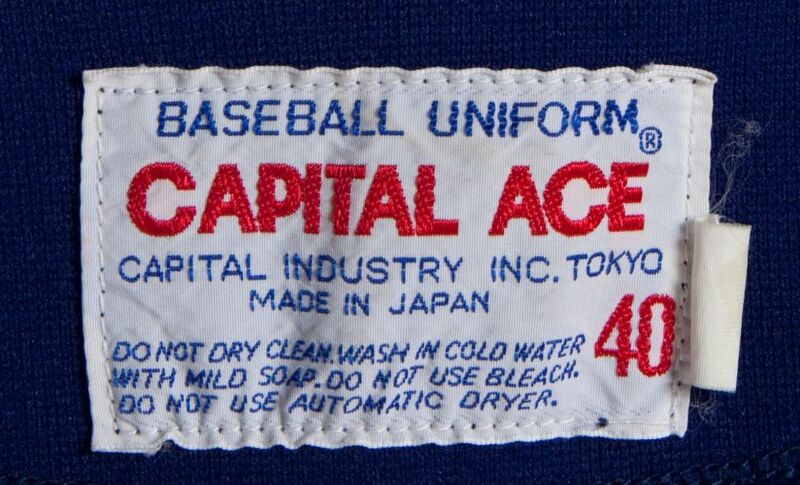 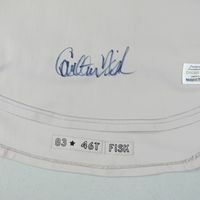 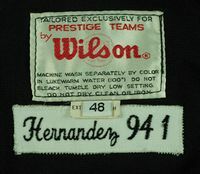 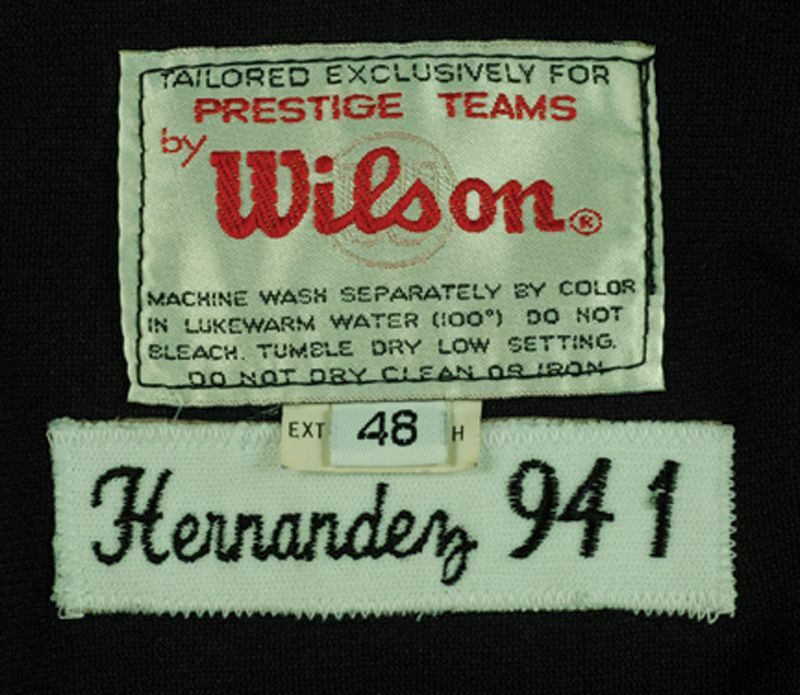 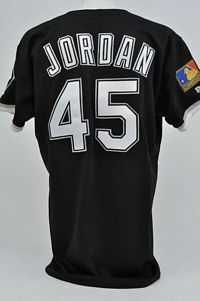 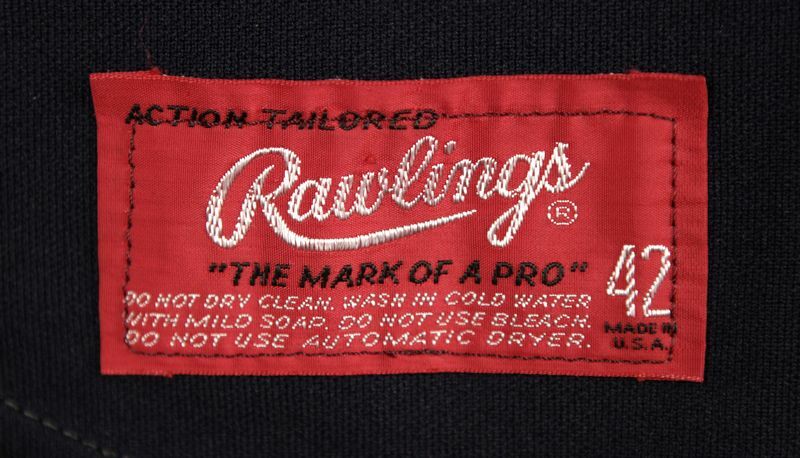 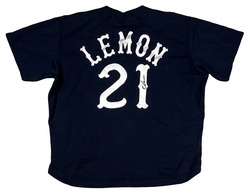 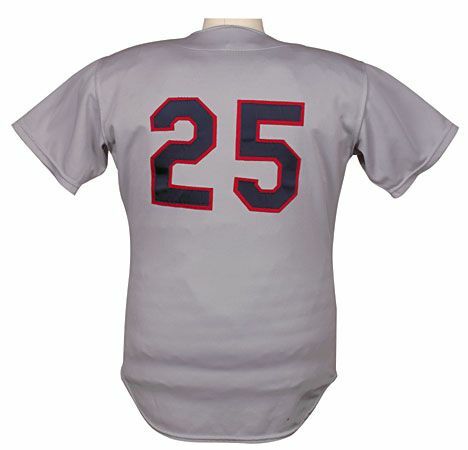 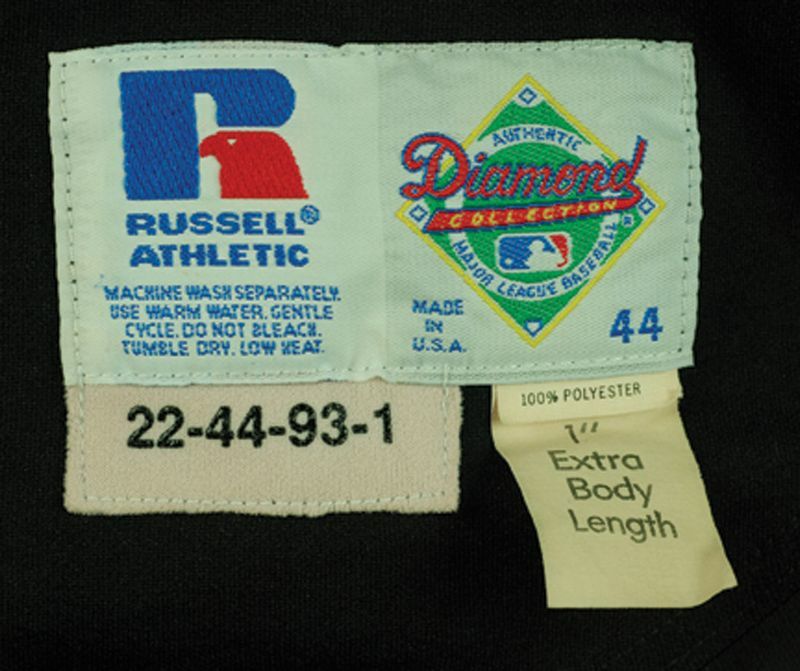 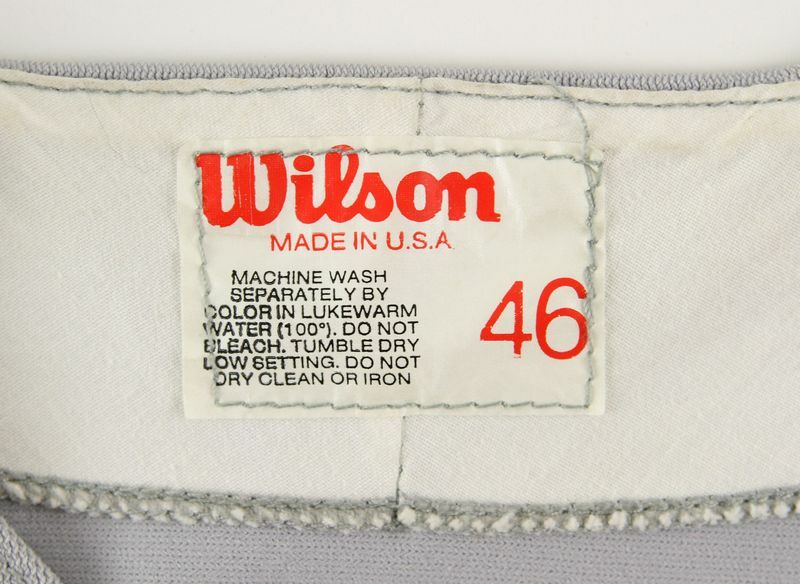 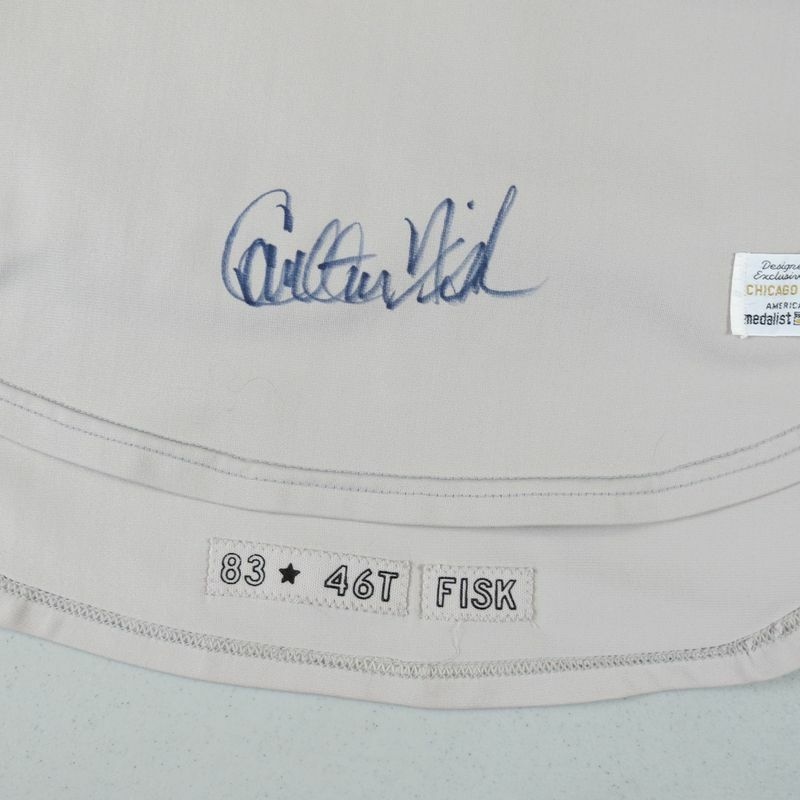 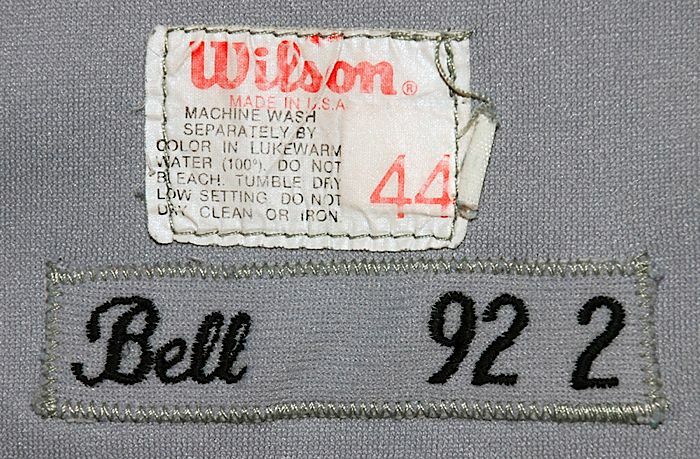 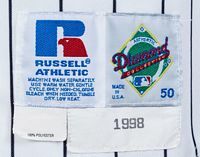 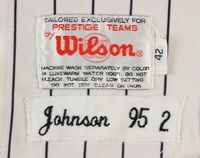 Jackie Robinson patch worn on 1997 home jersey. 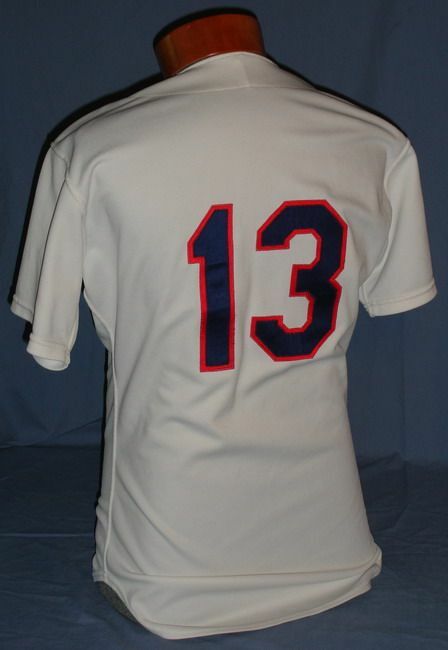 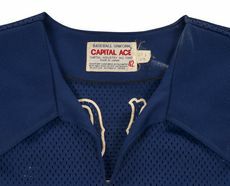 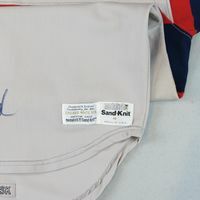 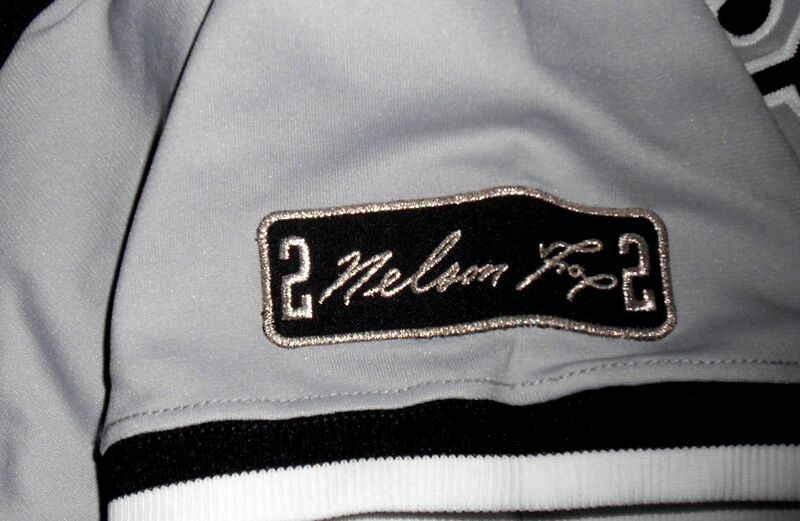 Nellie Fox patch is on the 1997 road and alternate jerseys.